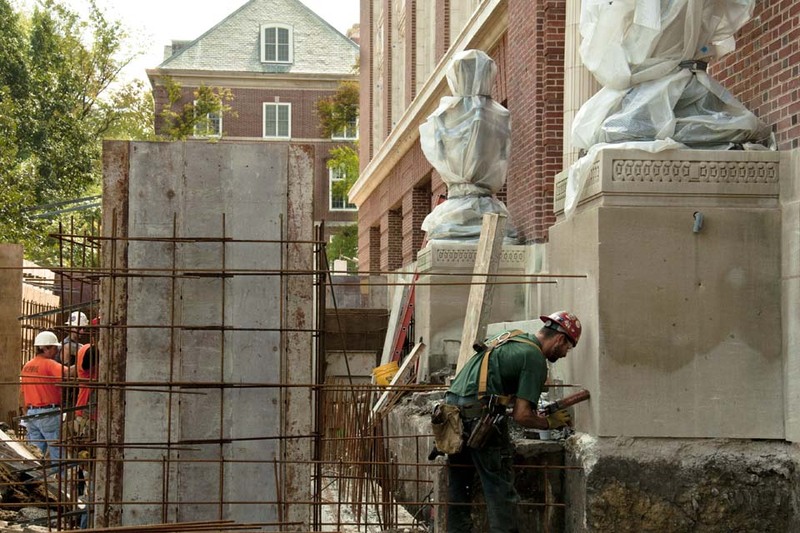 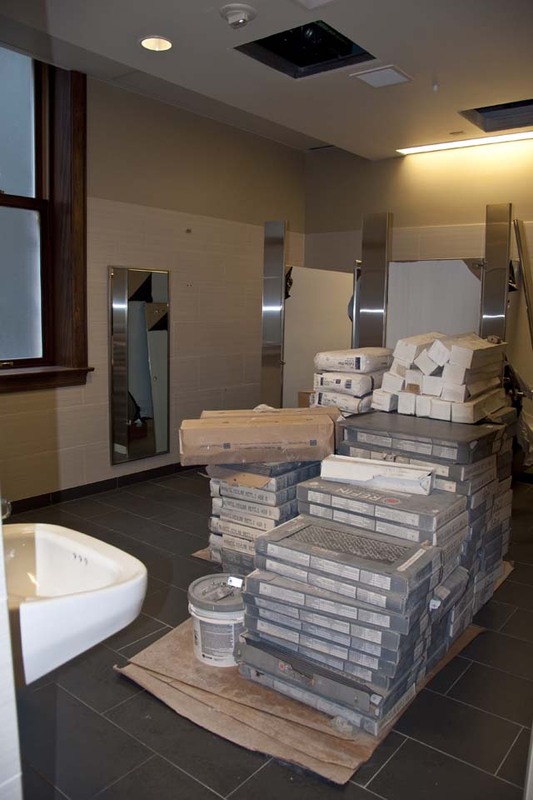 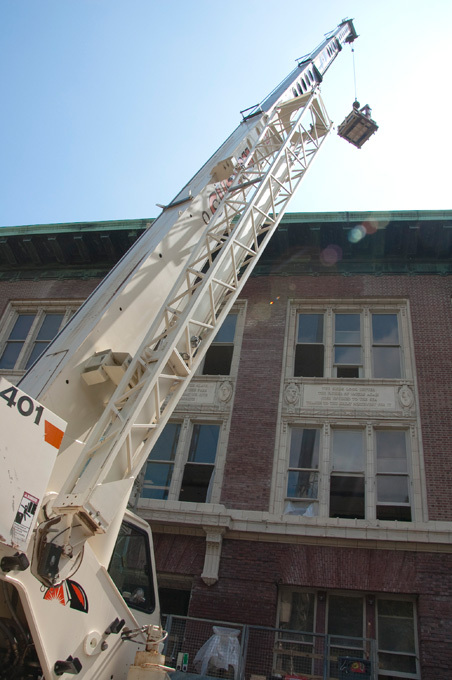 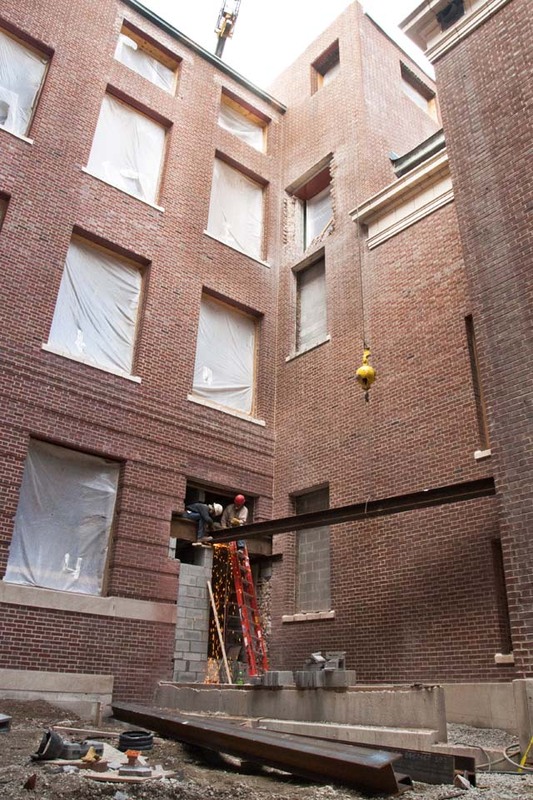 Photos with brief progress reports showcase Lincoln Hall as it moved through various construction phases. 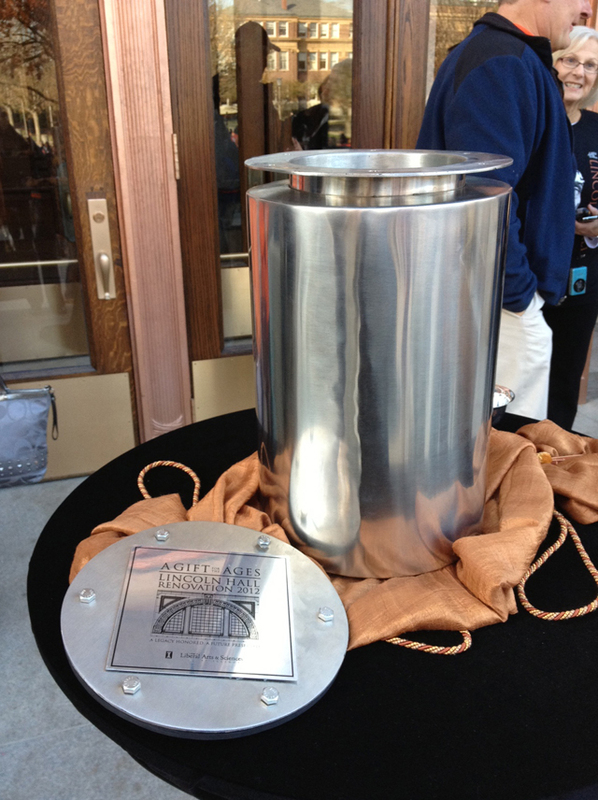 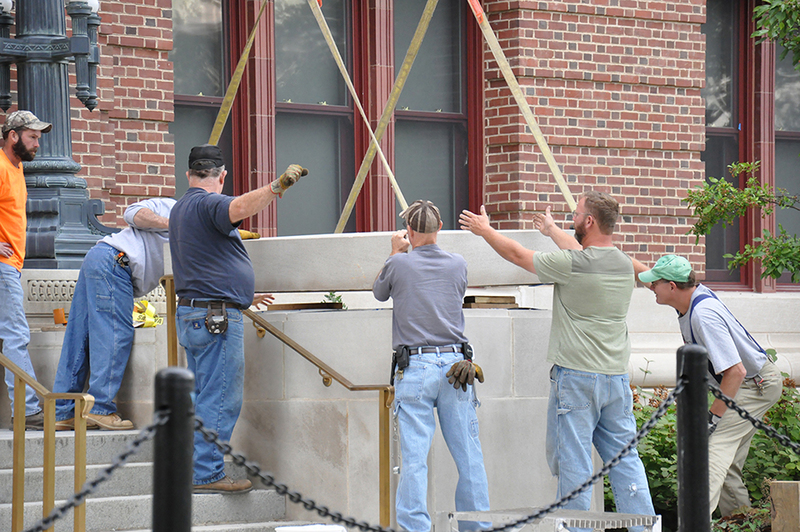 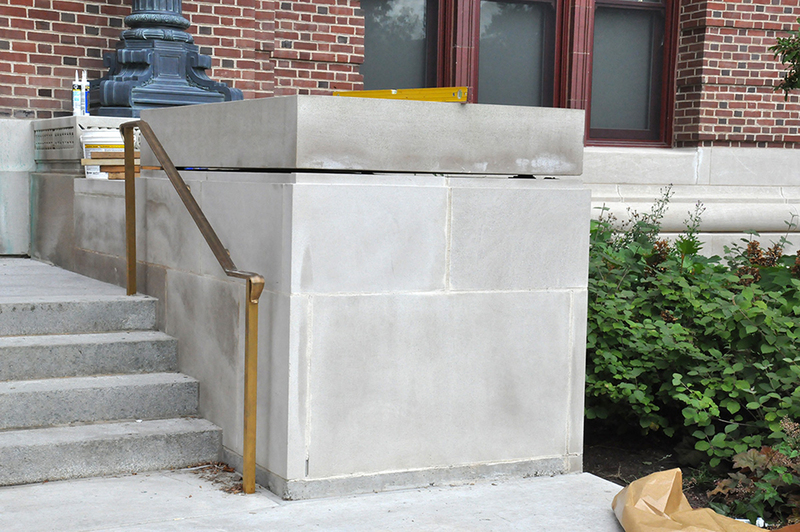 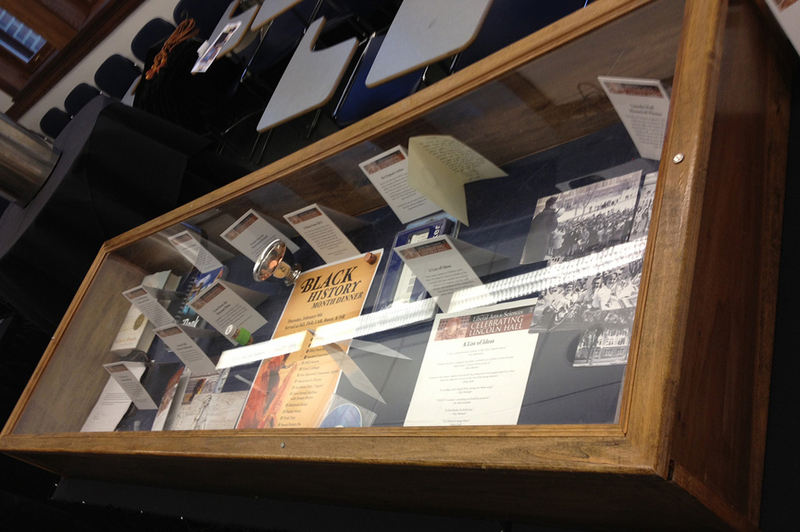 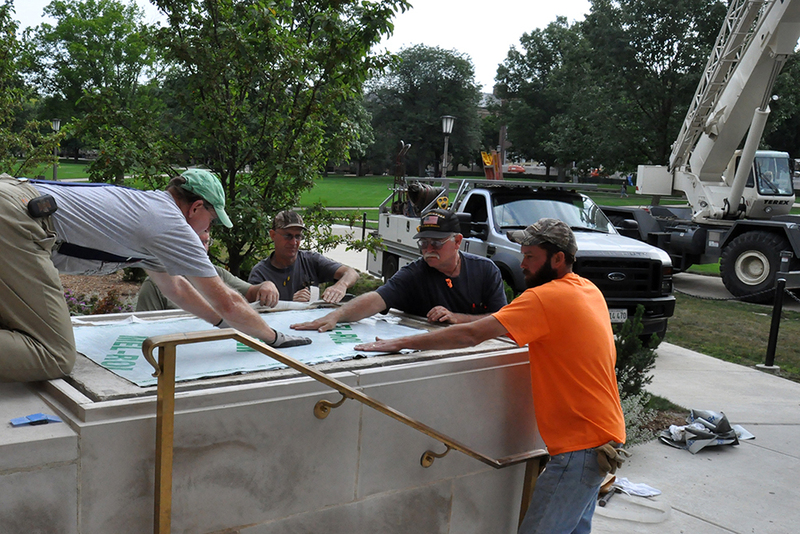 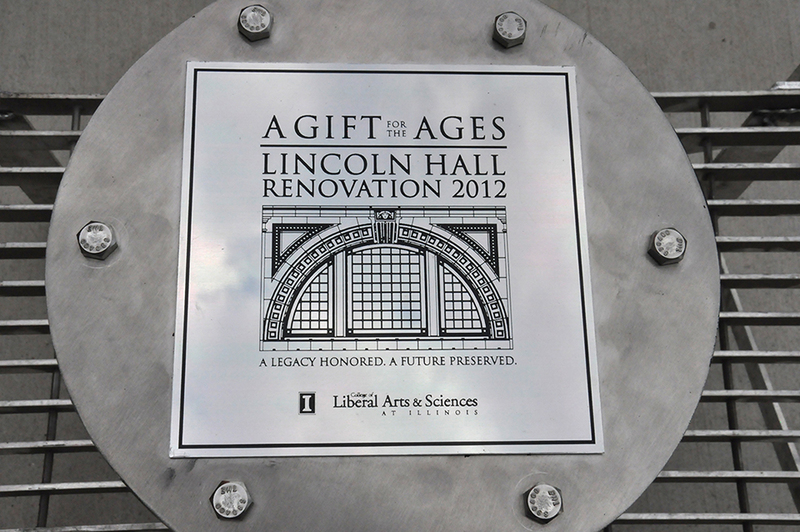 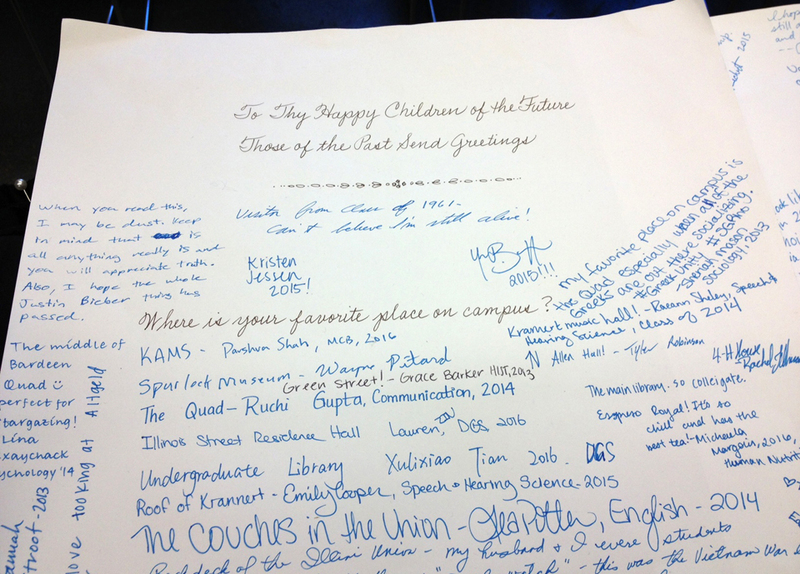 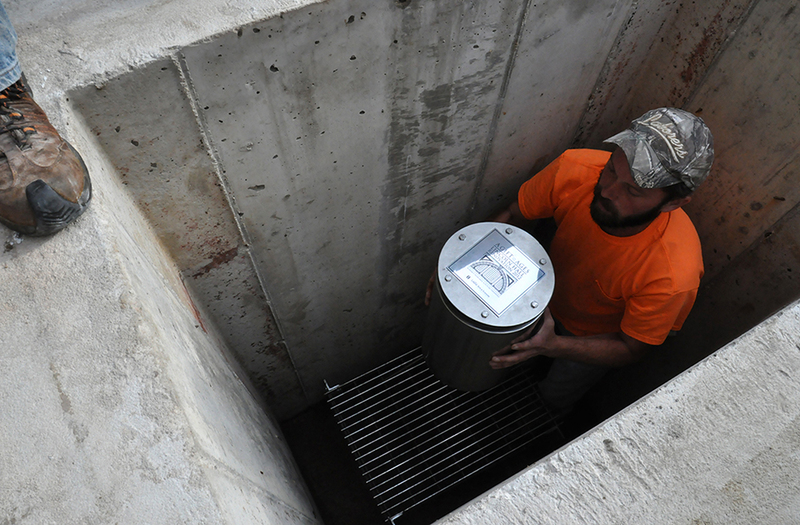 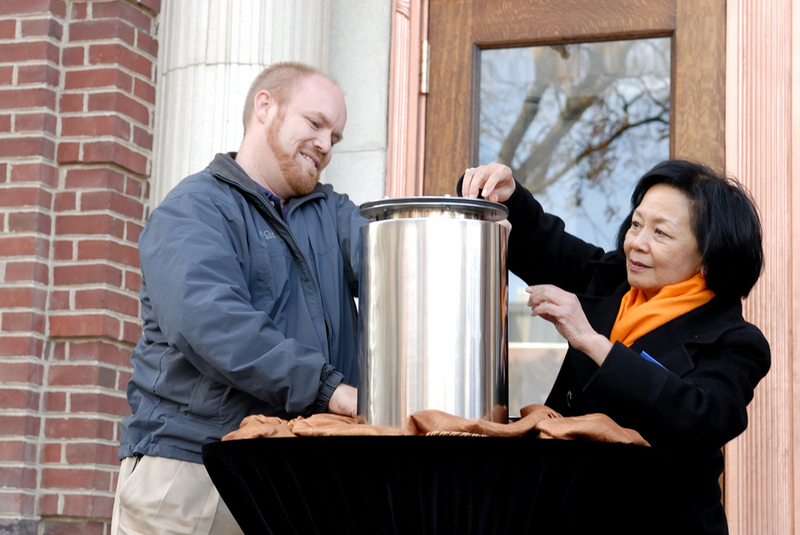 The Lincoln Hall time capsule was installed on Friday, August 16, 2013. 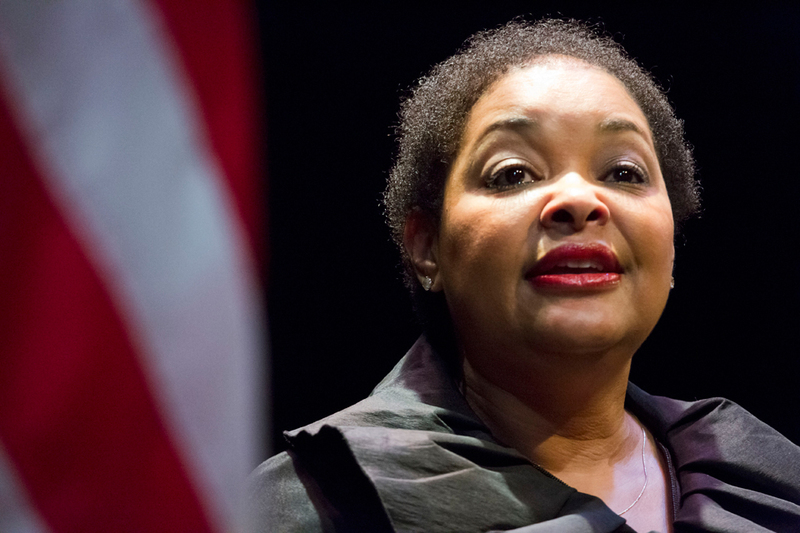 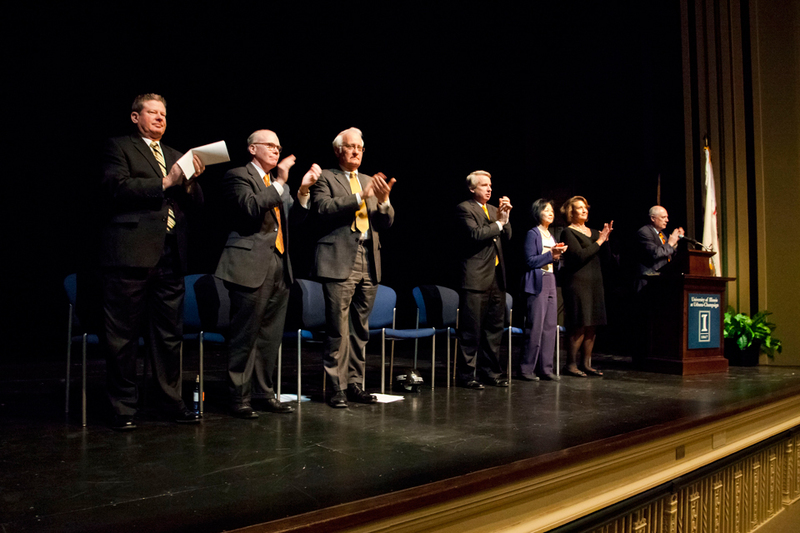 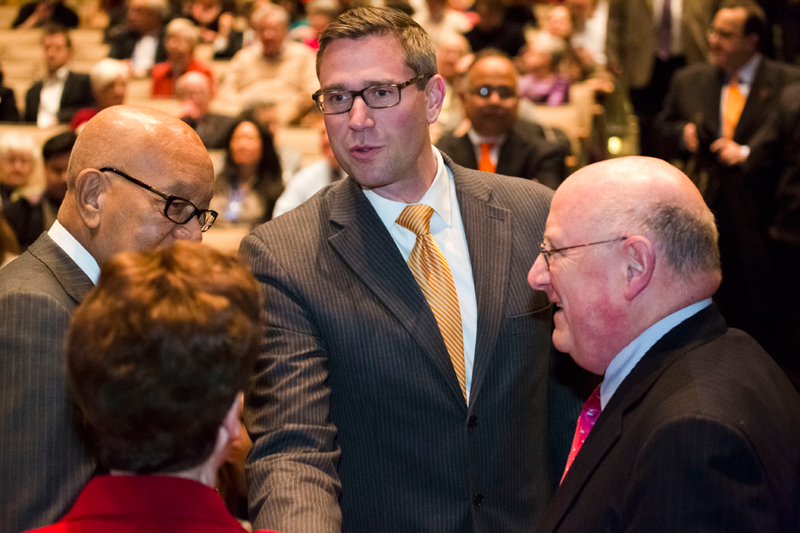 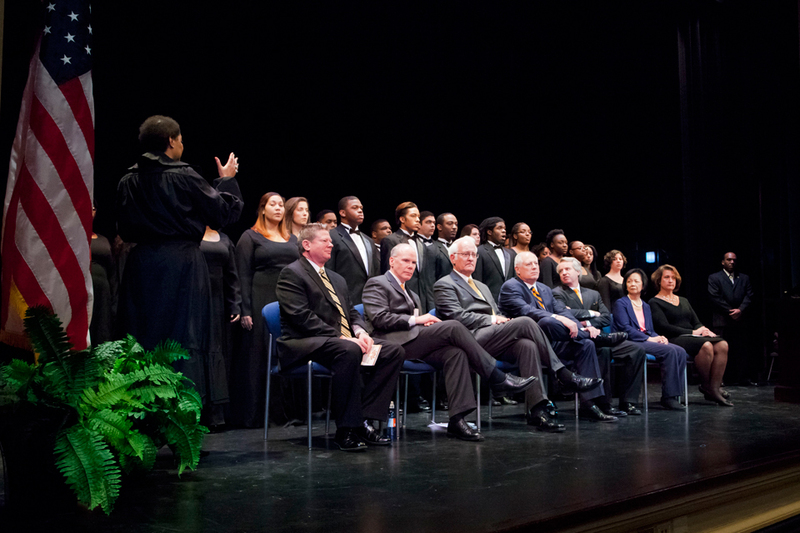 The Lincoln Hall Rededication ceremony was held on Abraham Lincoln’s birthday, Tuesday, February 12, 2013—exactly 100 years to the day of the building’s original dedication. 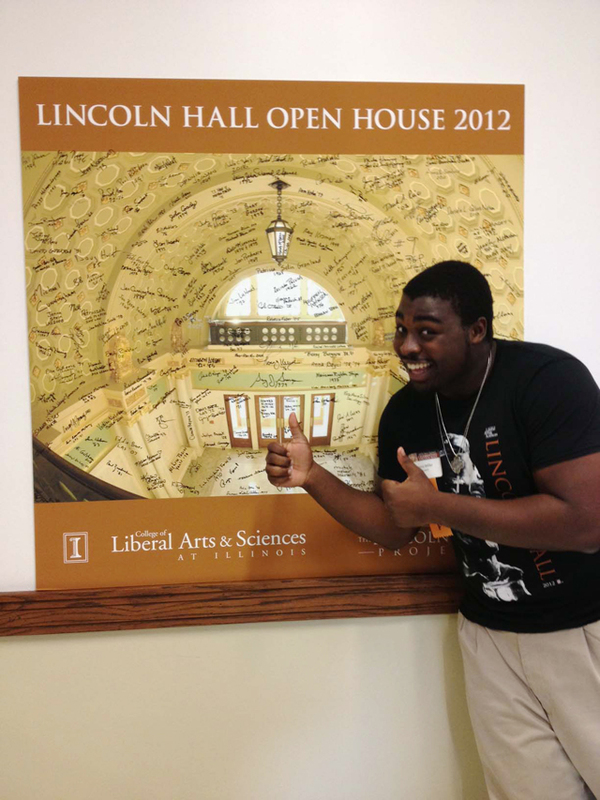 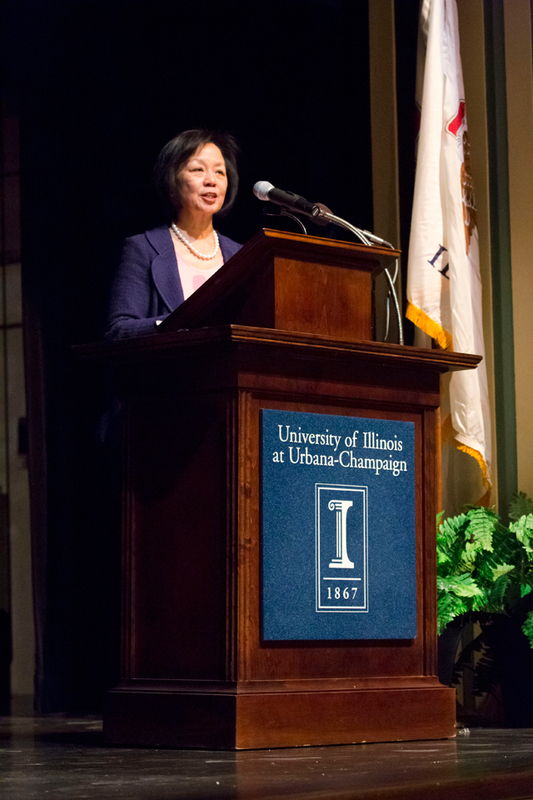 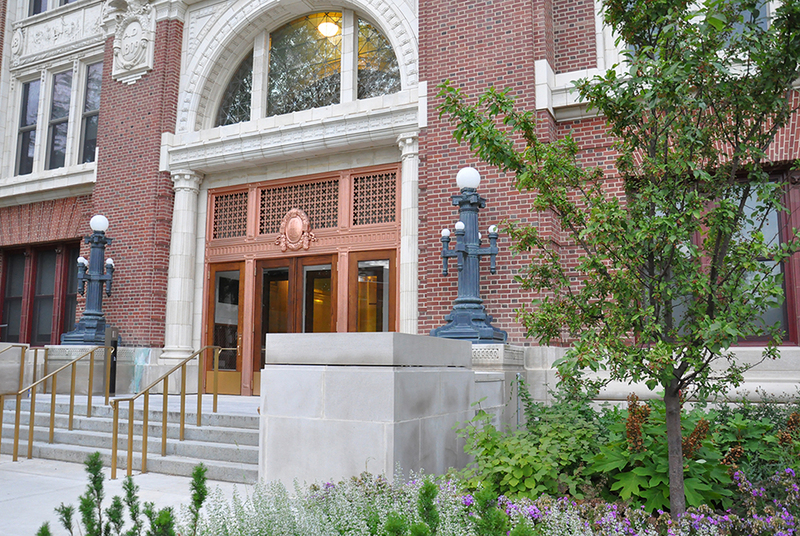 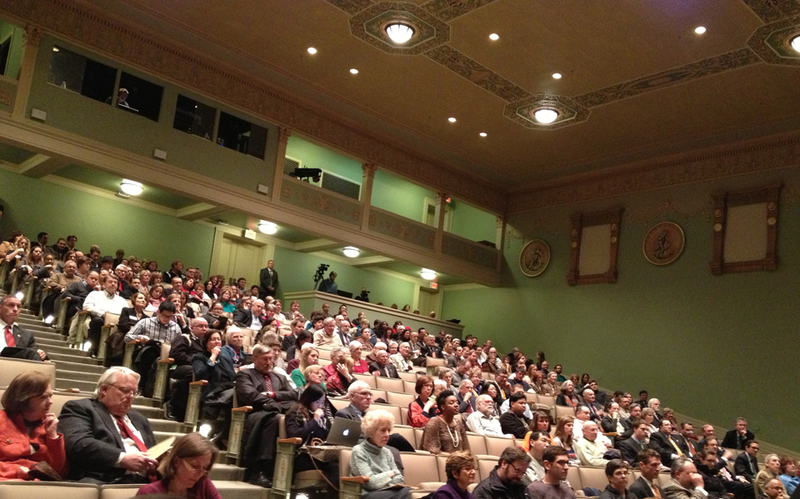 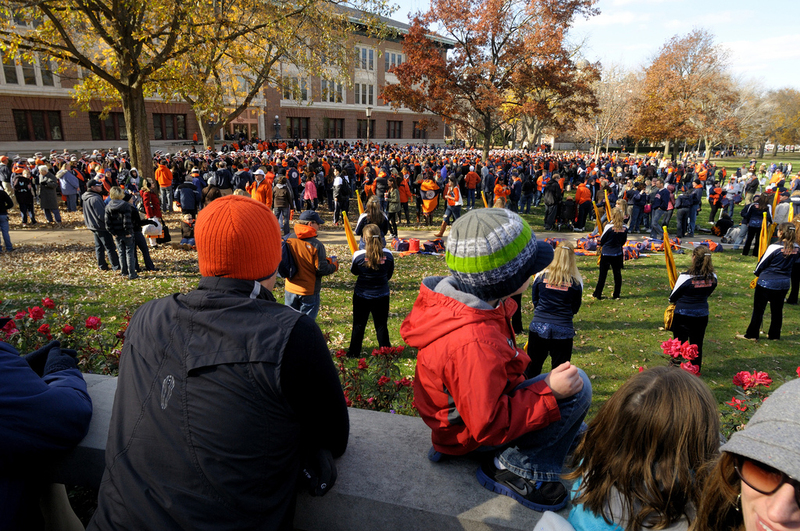 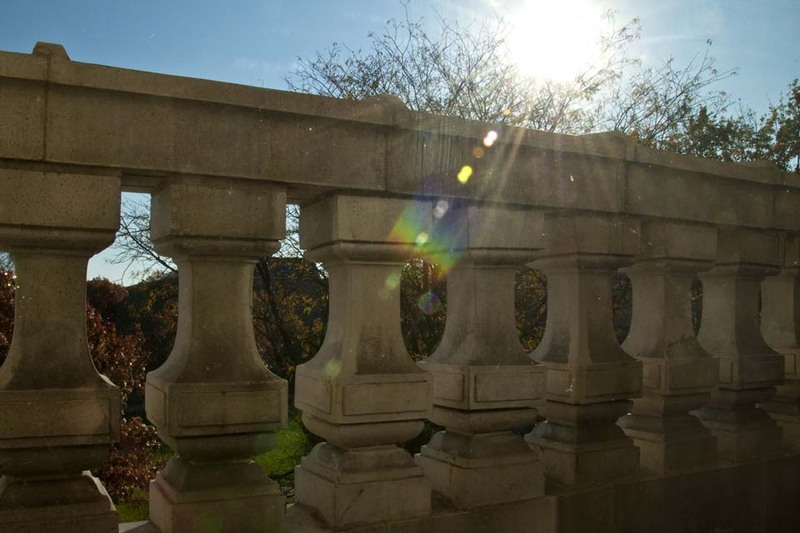 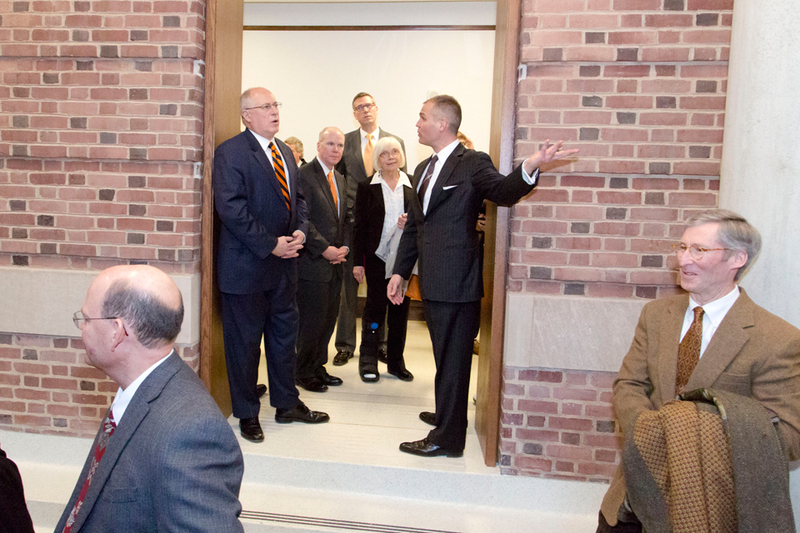 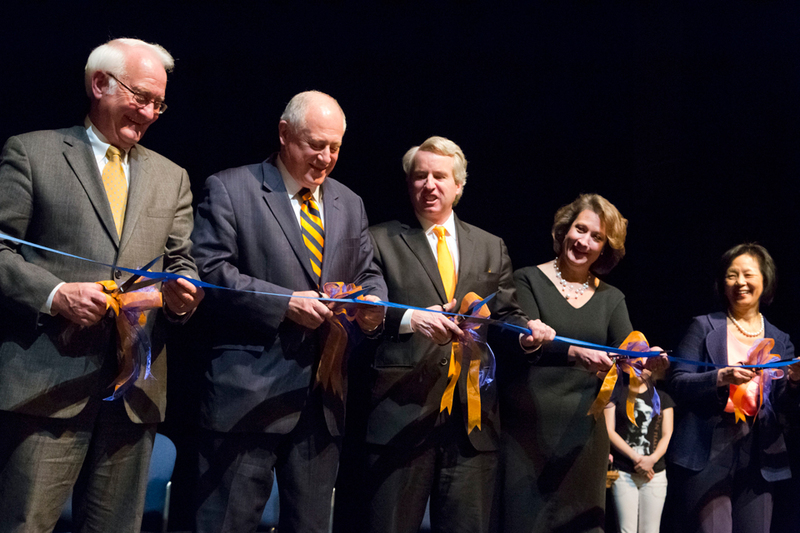 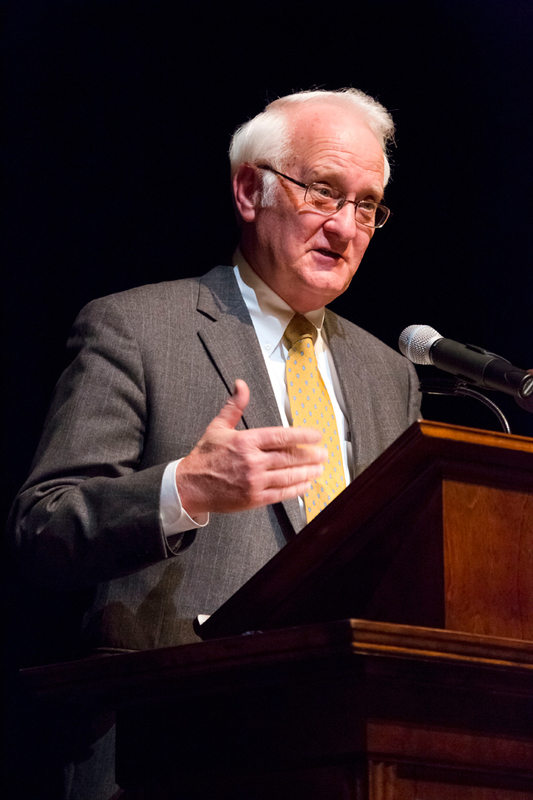 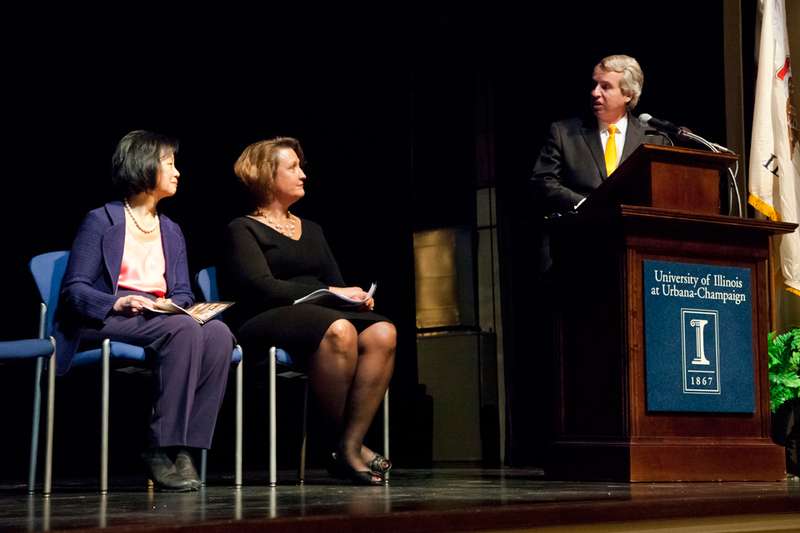 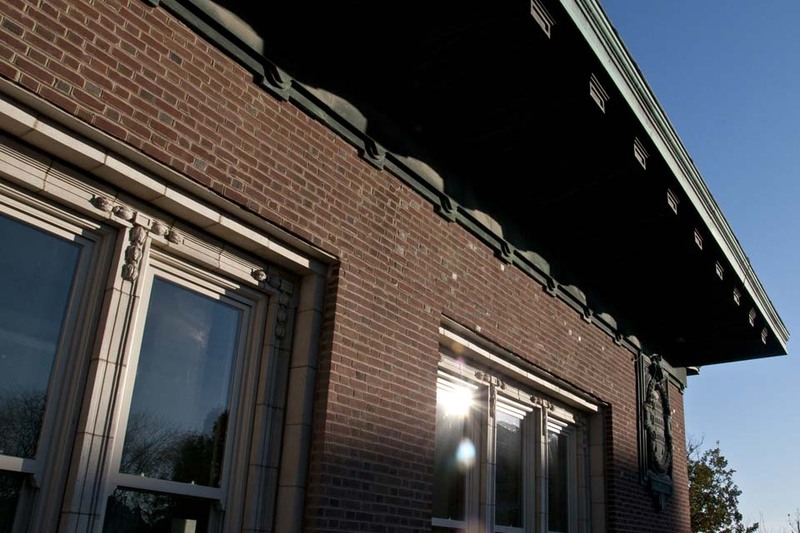 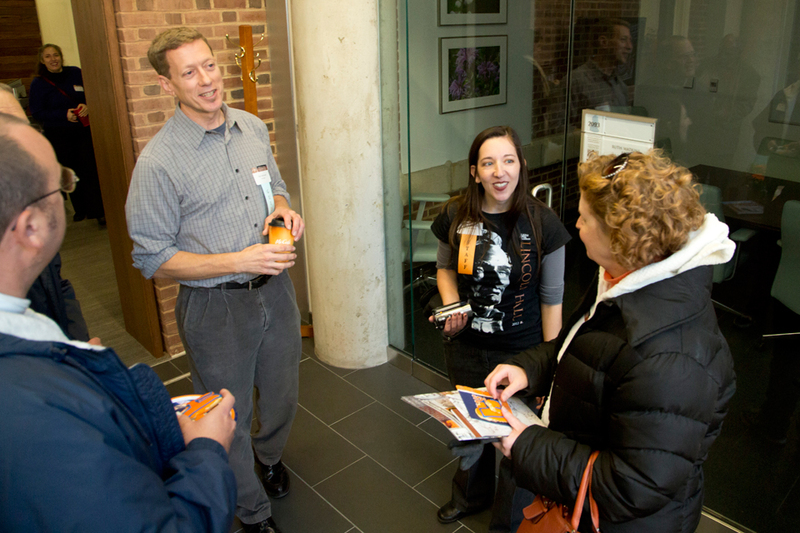 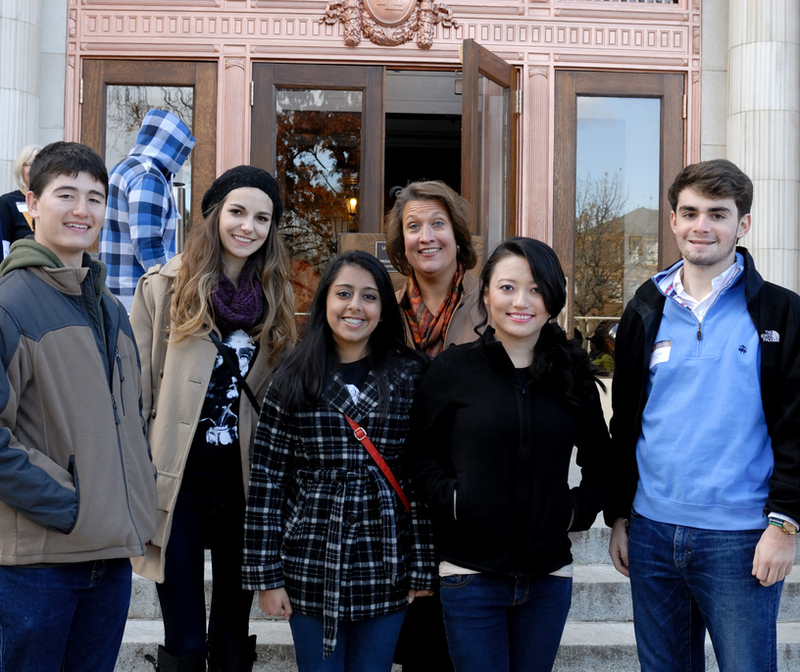 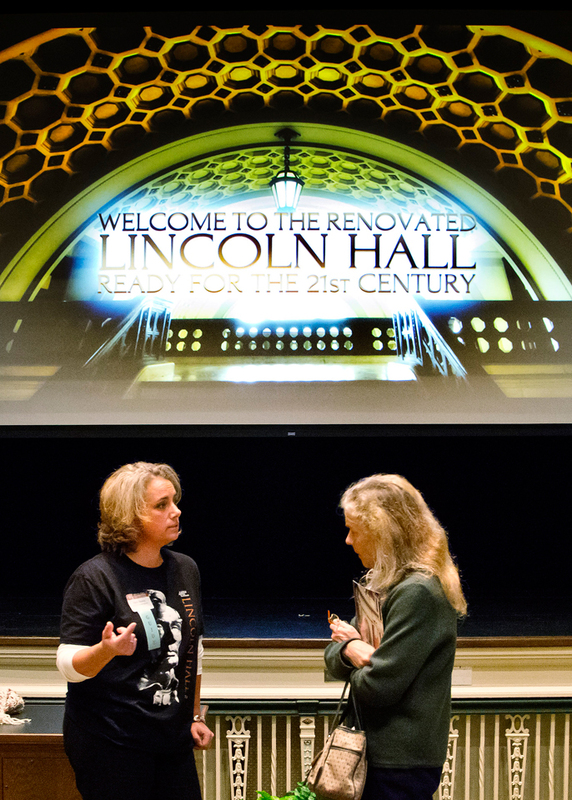 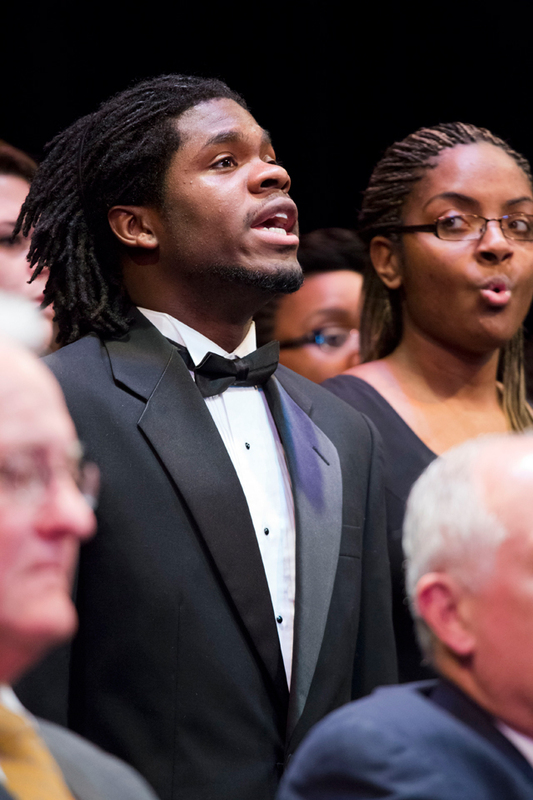 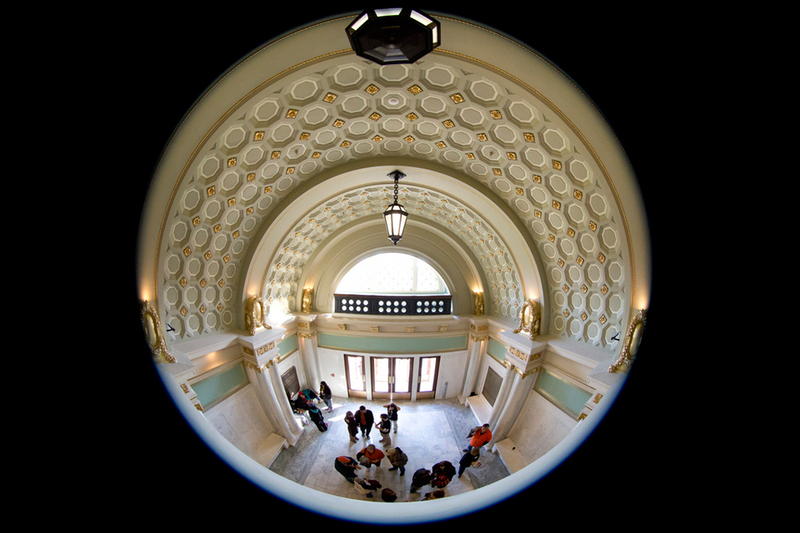 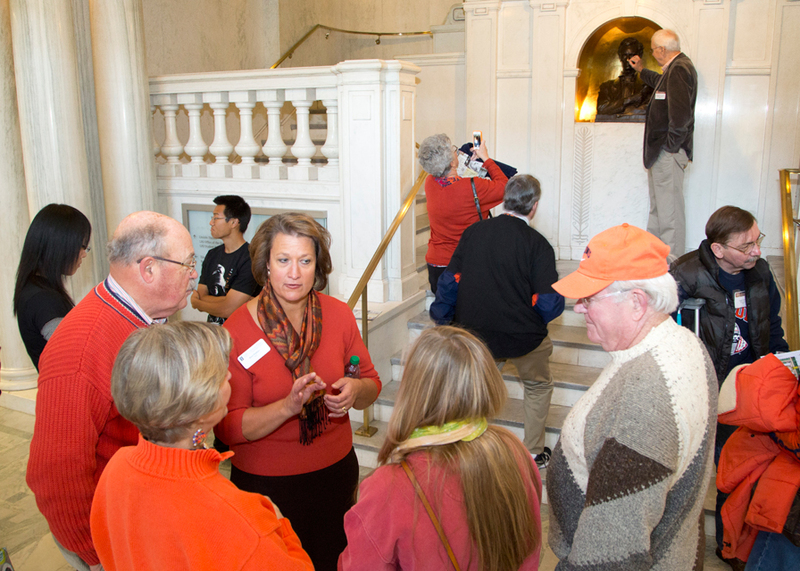 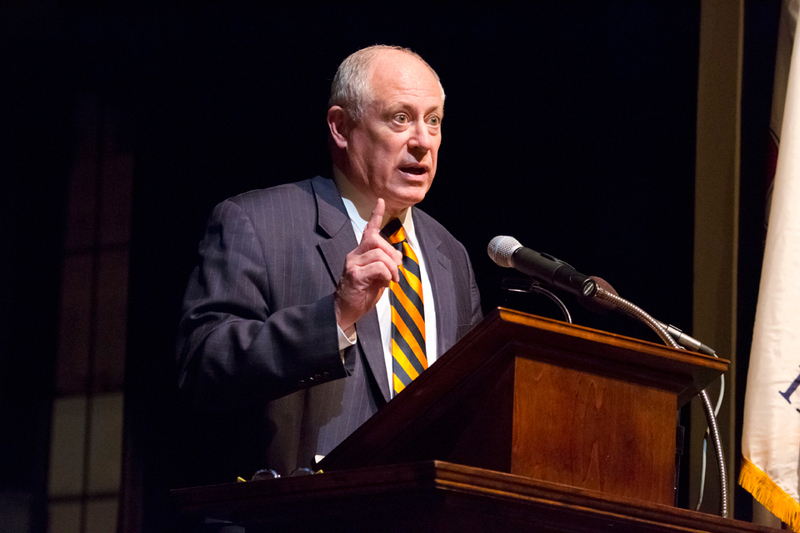 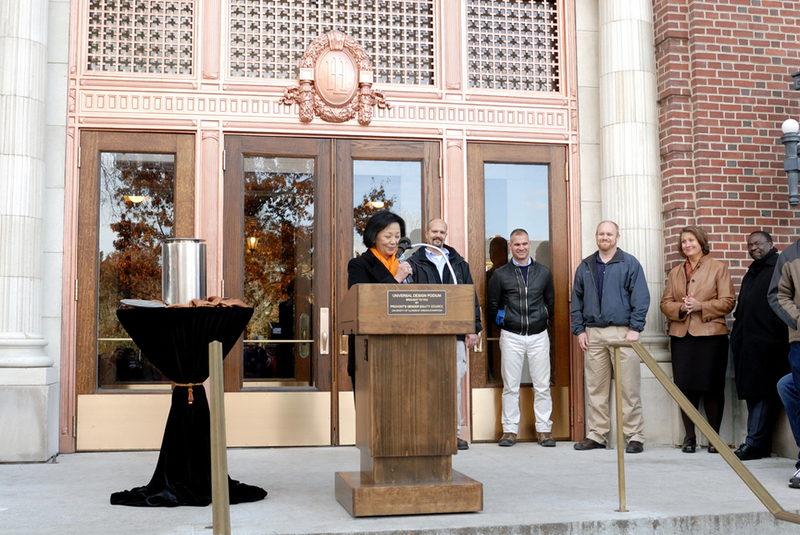 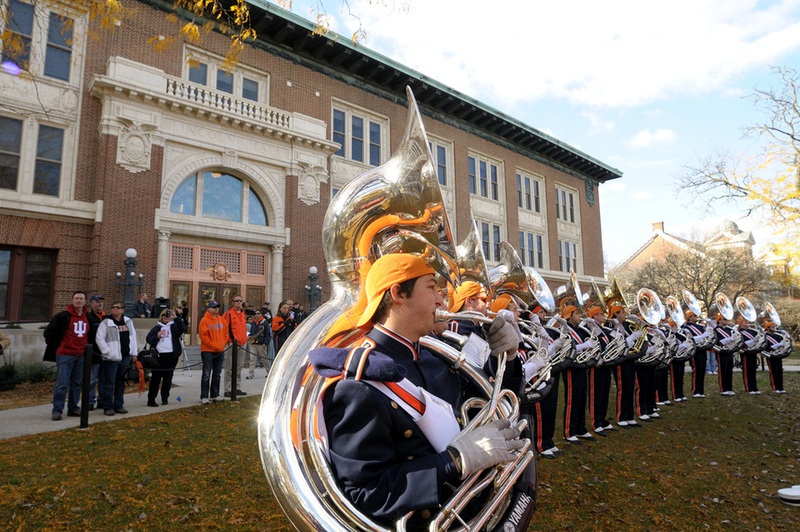 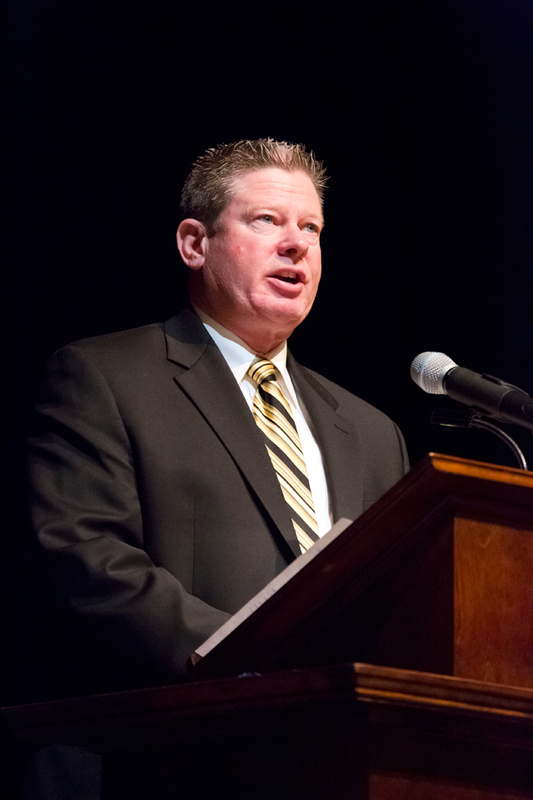 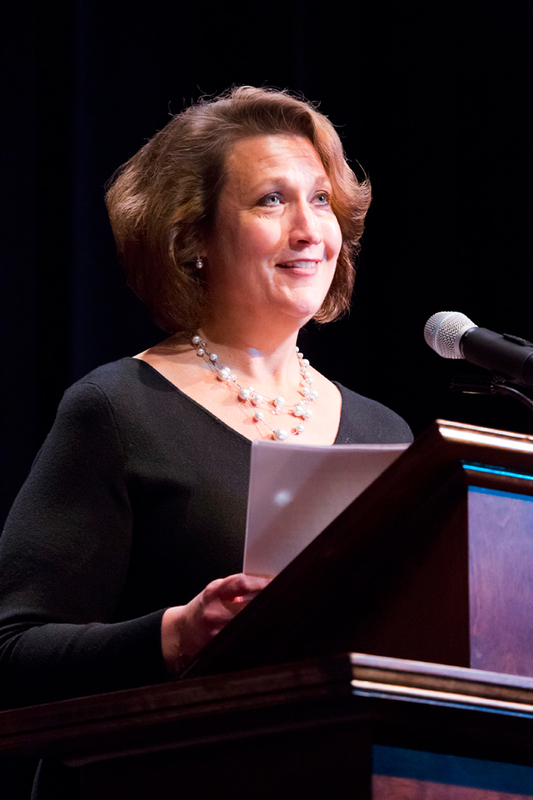 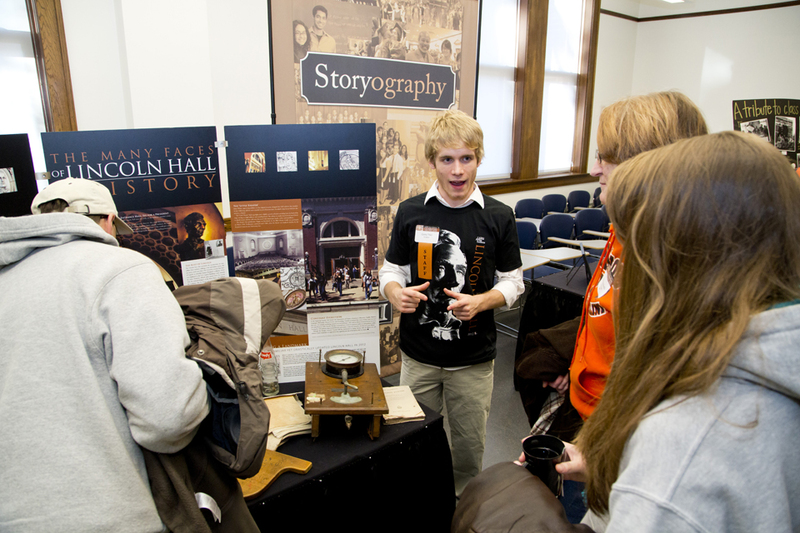 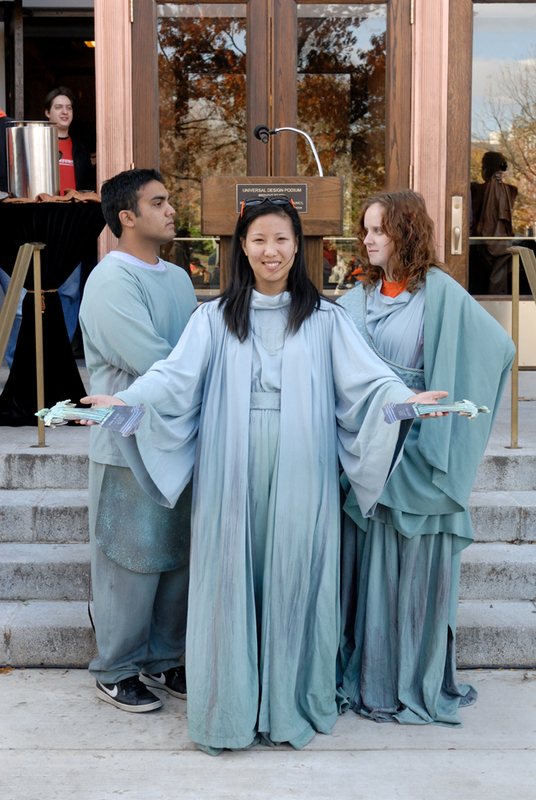 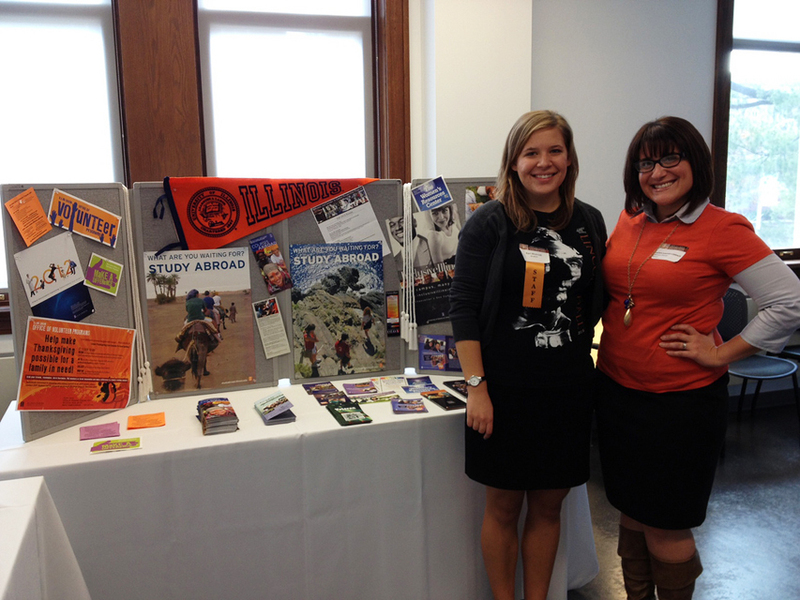 An estimated 2,000 people visited the Lincoln Hall Open House on October 27, 2012, during Homecoming. 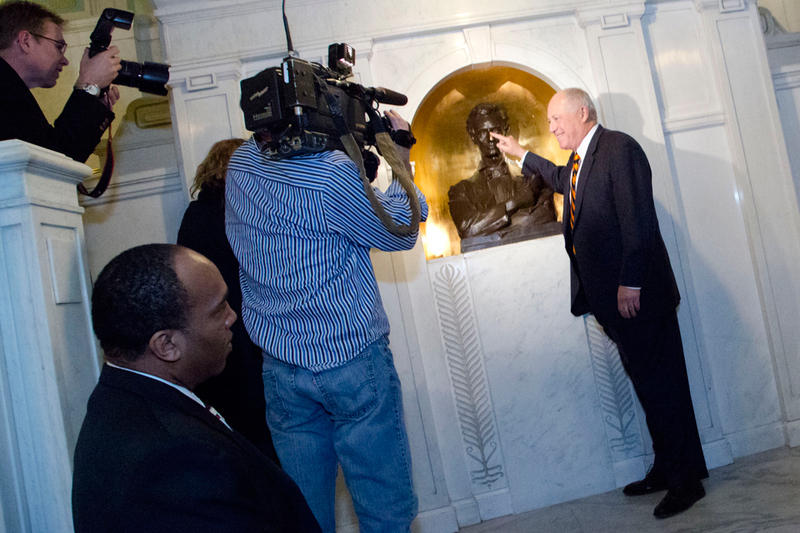 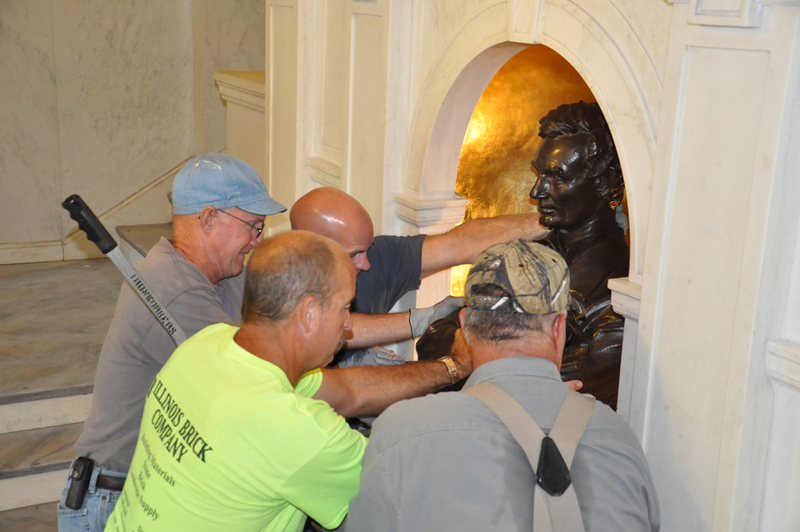 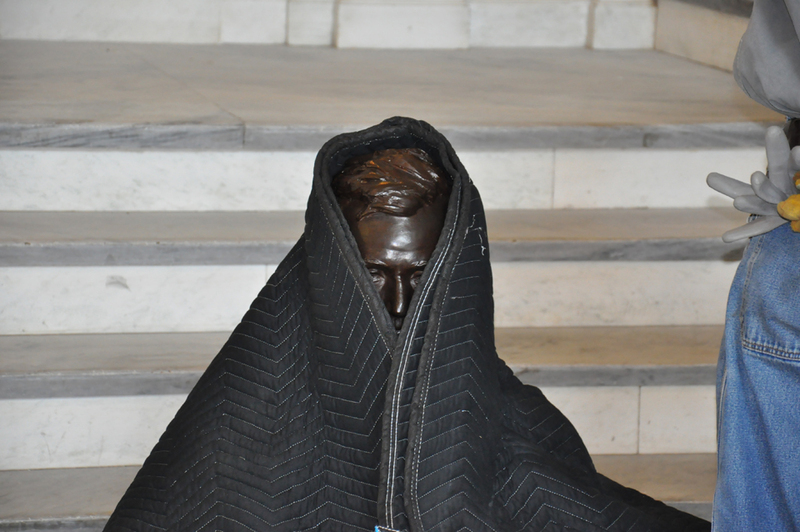 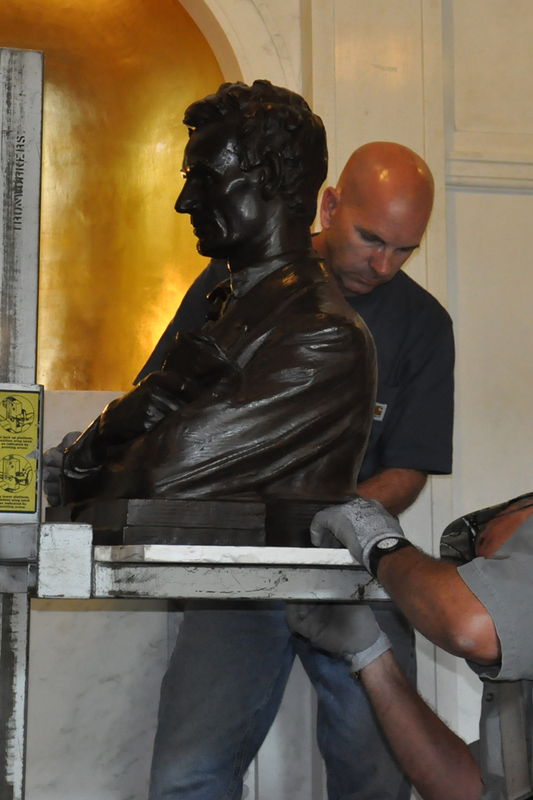 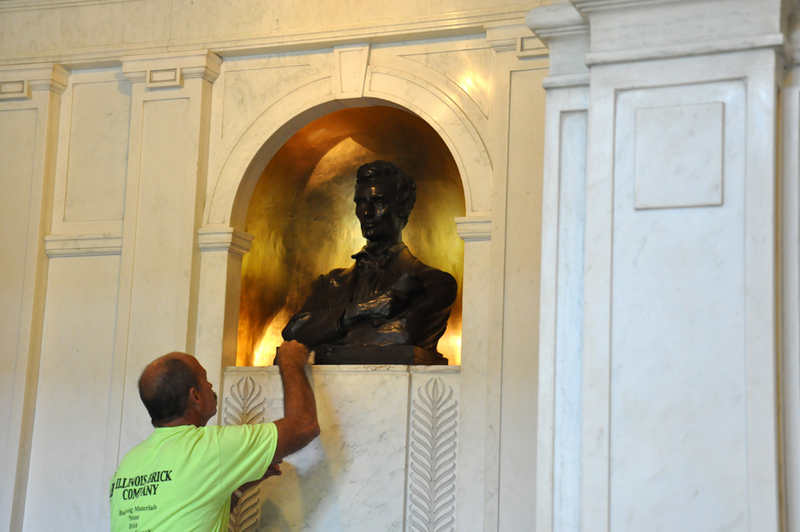 The Lincoln bust returned to its niche in the Memorial Hall entrance of Lincoln Hall. 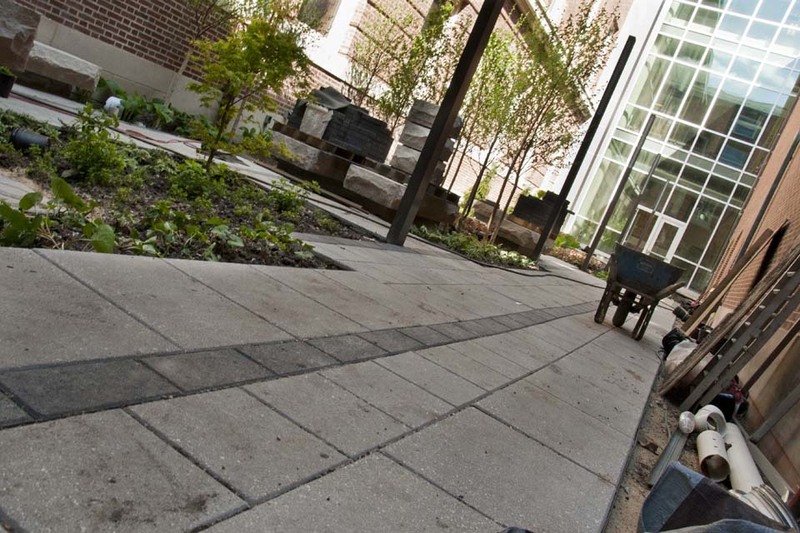 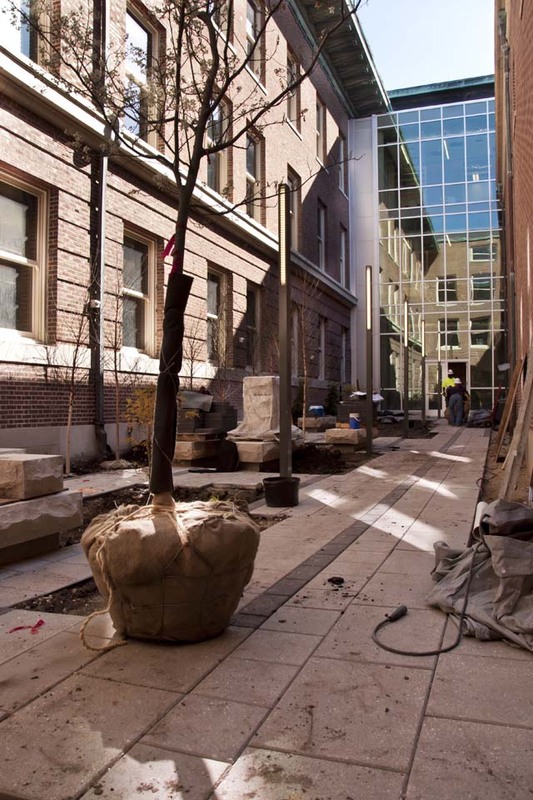 The theater is nearly done and progress on the landscaping, particularly in the courtyard, has proceeded rapidly. 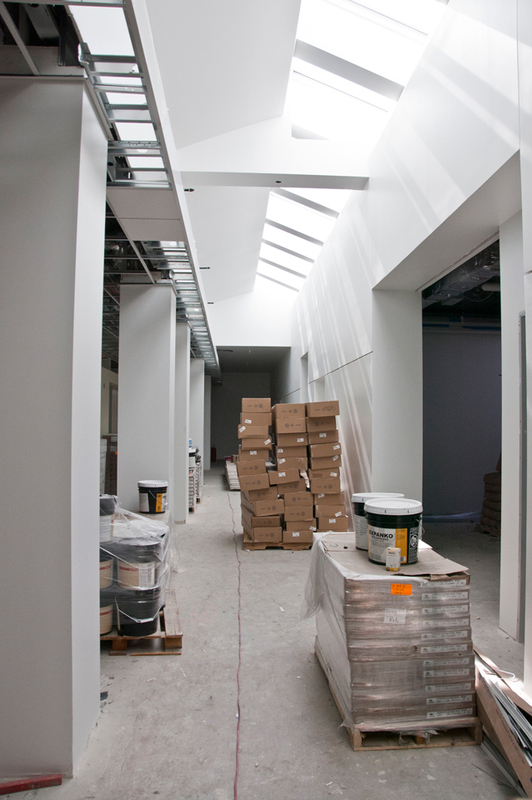 The focus is on the first floor classrooms and the courtyard even as upper floors are still receiving finishing details. 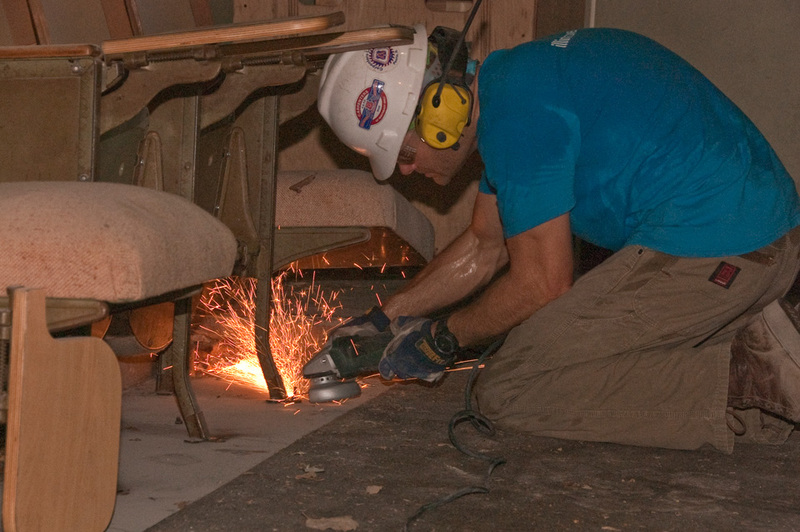 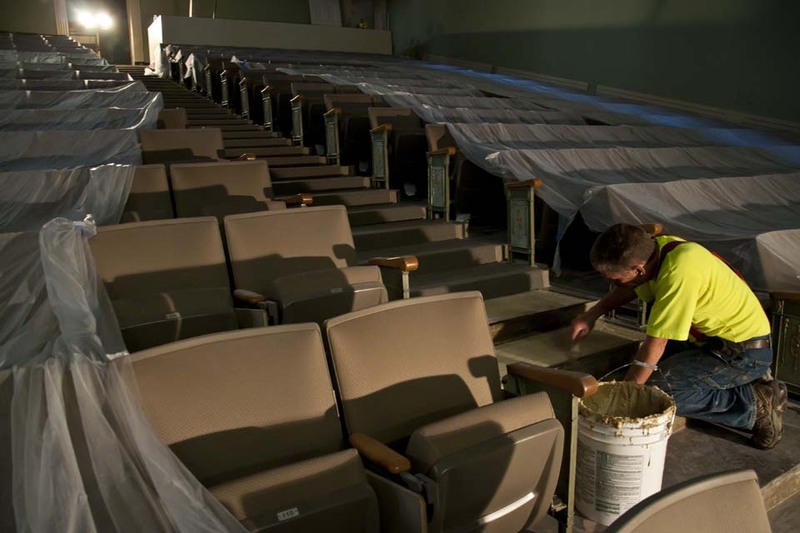 New seats are being installed in the theater as the renovation enters its final few months. 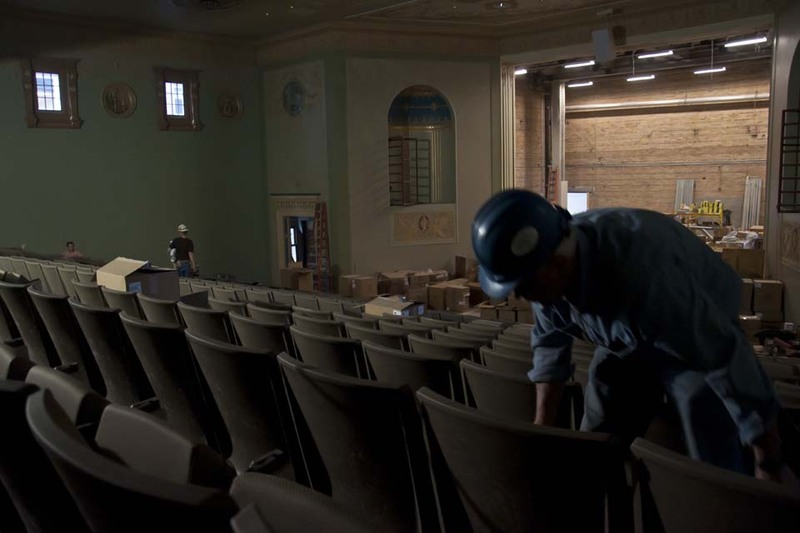 The last of the phone cable was installed and finish work is in full force on the second floor and in the theater. 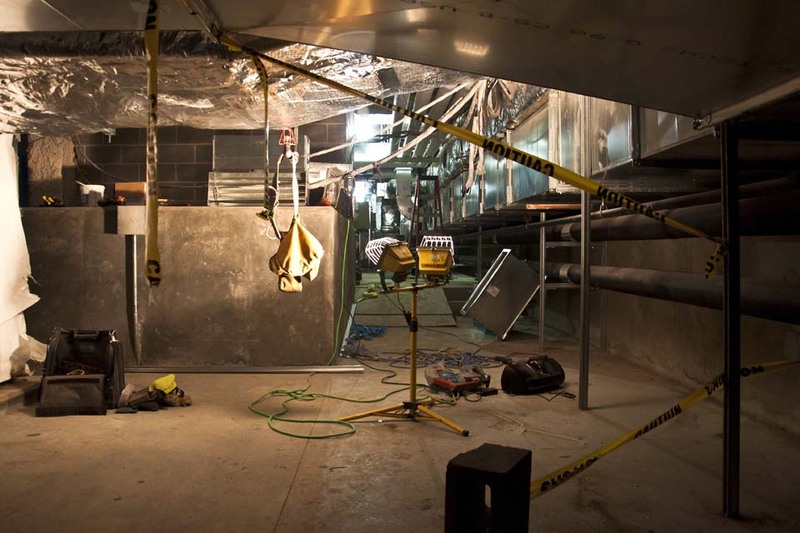 A focus has been on repairing the copper brackets on the roof overhang as the basement takes shape. 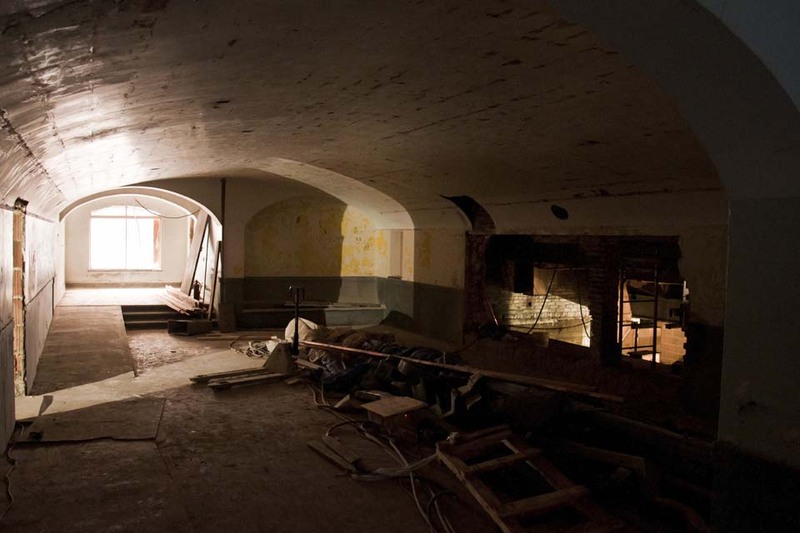 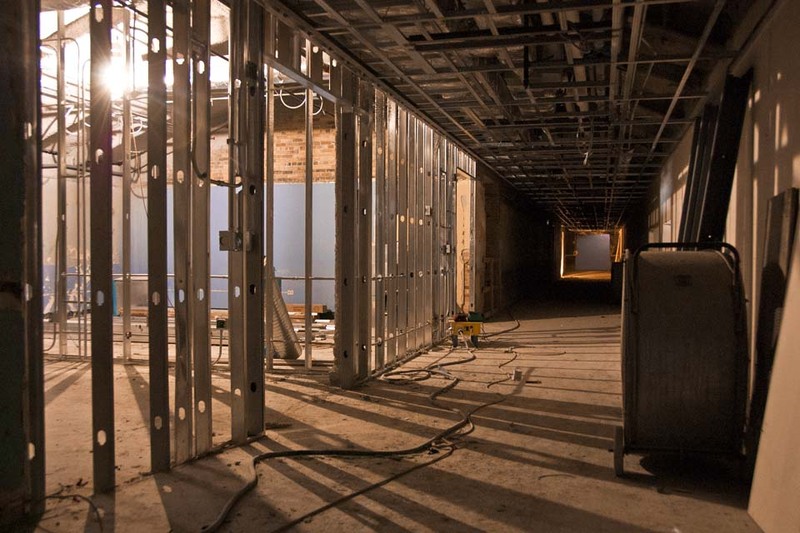 Work is progressing at full speed on the interiors. 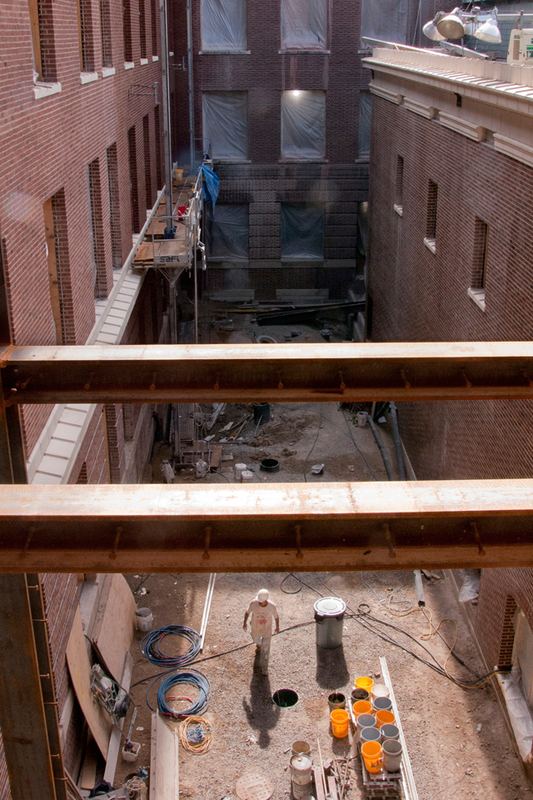 The new decks in the courtyard are taking shape while creating the offices and spaces for the building’s new mechanical systems continues. 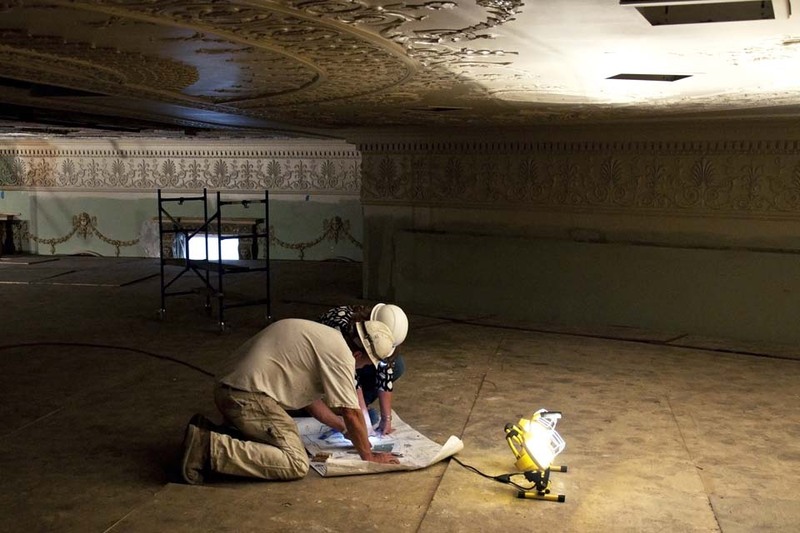 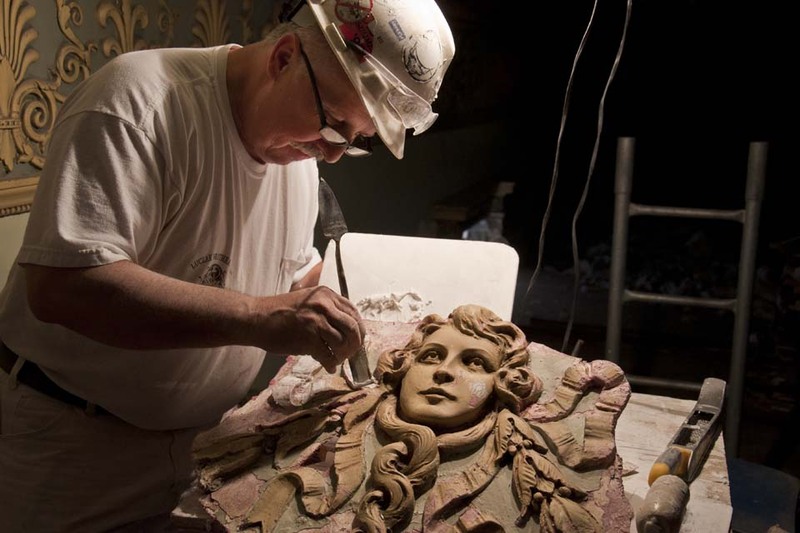 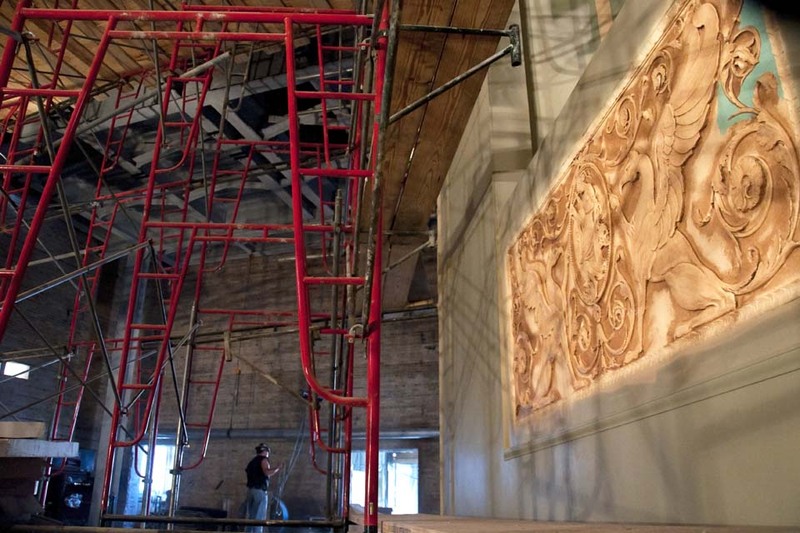 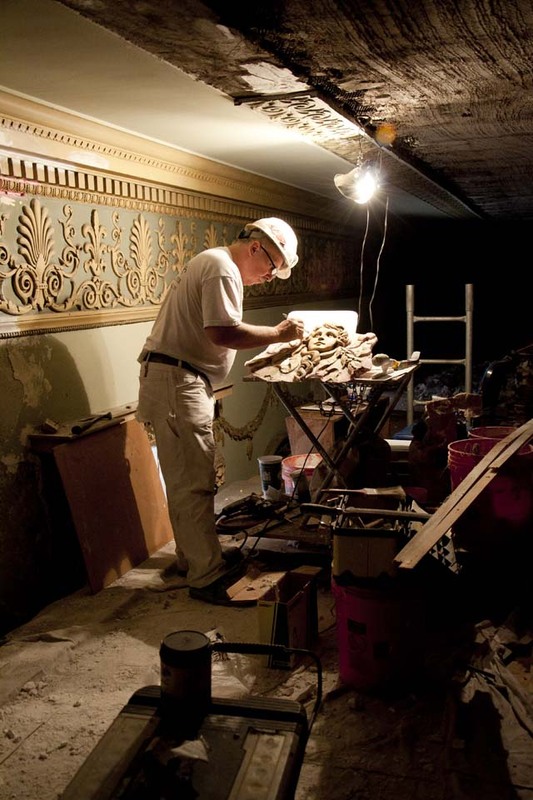 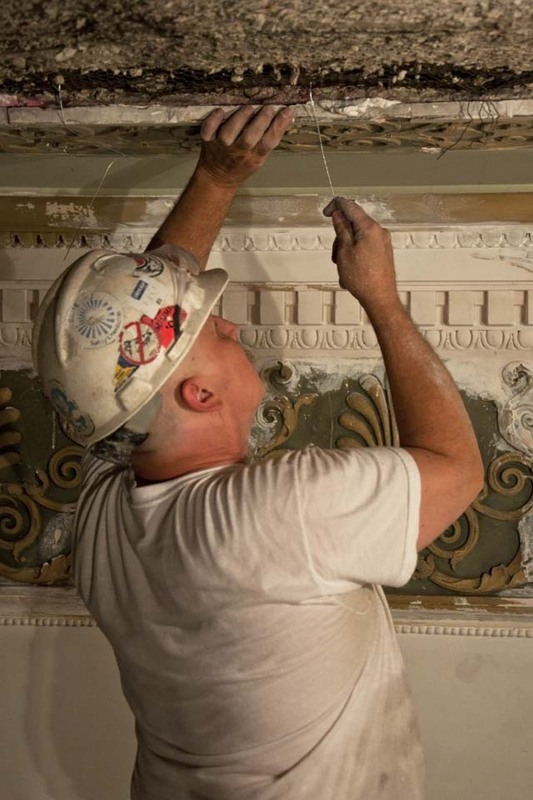 The medallions and other ornamental plaster in the theater are also being restored to their original condition and coloring. 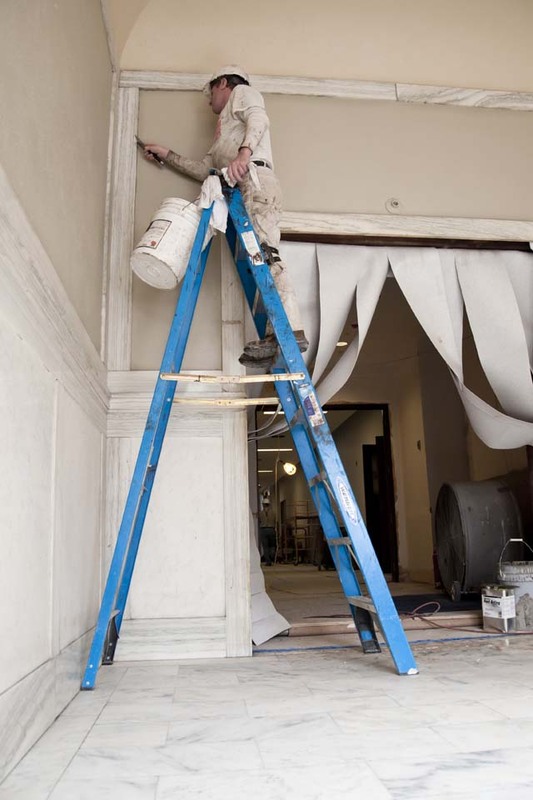 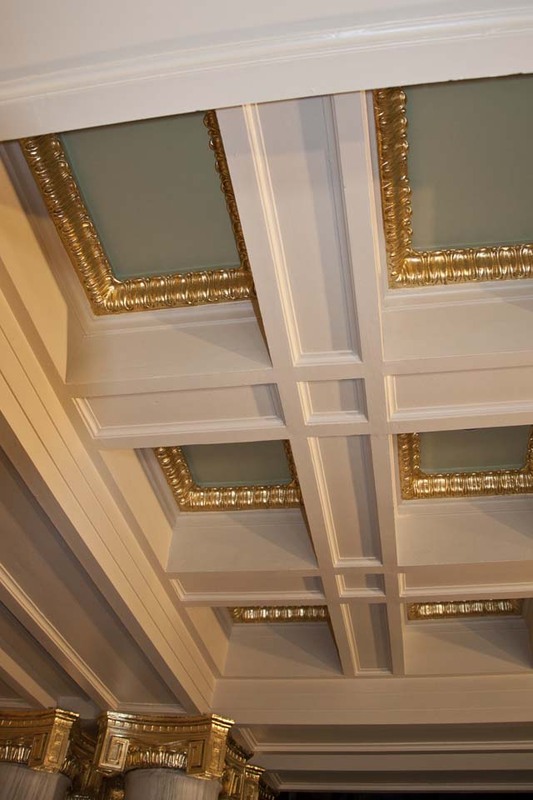 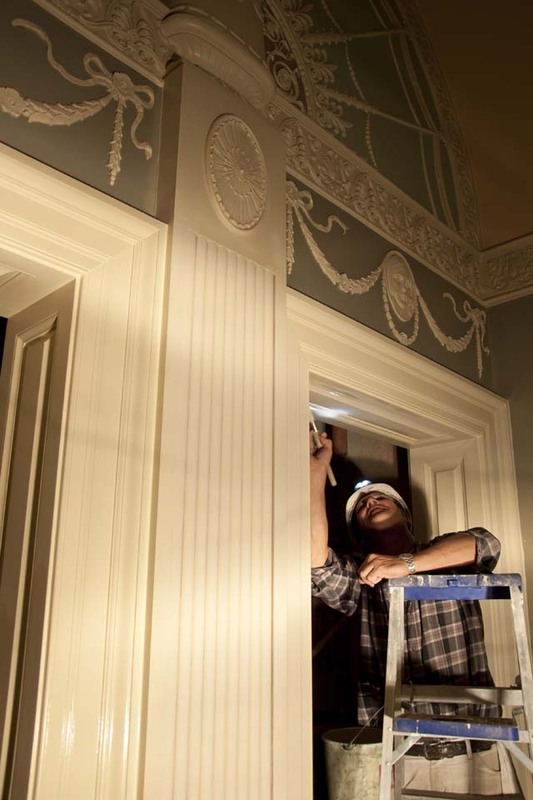 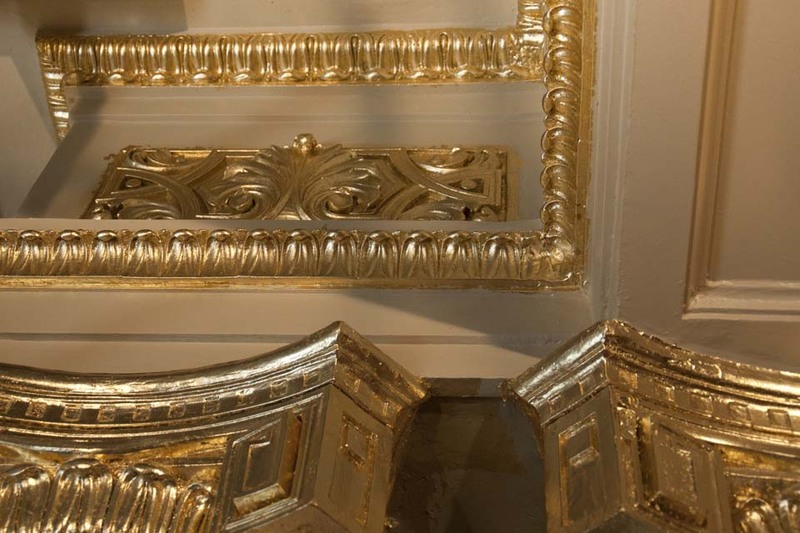 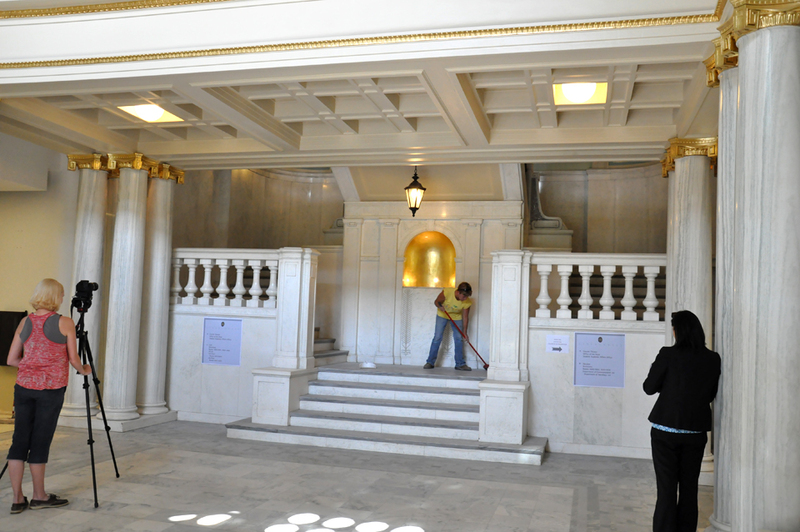 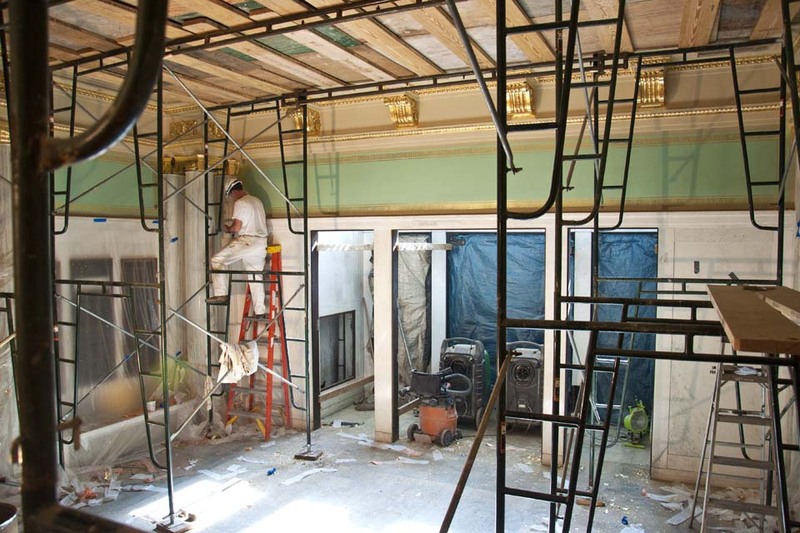 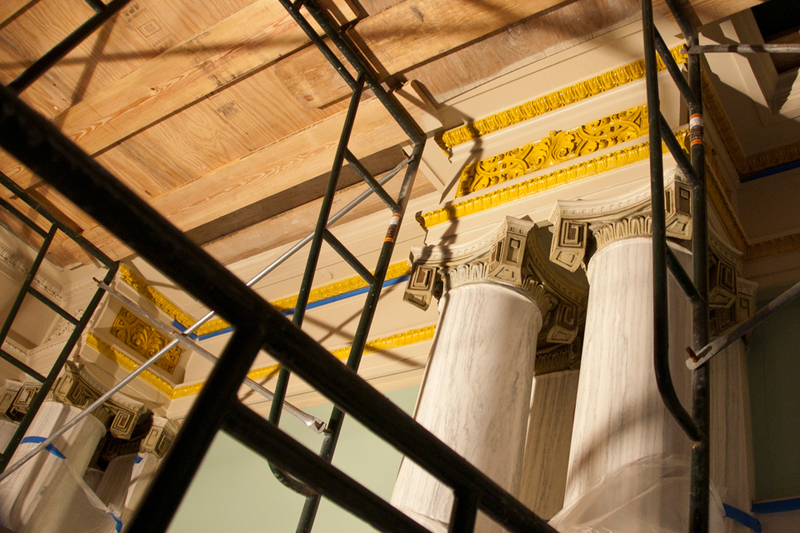 Painters are restoring the foyer to its original grandeur using gold paint and gold leaf. 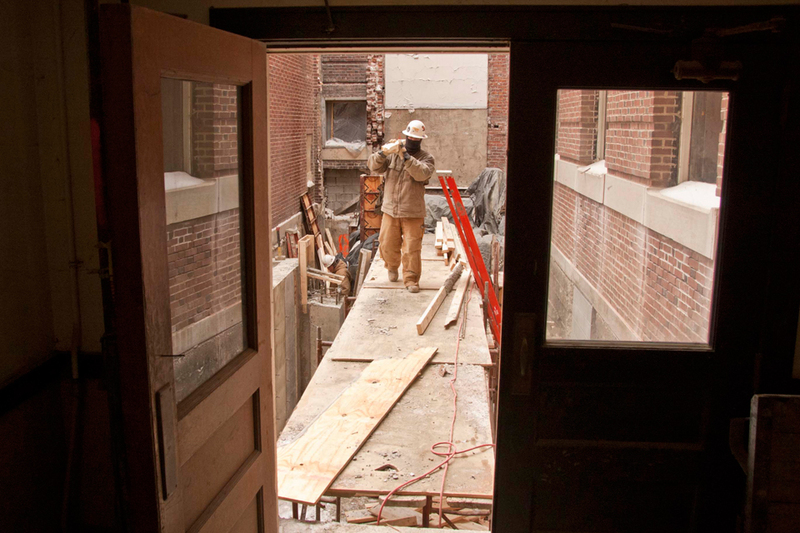 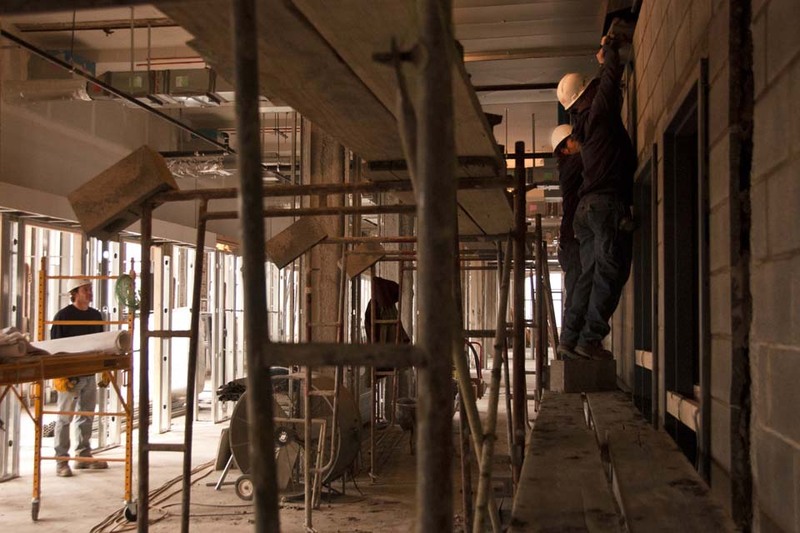 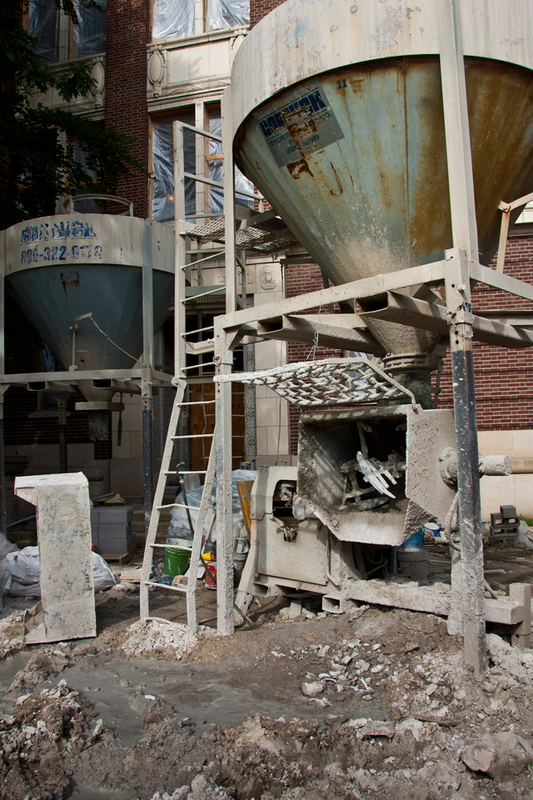 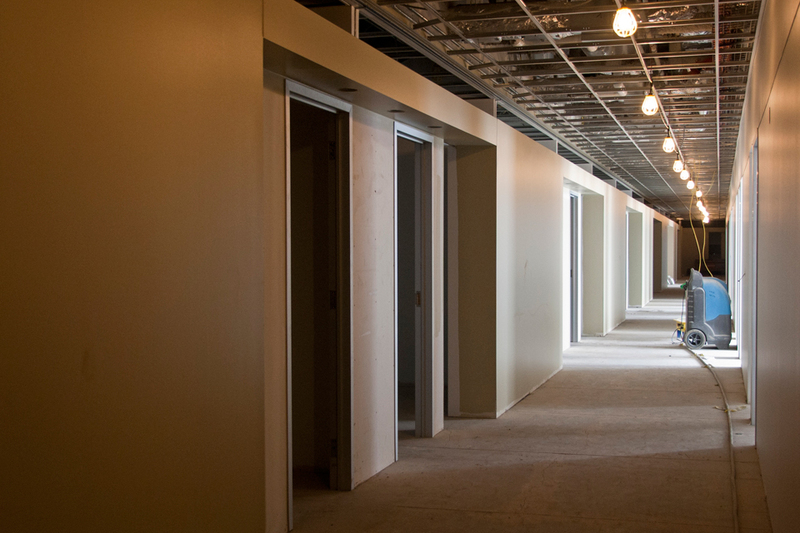 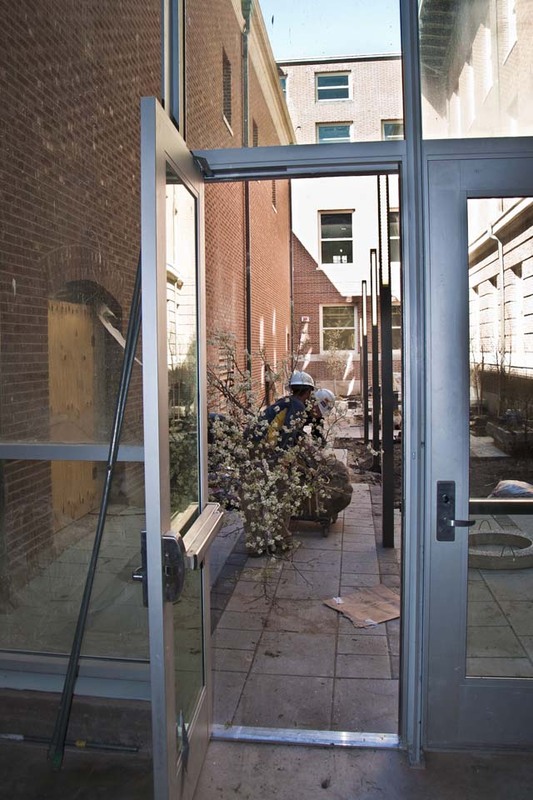 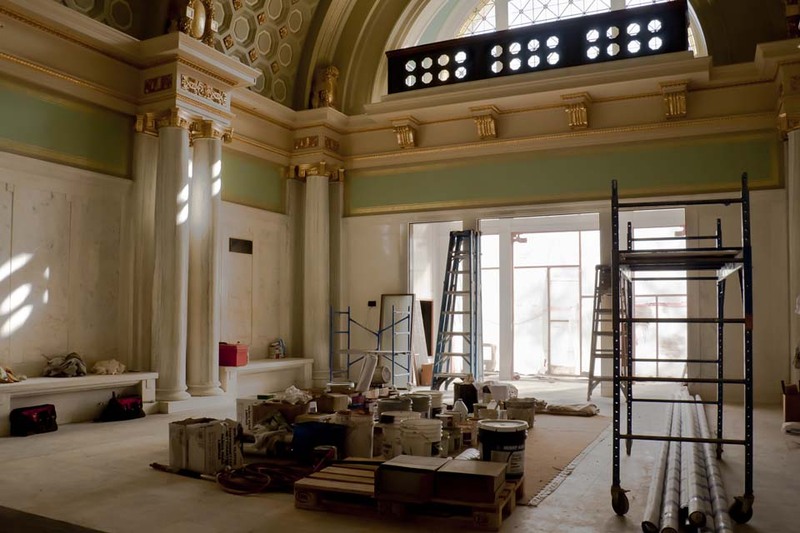 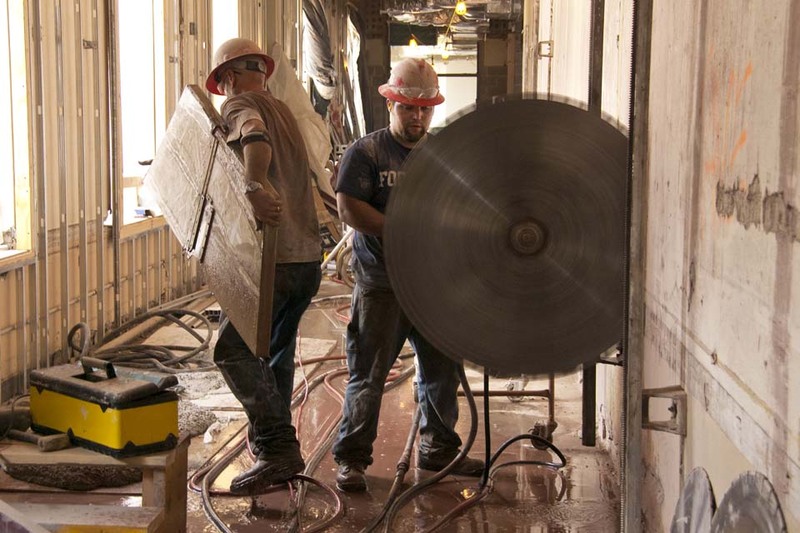 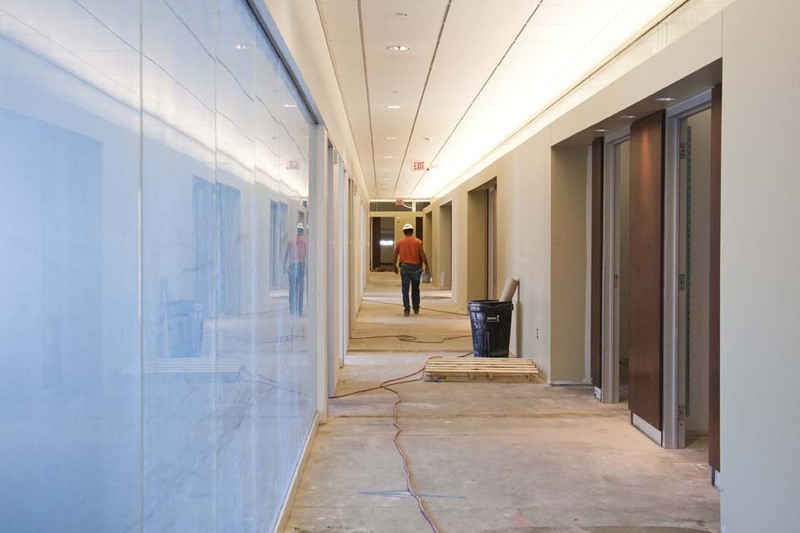 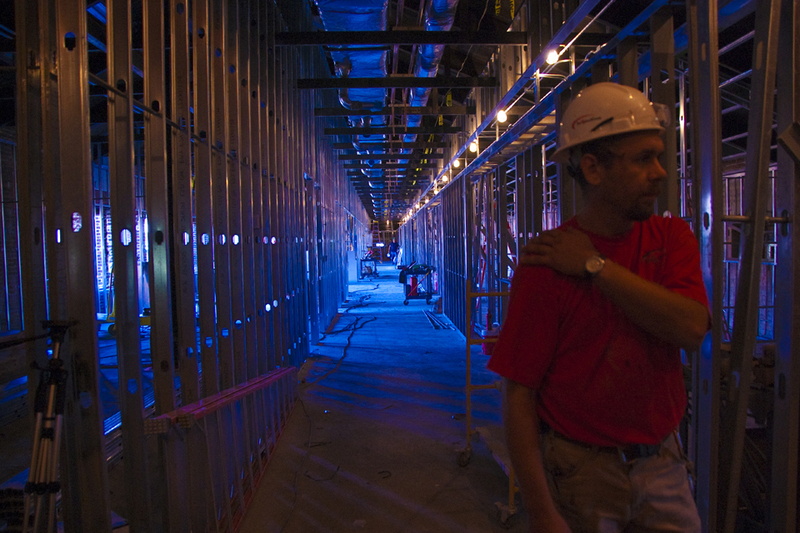 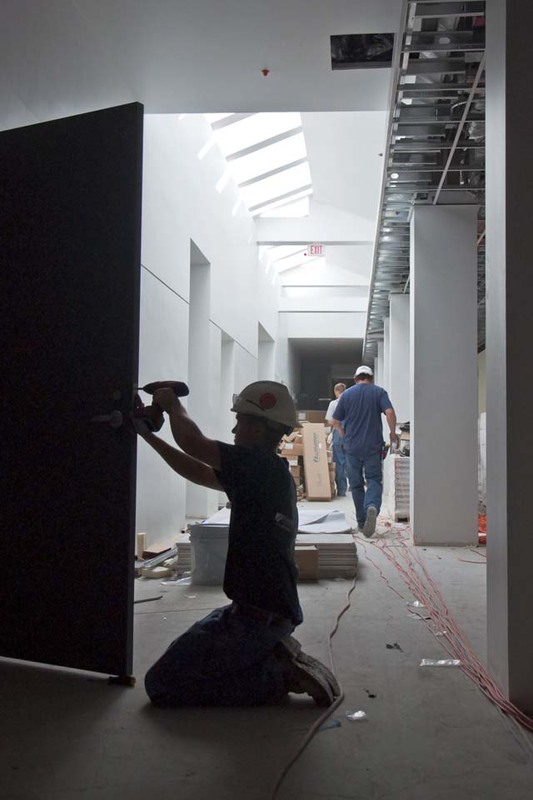 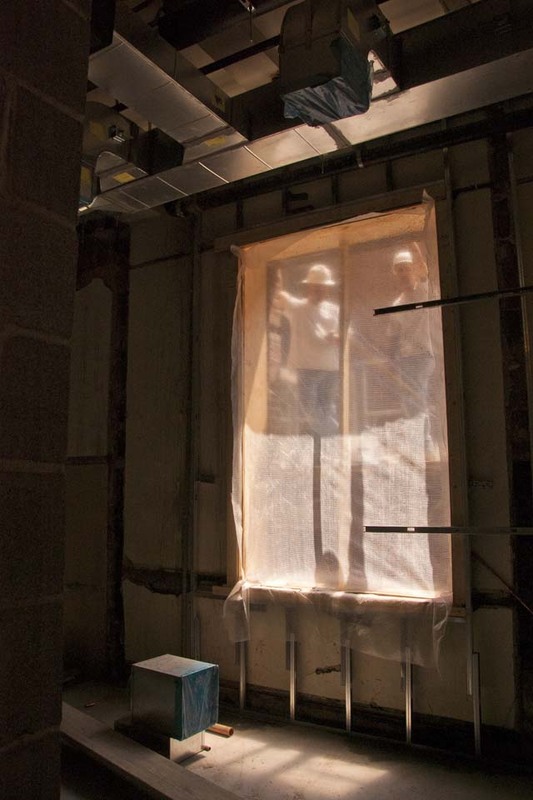 Heavy rain in June slowed down the work on the exterior of Lincoln Hall but didn’t dampen the progress on the interior. 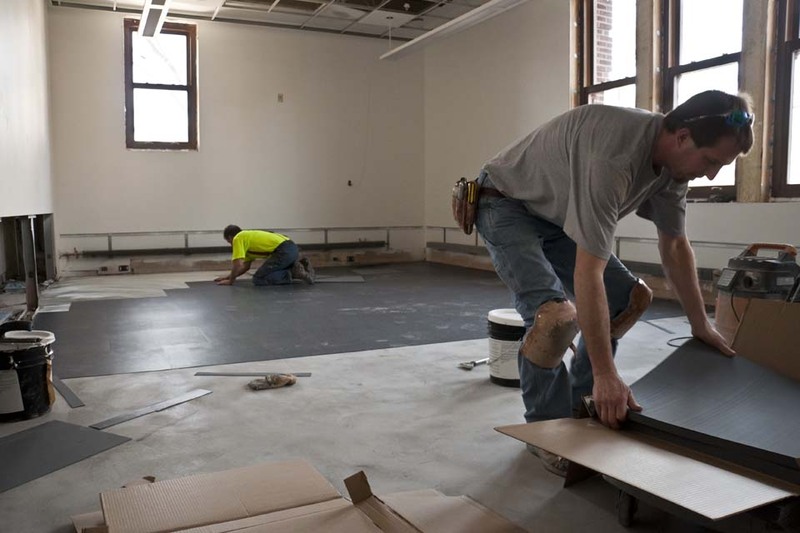 A focus of attention for crews are the new floors that wil occupy the former flyspace above the Lincoln Hall Theater stage. 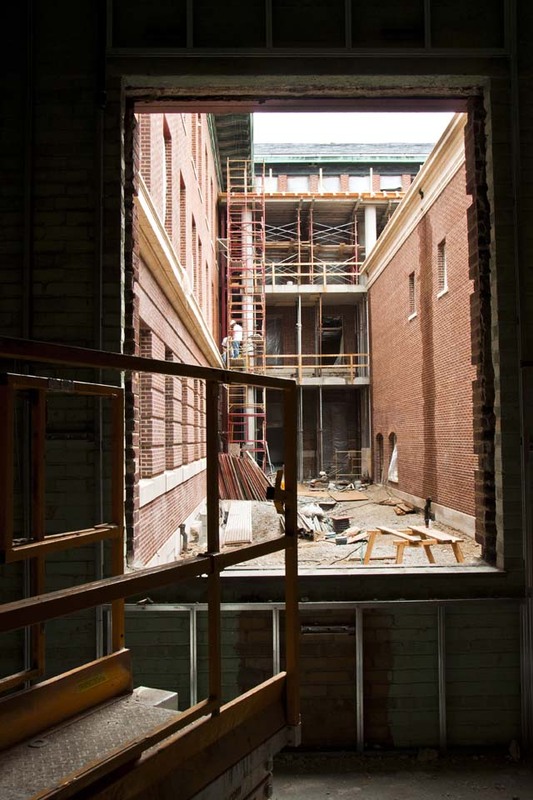 Exterior work, such as in the courtyard, is also moving forward at full speed. 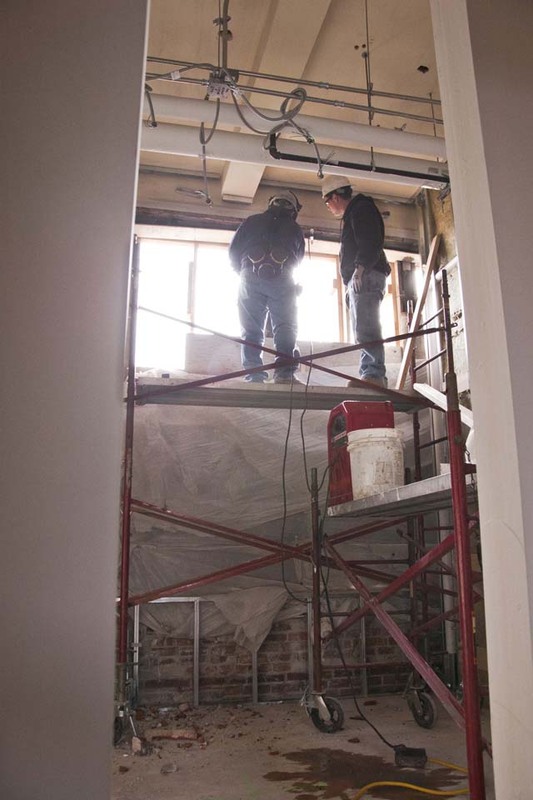 Drywall is going up on the fourth floor as tuckpointing resumes on the exterior. 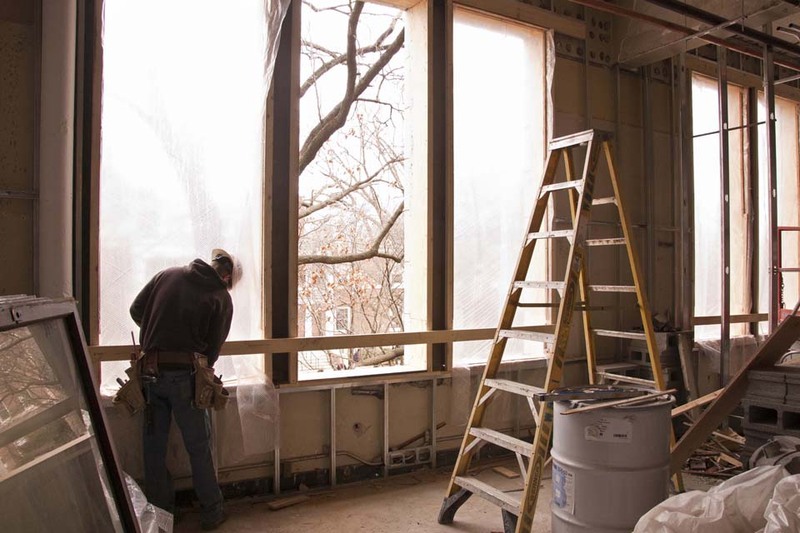 Window openings are being framed to accommodate new windows, and walls are taking shape for dozens of rooms on the second floor. 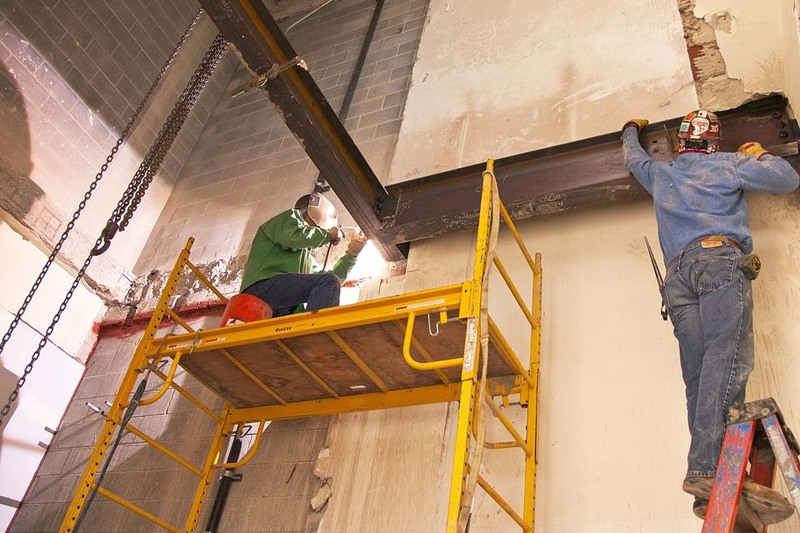 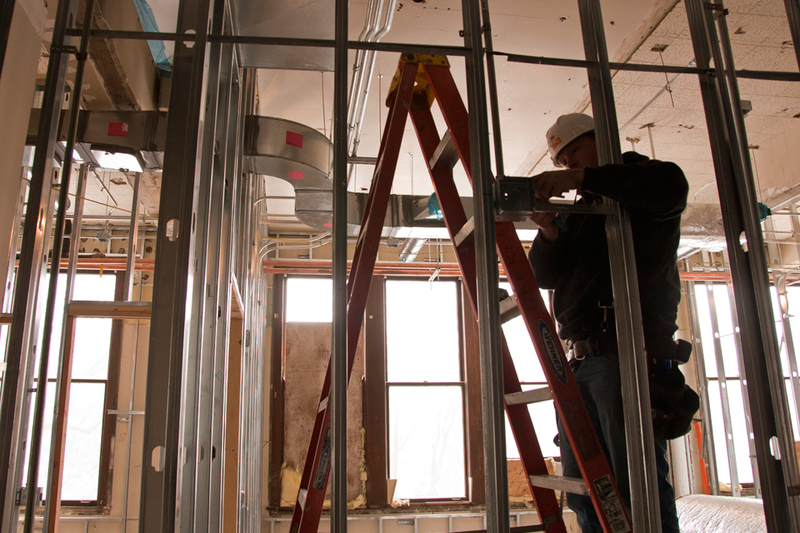 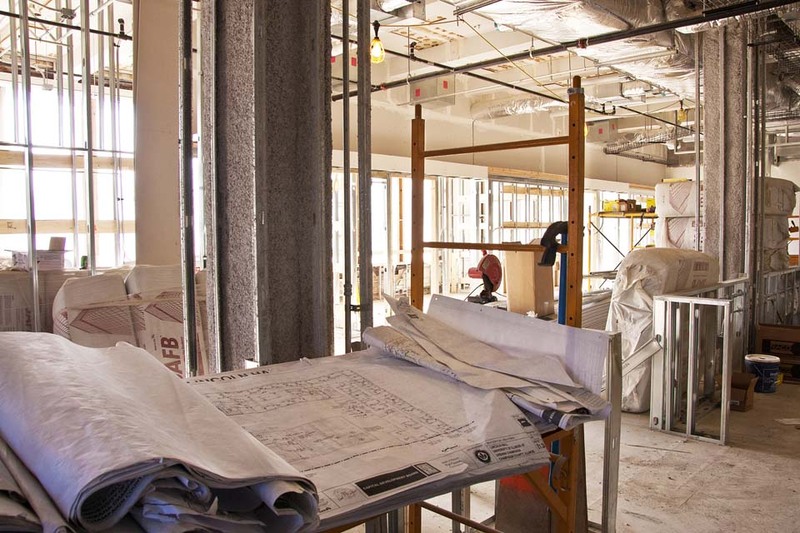 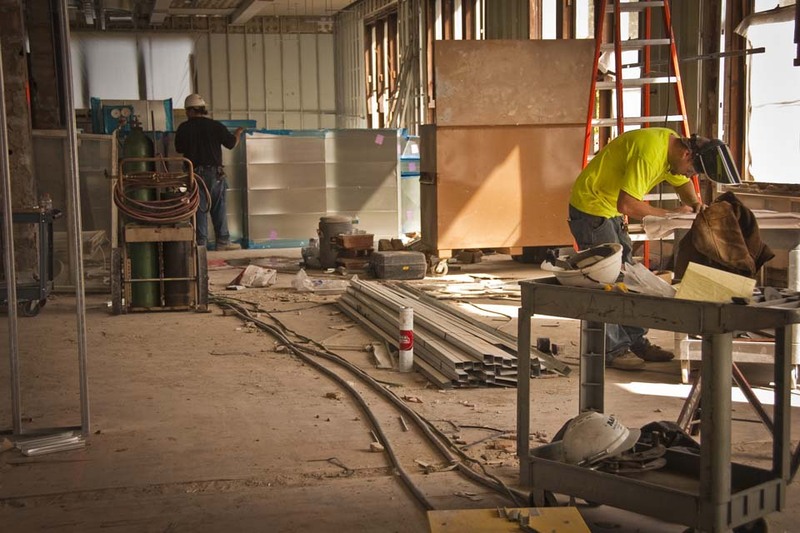 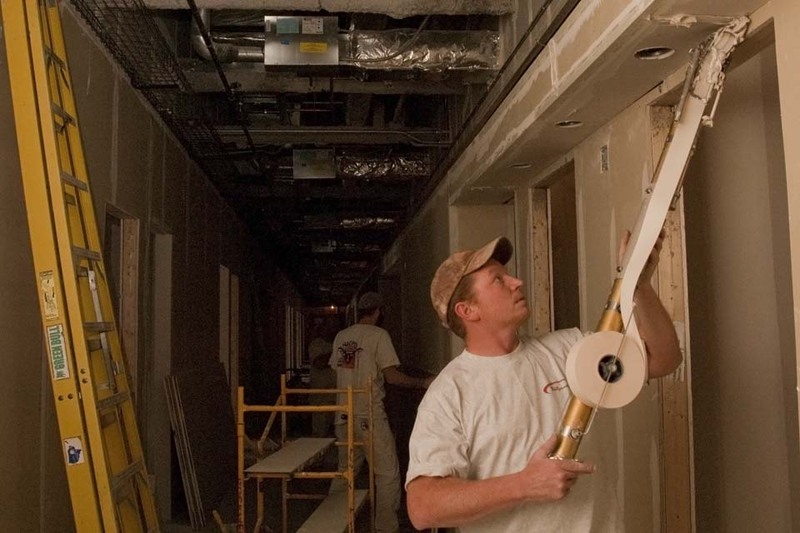 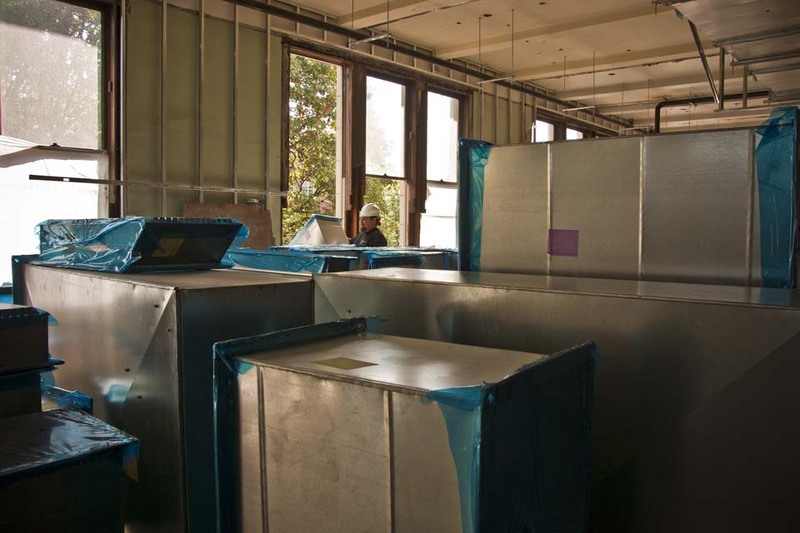 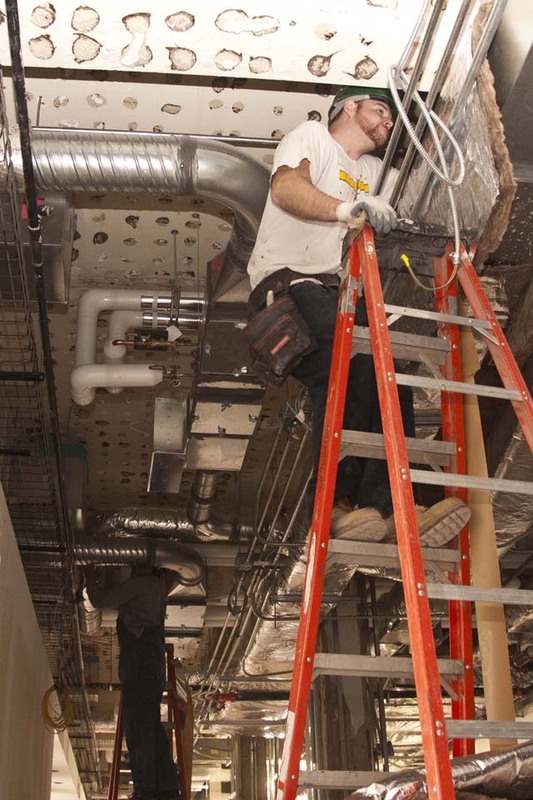 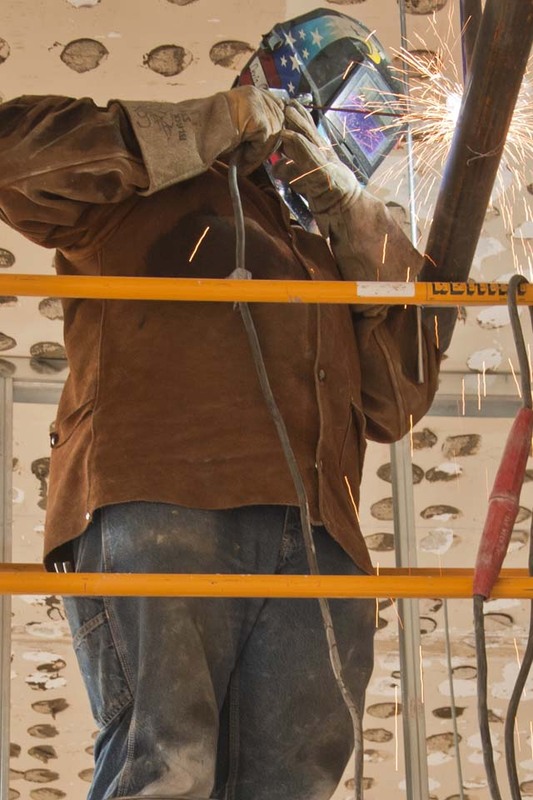 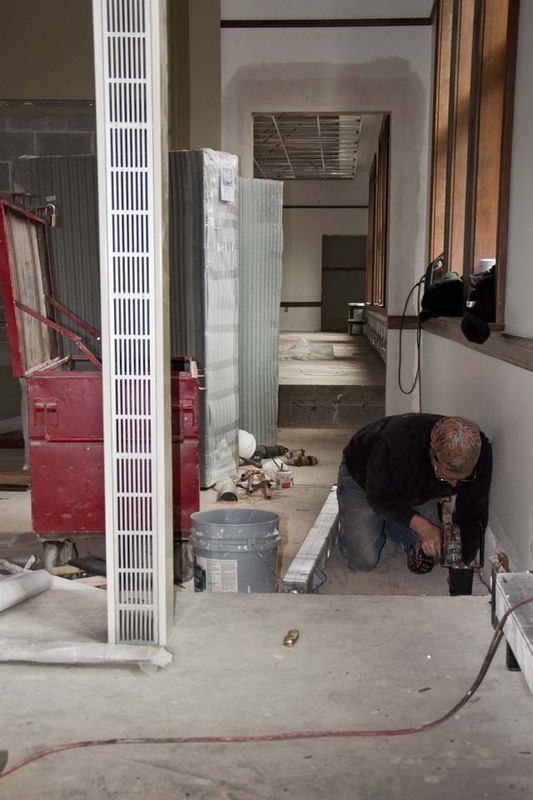 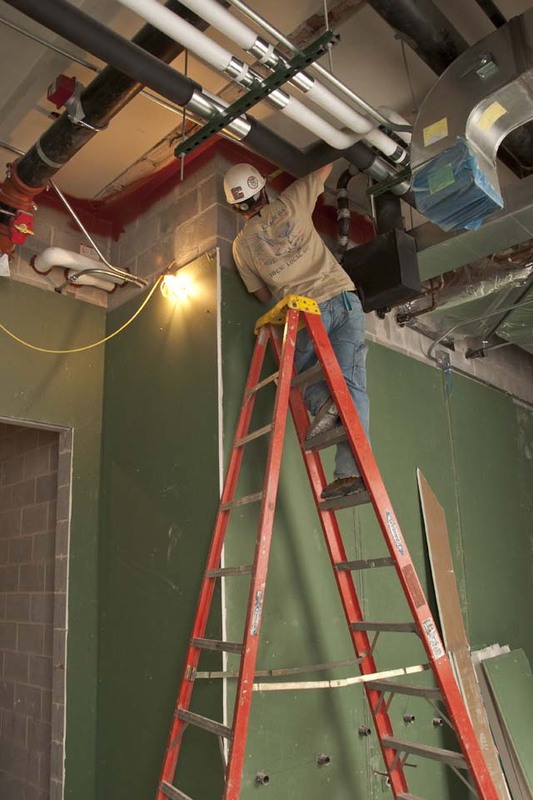 The mechanical and drywall contractors have moved on to the second floor, where the framing is nearly complete and they are finishing the installation of ductwork and piping. 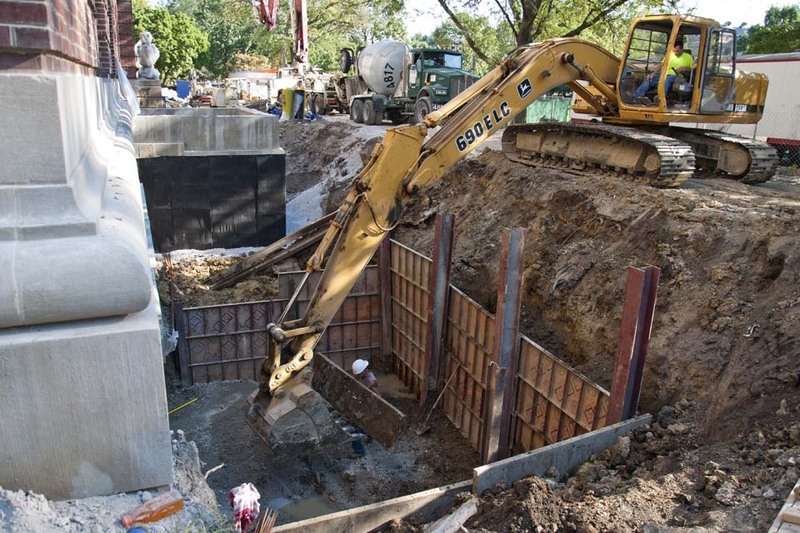 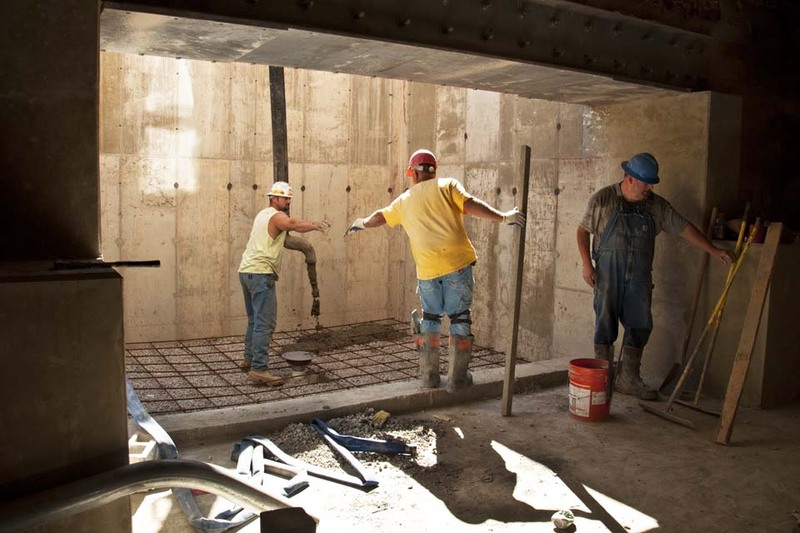 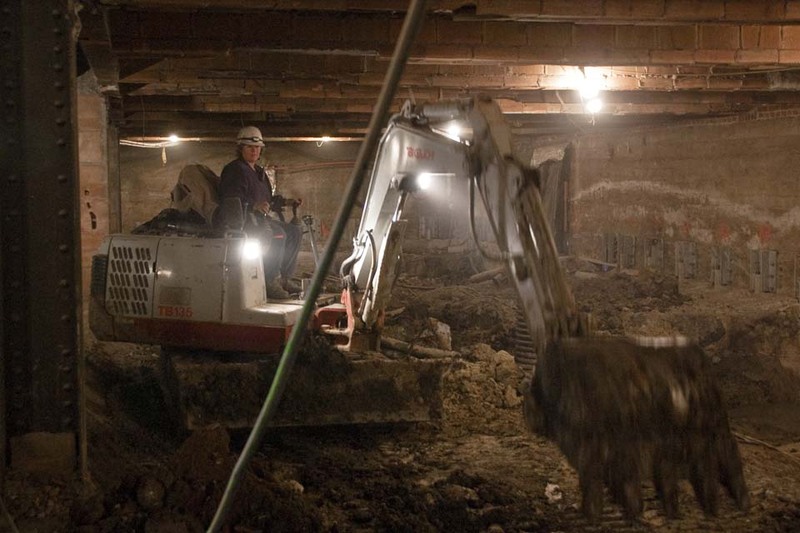 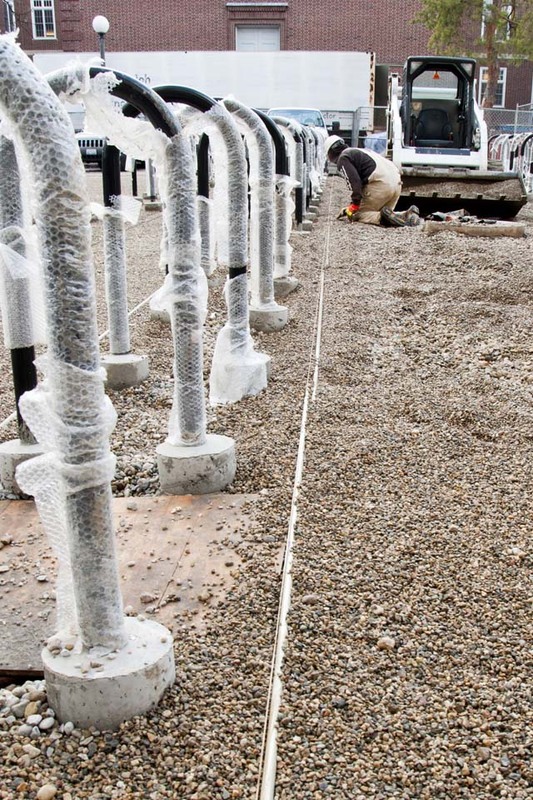 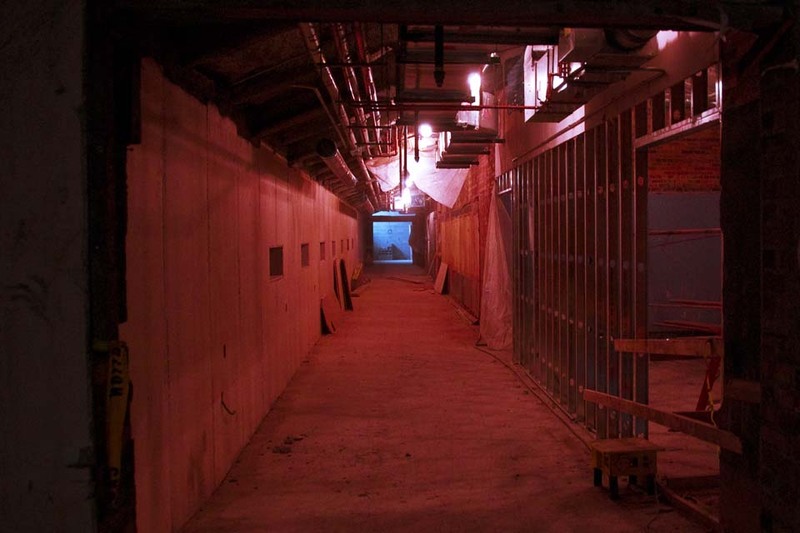 Contractors made significant progress in excavating the basement, which must be deepened by several feet in order to accommodate the new heating and cooling systems. 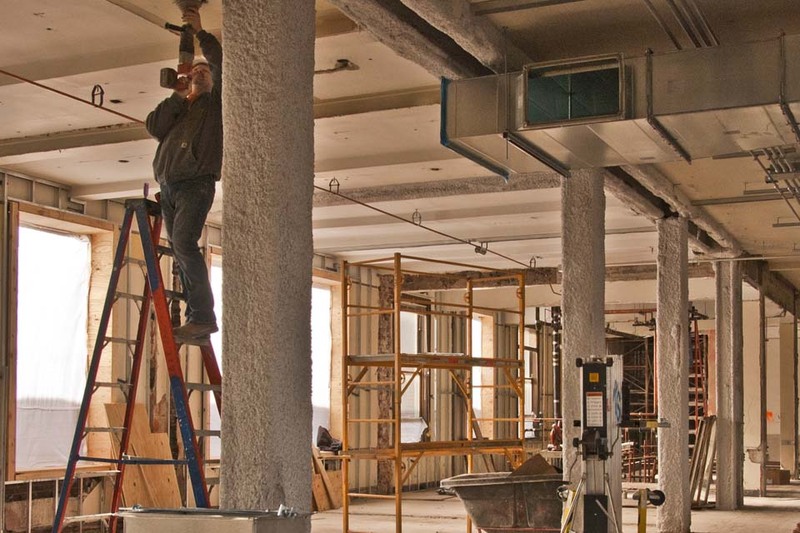 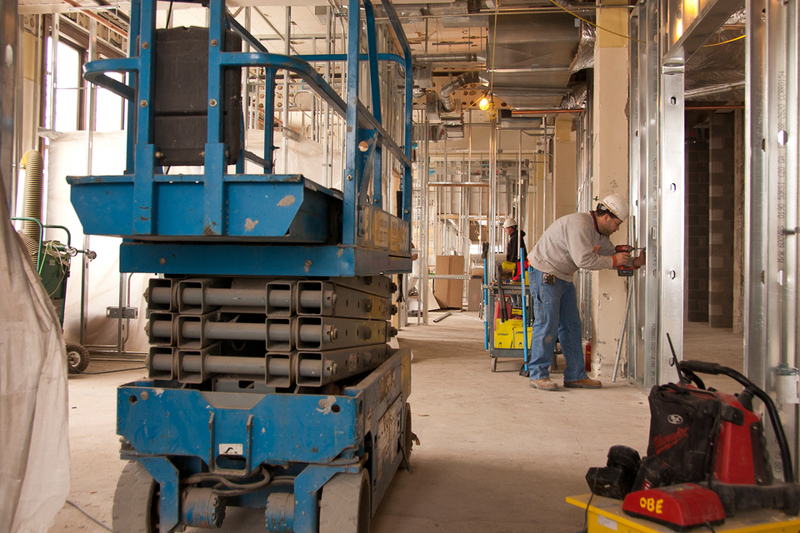 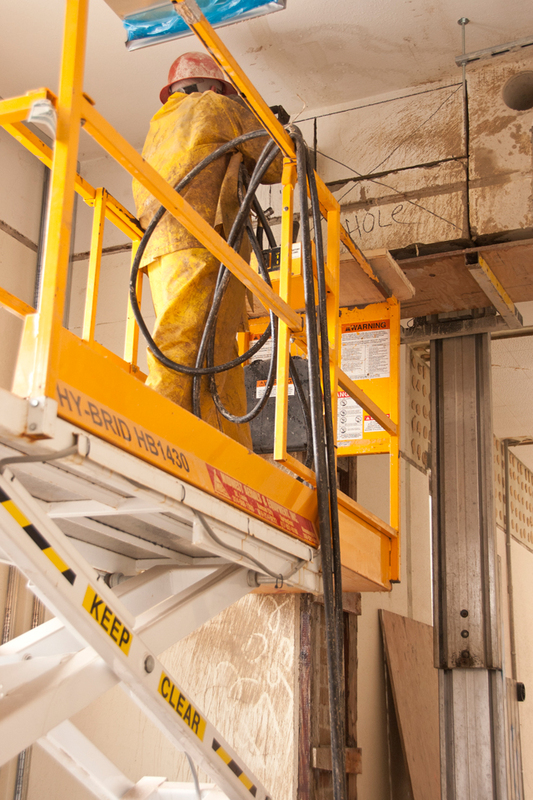 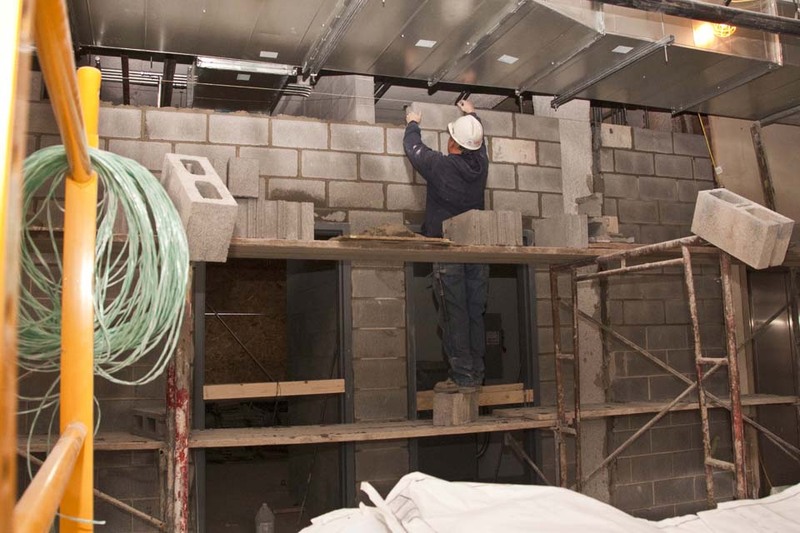 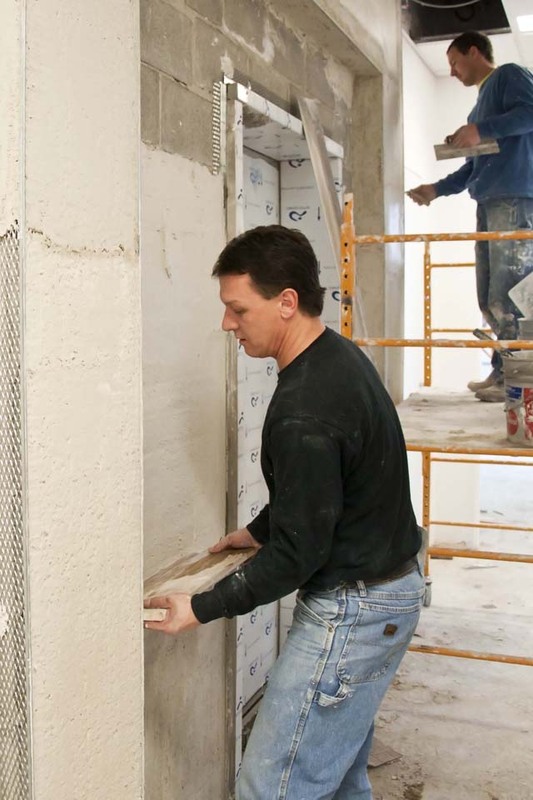 The workers have also been laying concrete block and installing drywall on the upper floors. 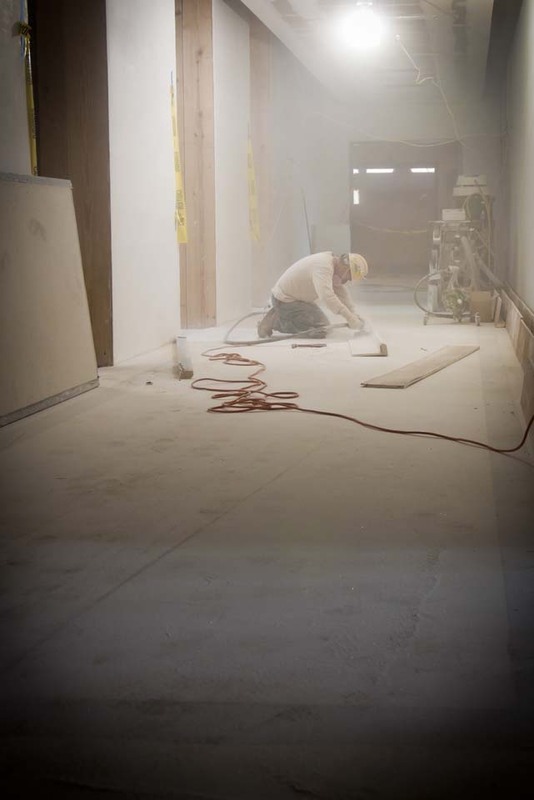 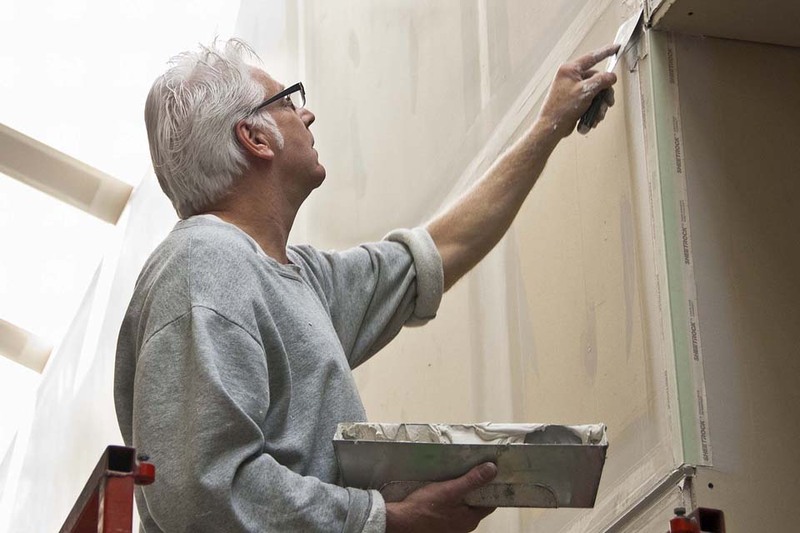 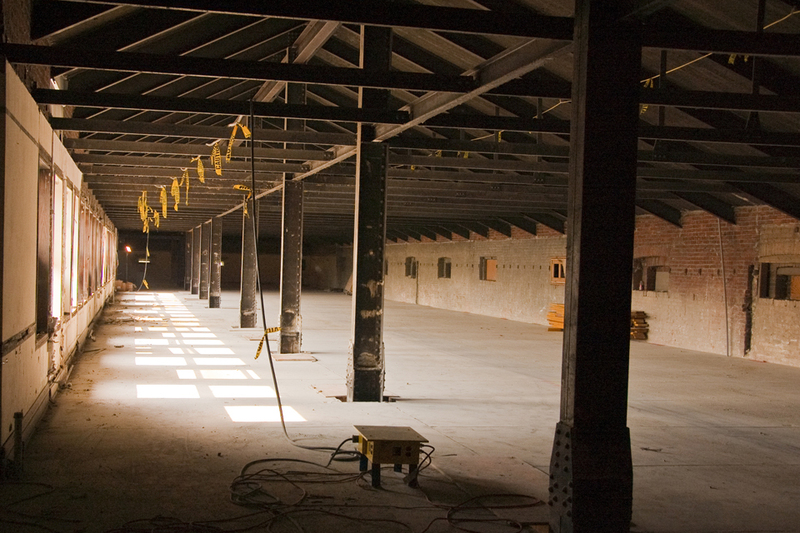 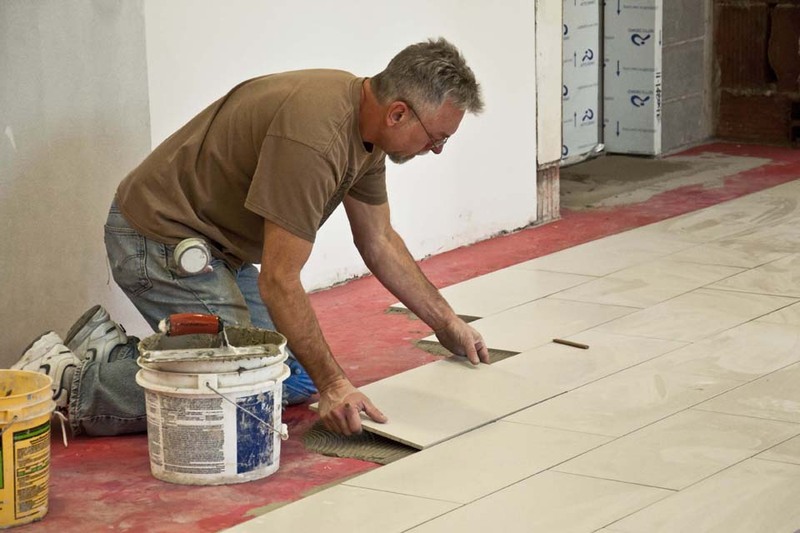 In many areas it is now possible to imagine how some of the finished spaces will look. 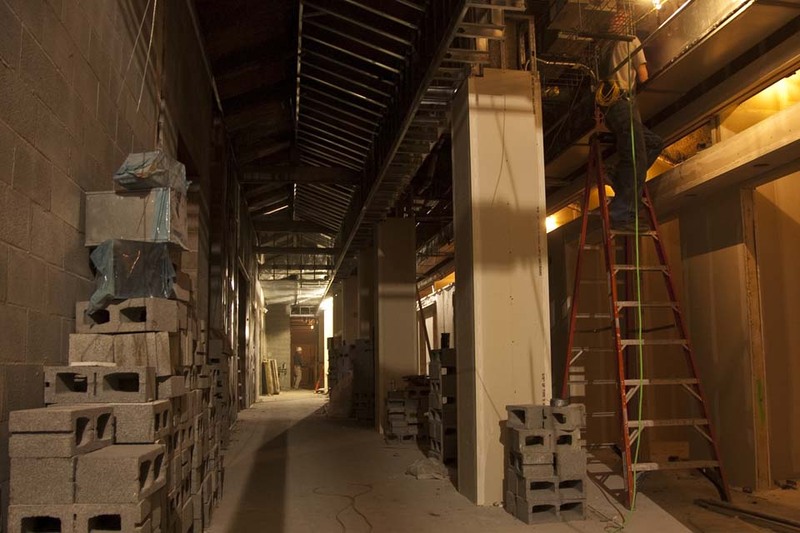 Other areas still appear eerily different. 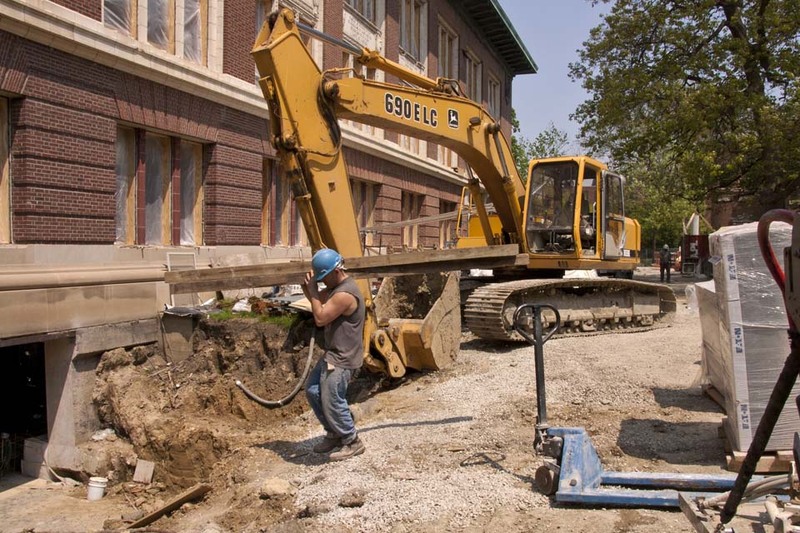 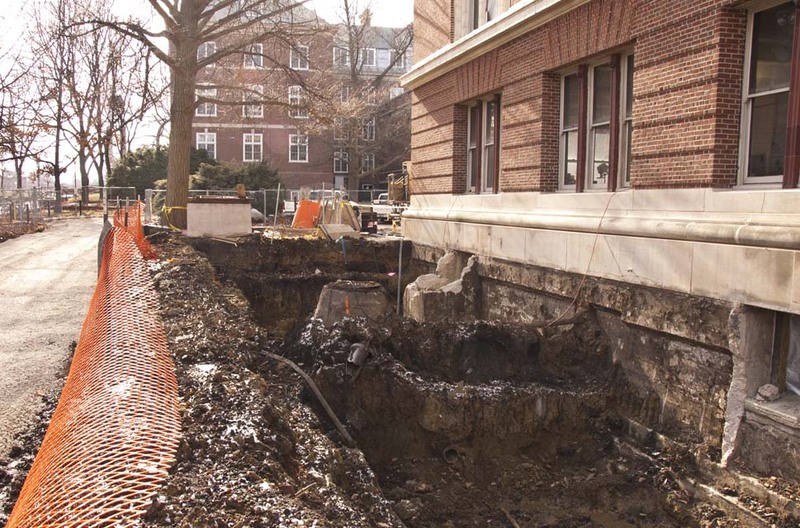 Plumbers continued to rough in the plumbing on the first, second, and third floors while area wells were excavated on the east exterior of the building (Quad side). 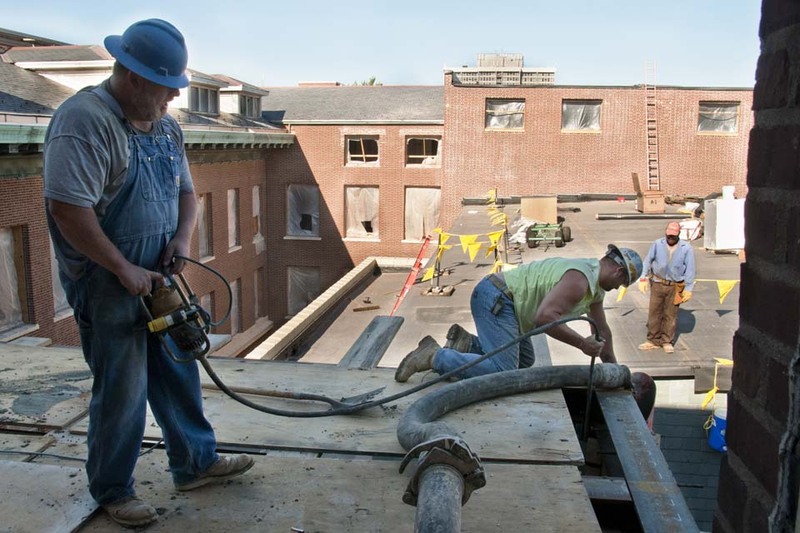 The building is being enclosed for the winter, with temporary steam and electric powered heaters being installed throughout. 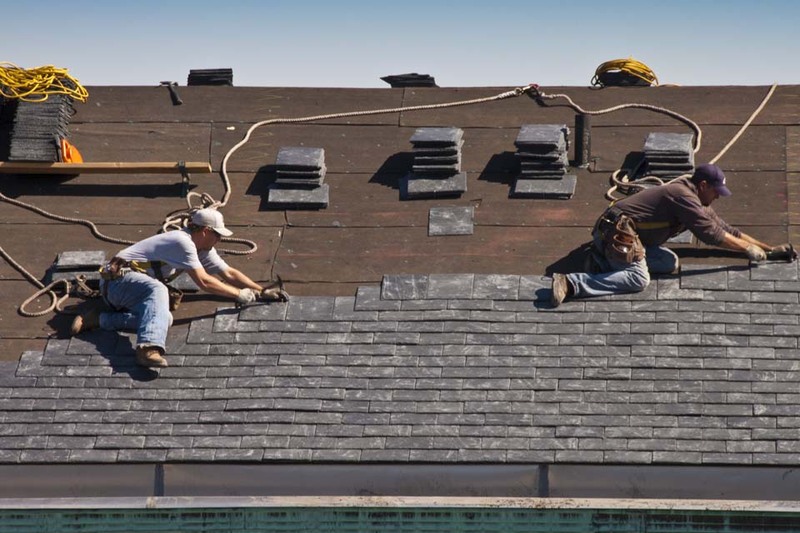 Work continued on the roof as new slate tiles were nailed to the roof. 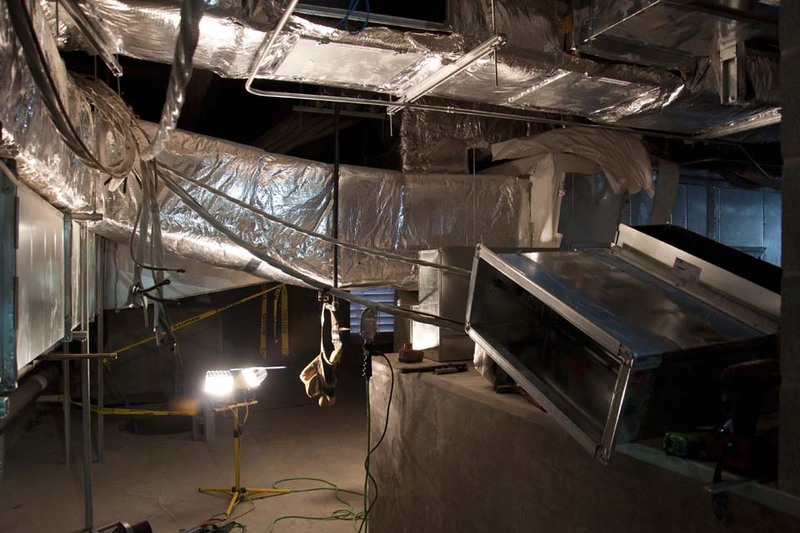 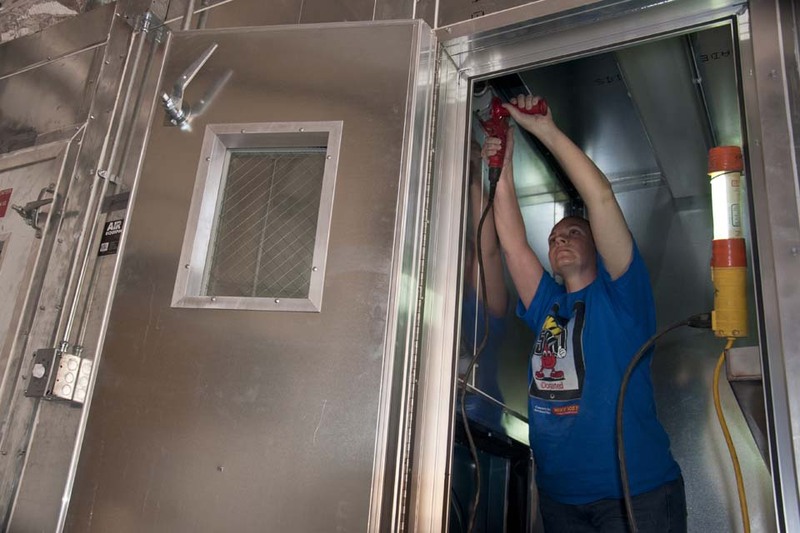 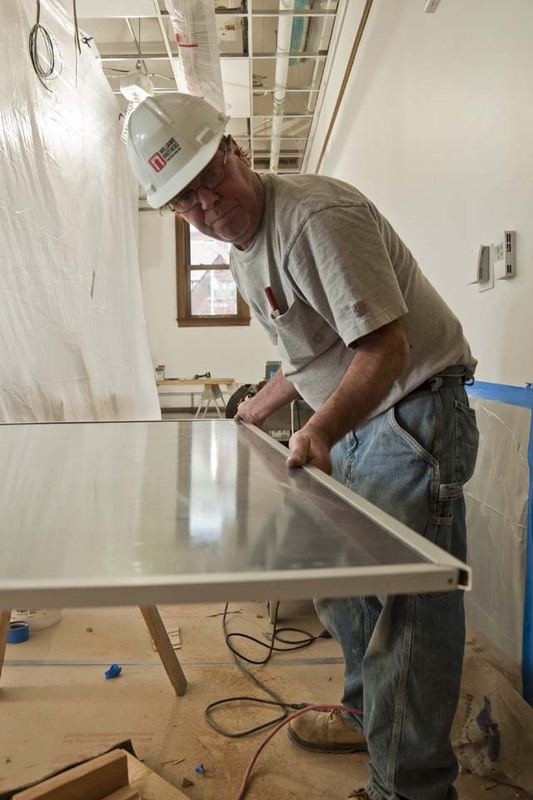 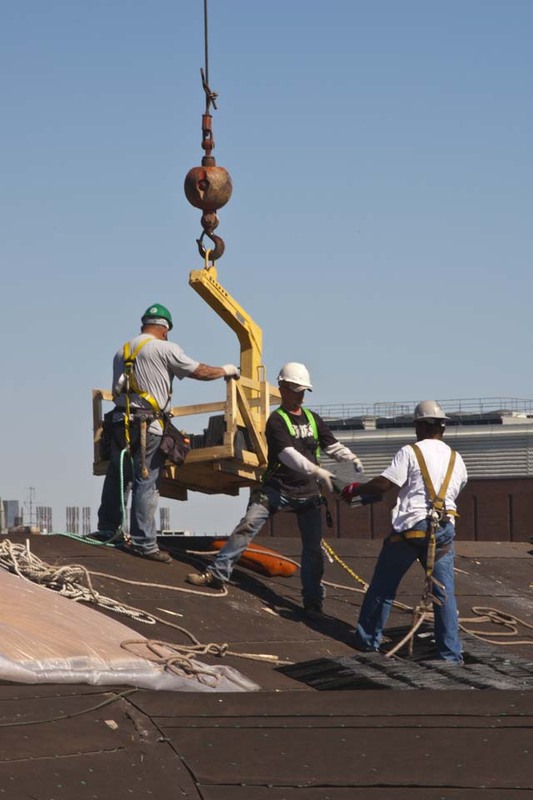 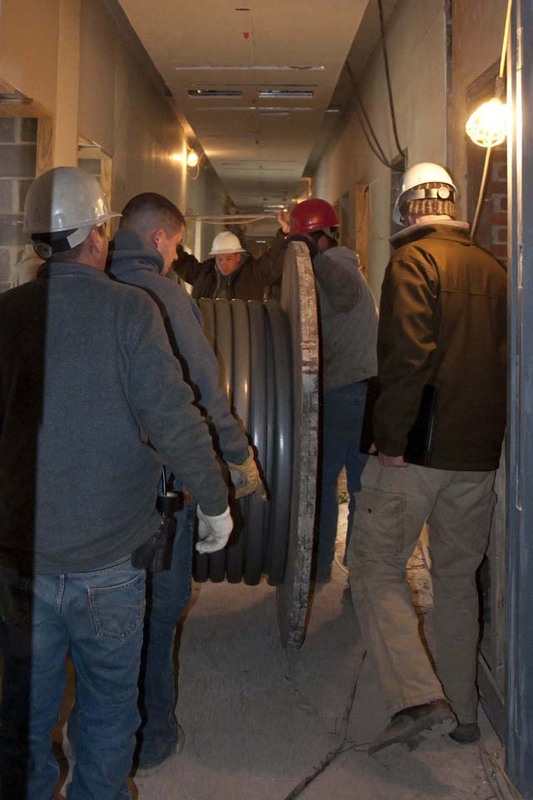 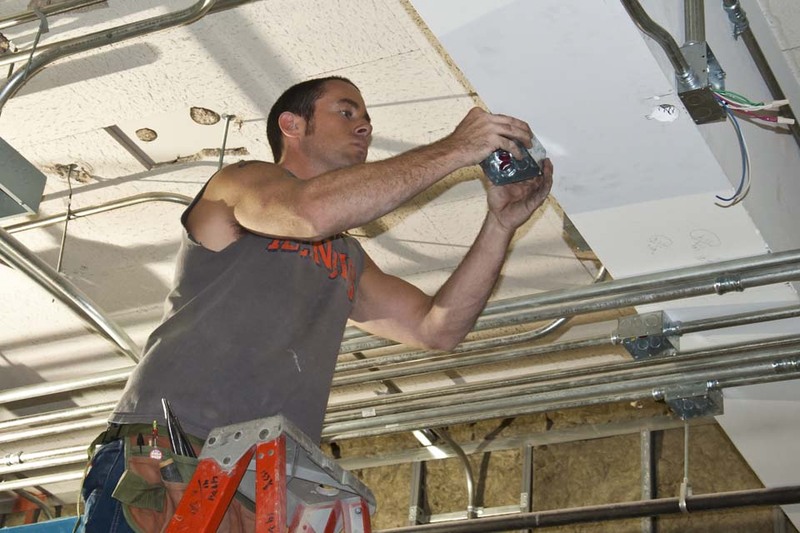 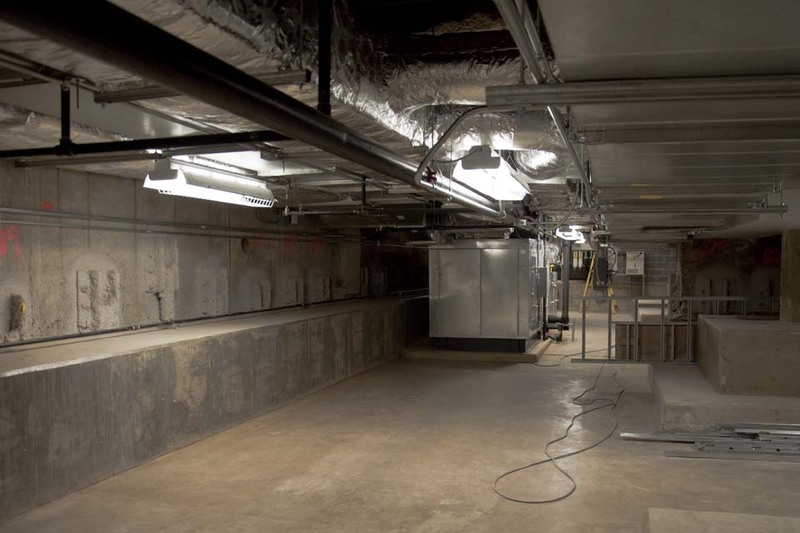 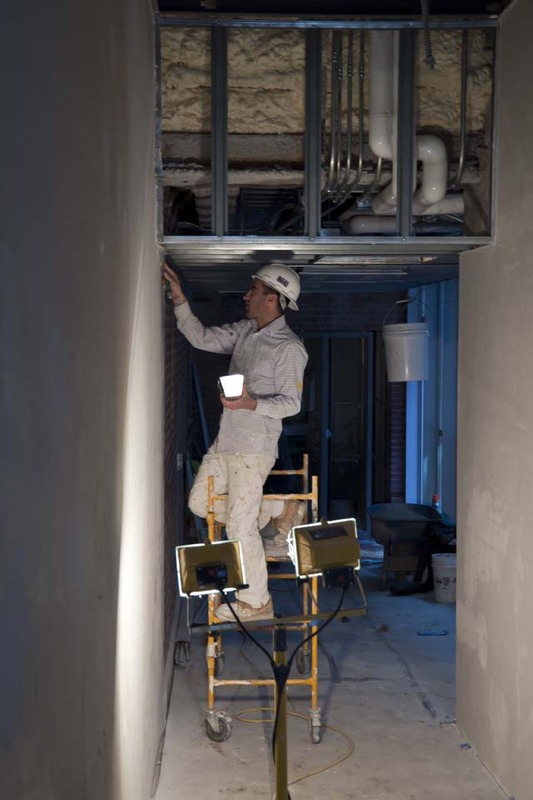 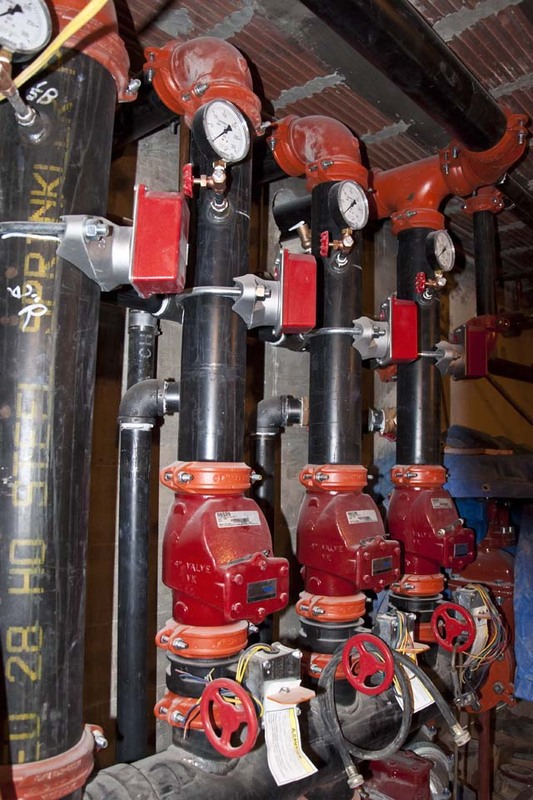 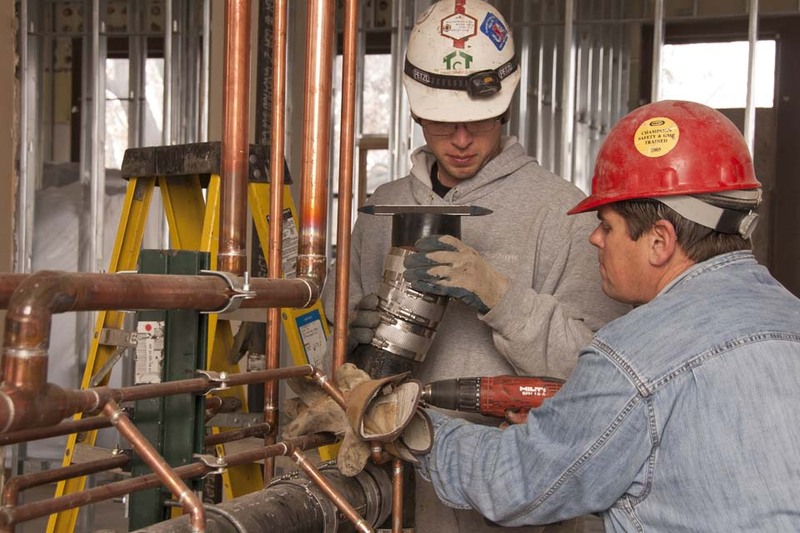 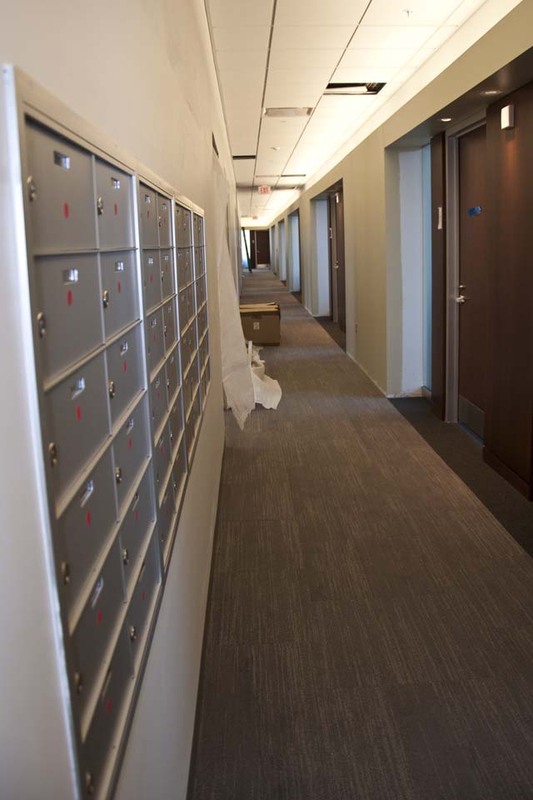 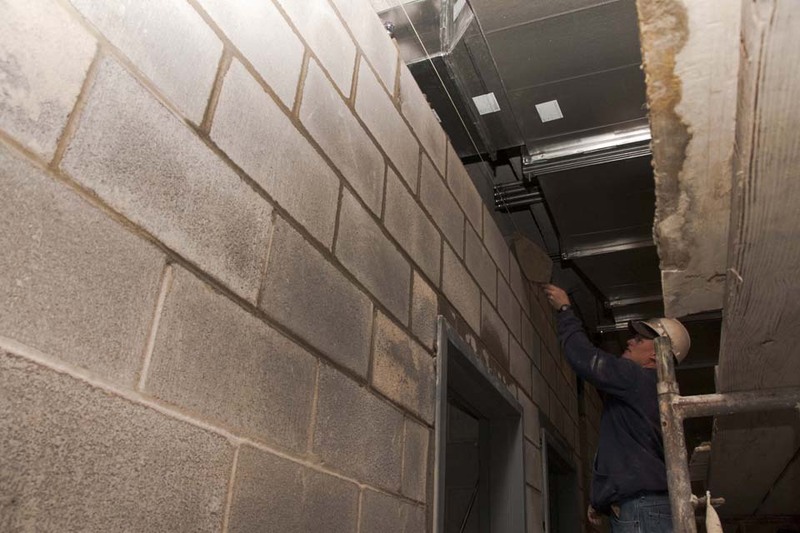 The contractors also continued with the ventilation, mechanical, and plumbing work. 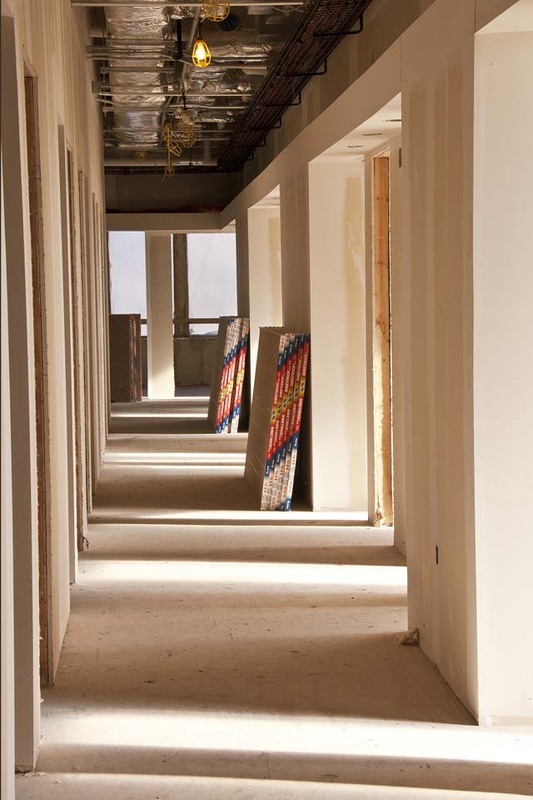 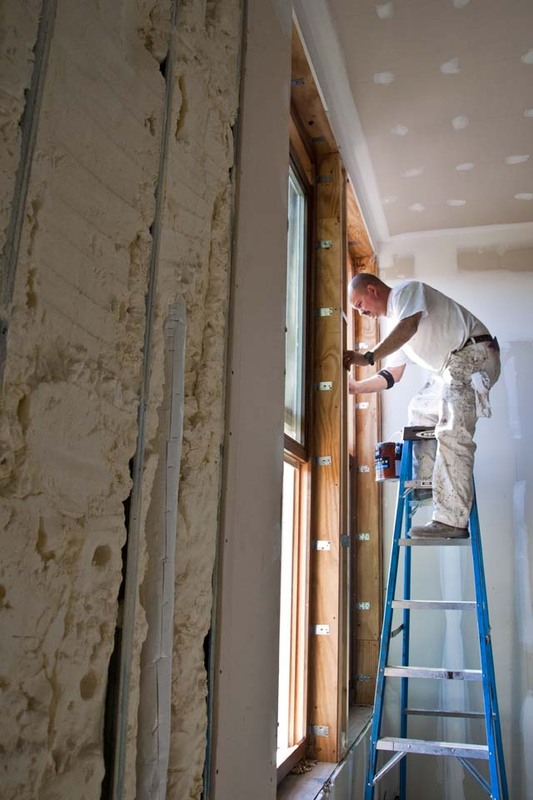 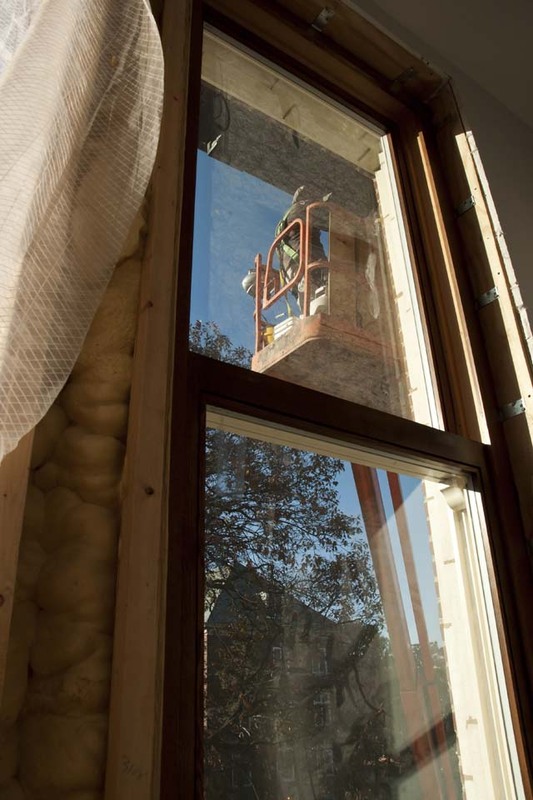 Insulation and fire proofing was completed on the fourth floor. 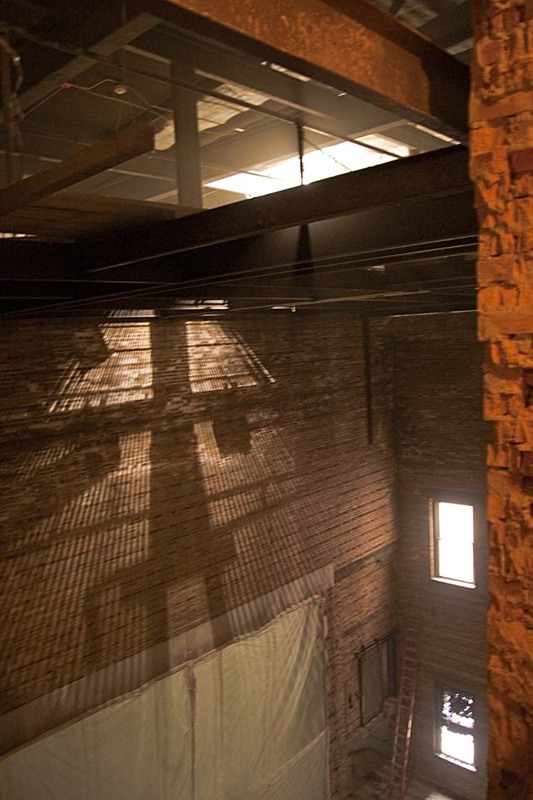 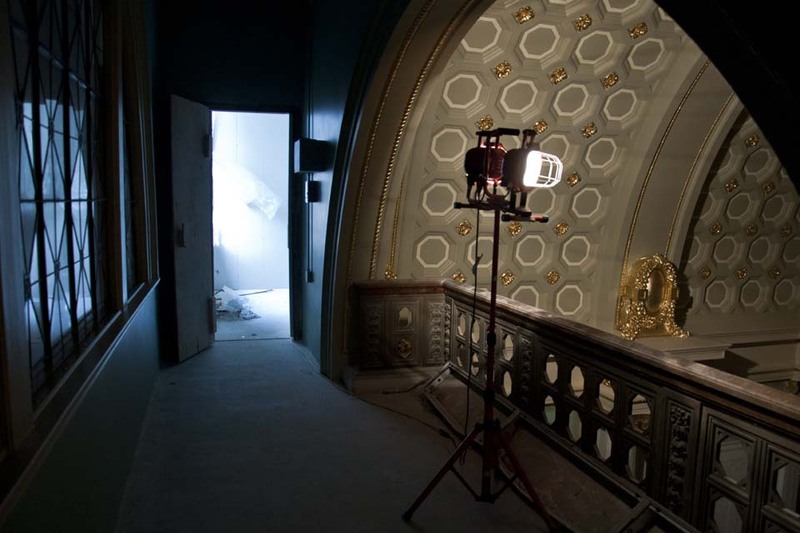 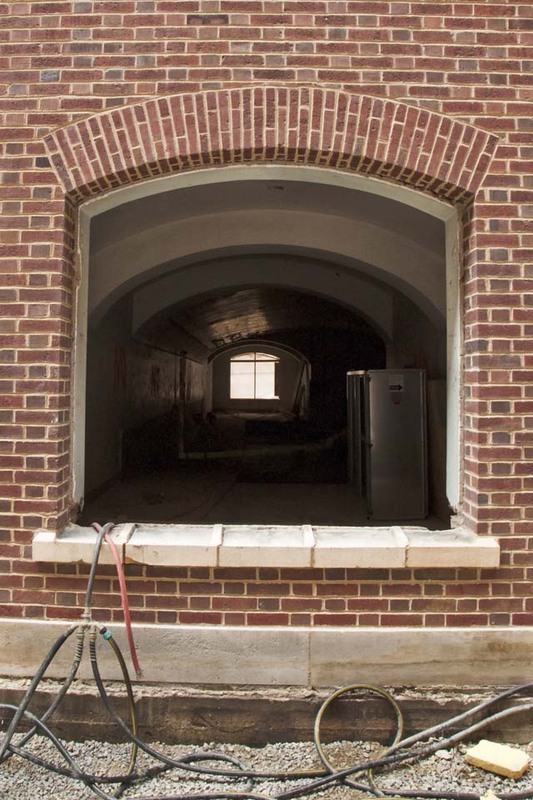 Unless you had performed on the stage in the Lincoln Hall Theater, you might have never noticed the three-and-a-half-story wall that formed a curved backdrop. 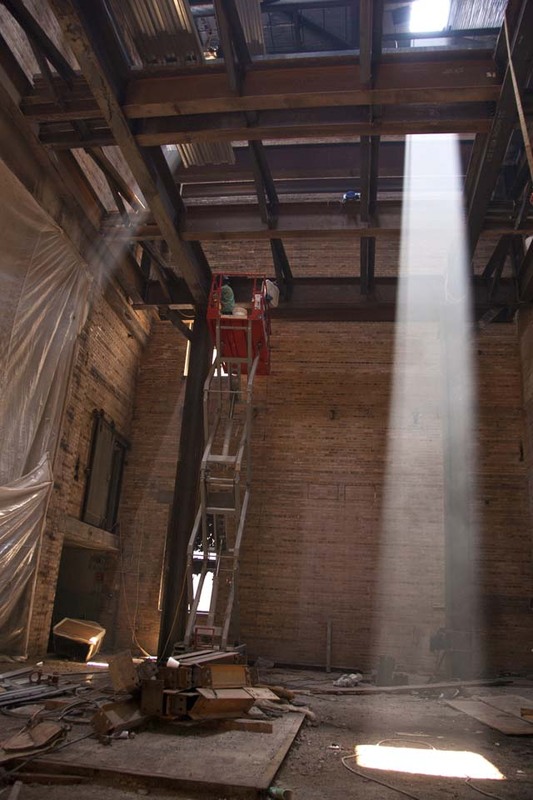 This cyclorama was once a popular way of projecting backdrops, such as skies, for scenes. 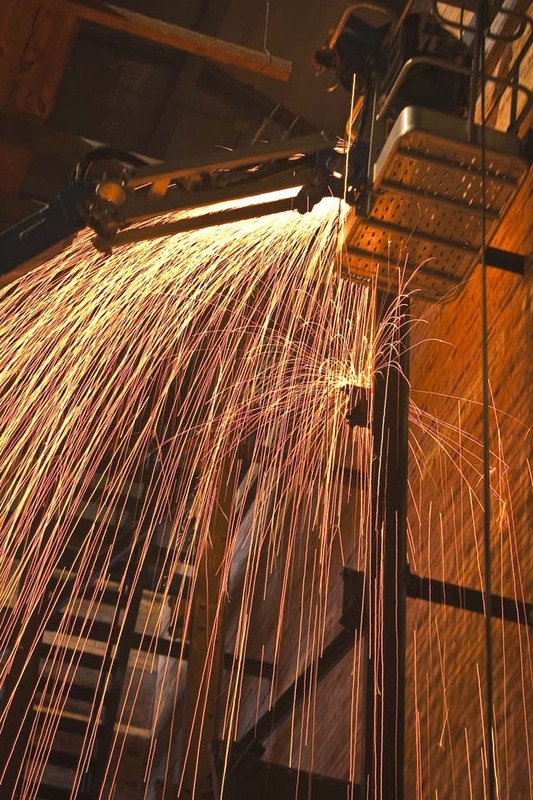 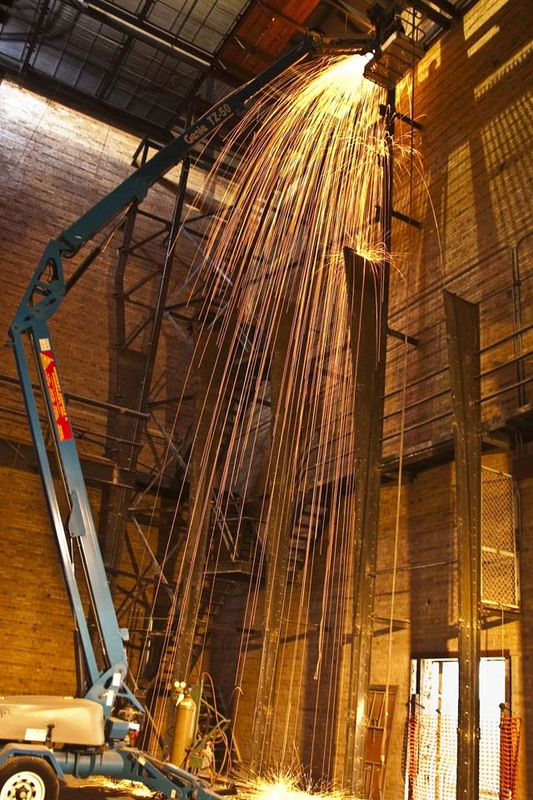 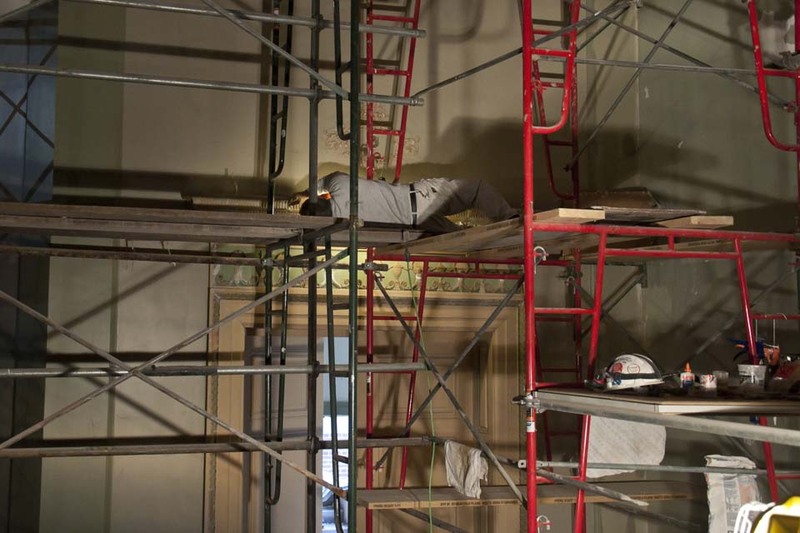 Workers dismantled the structure, which will be replaced by more modern, less space-consuming, technology. 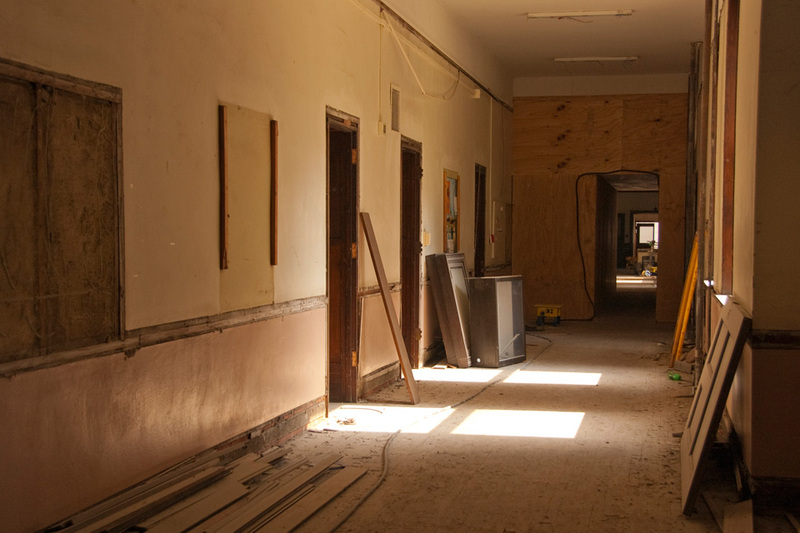 Nearly 95% of the wood trim, doors, and frames have been removed. 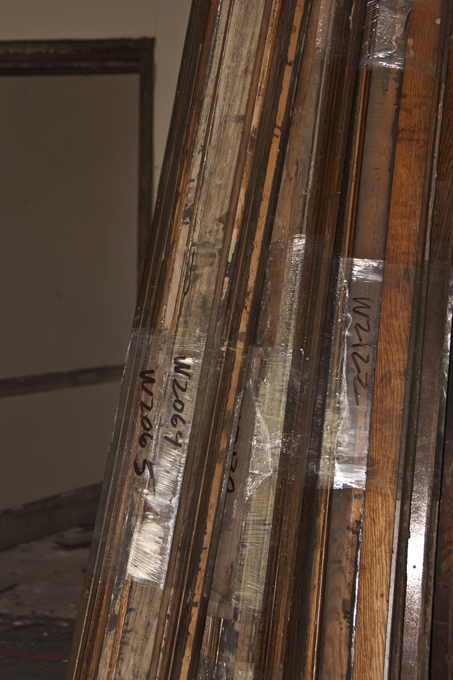 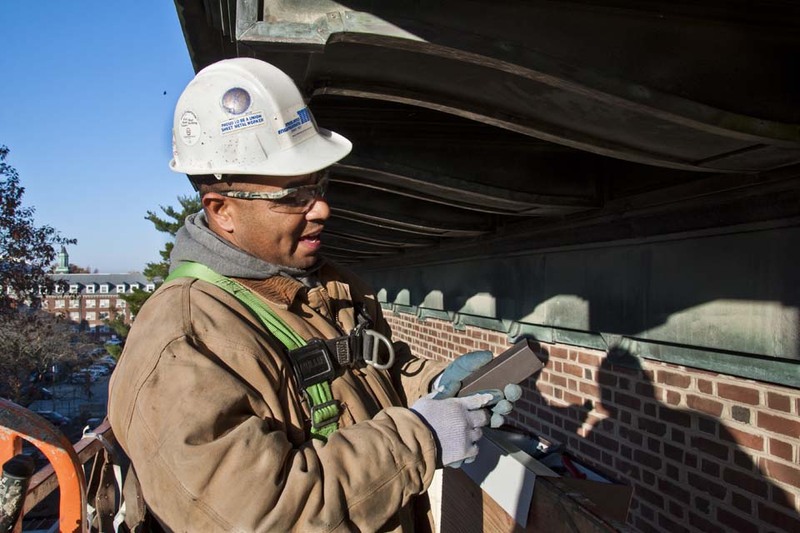 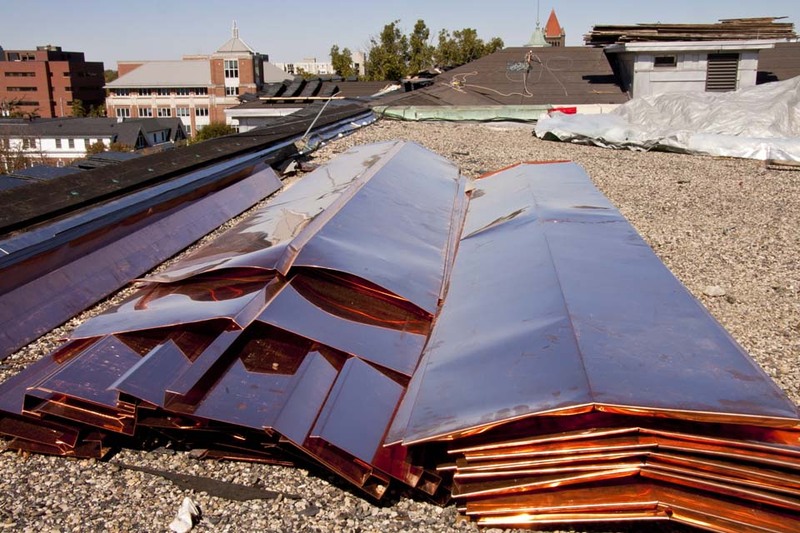 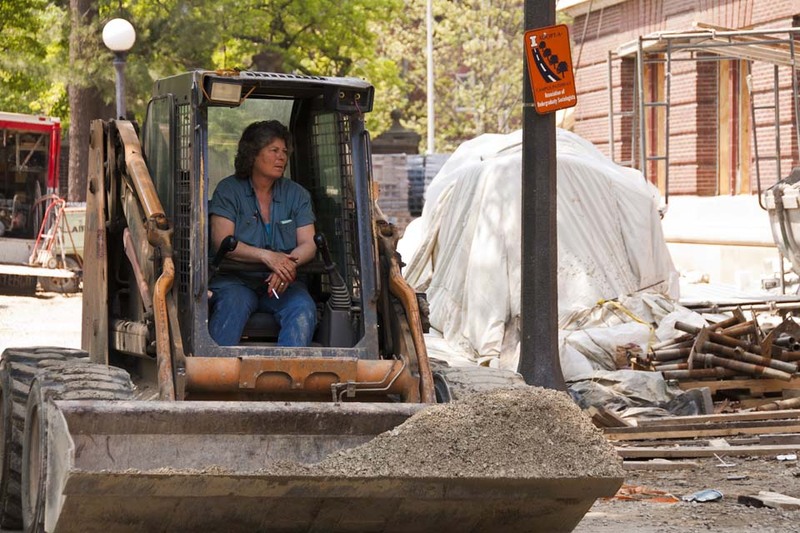 And at this point, nearly 95% of all materials removed from the job have been recycled or given to local organizations. 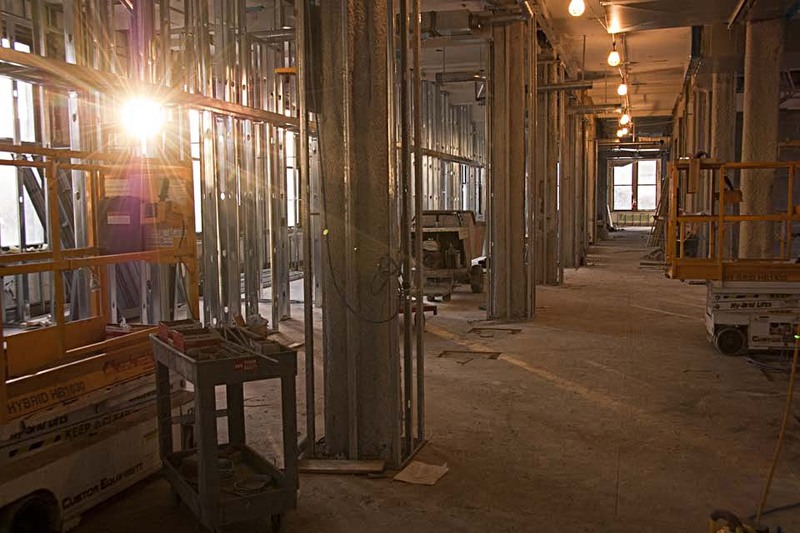 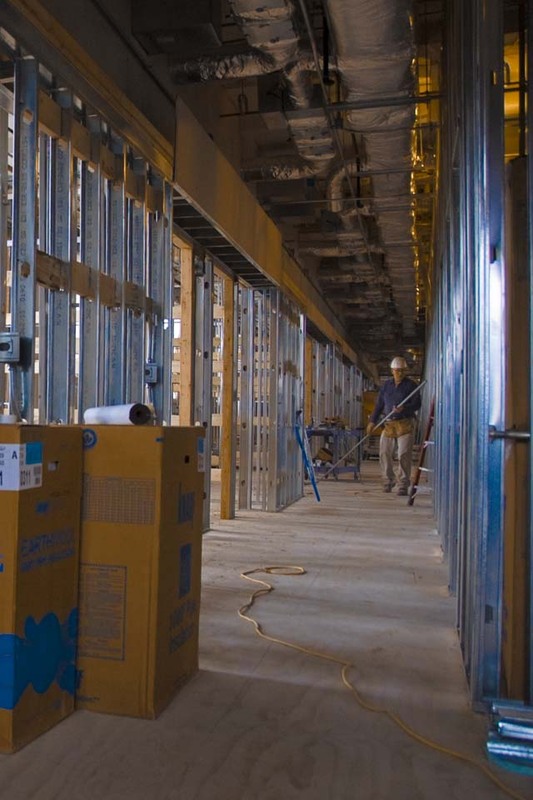 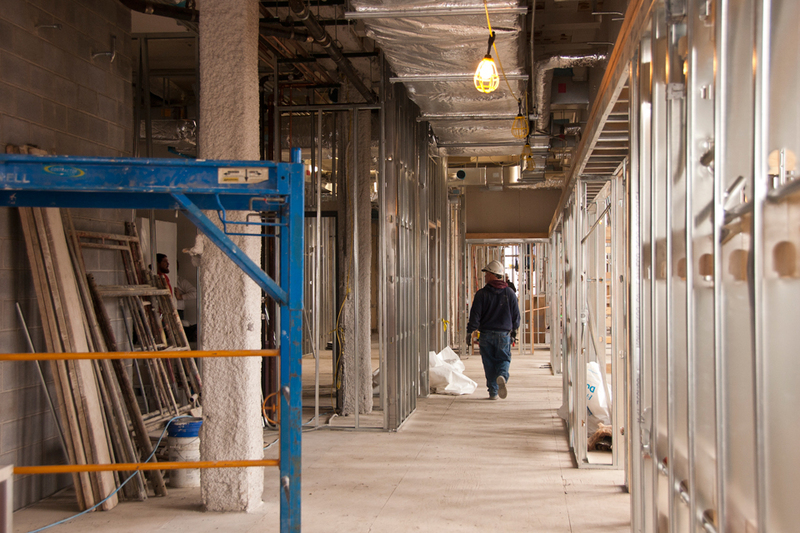 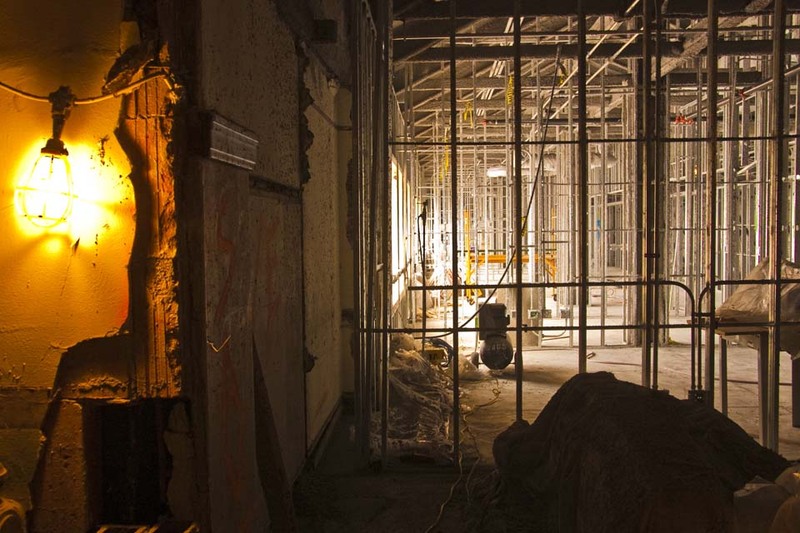 Many areas of the fourth floor have been roughed in with studs and walls, plumbing and electrical. 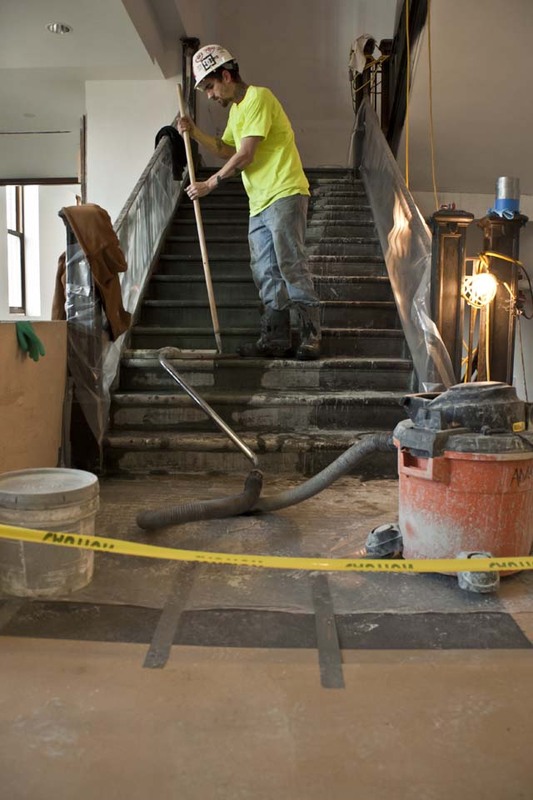 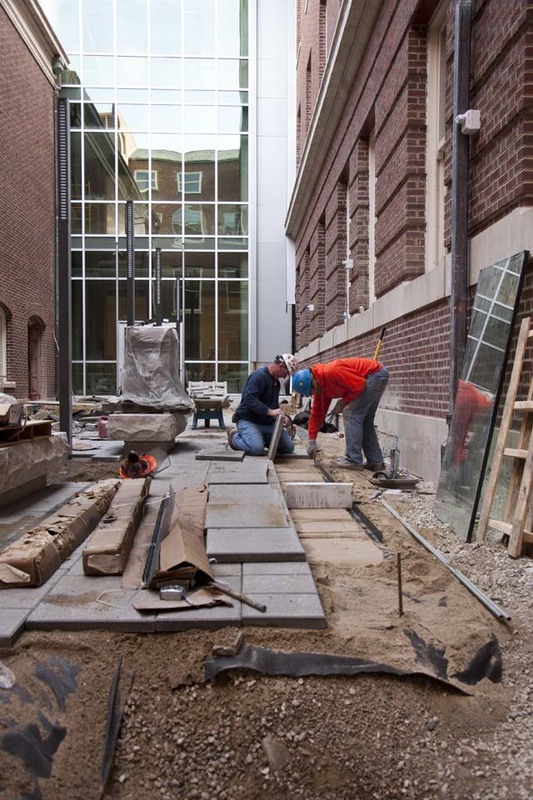 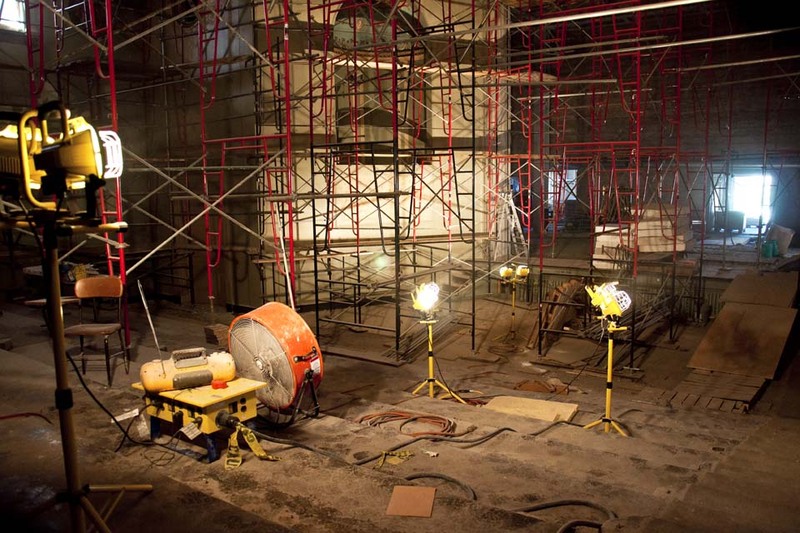 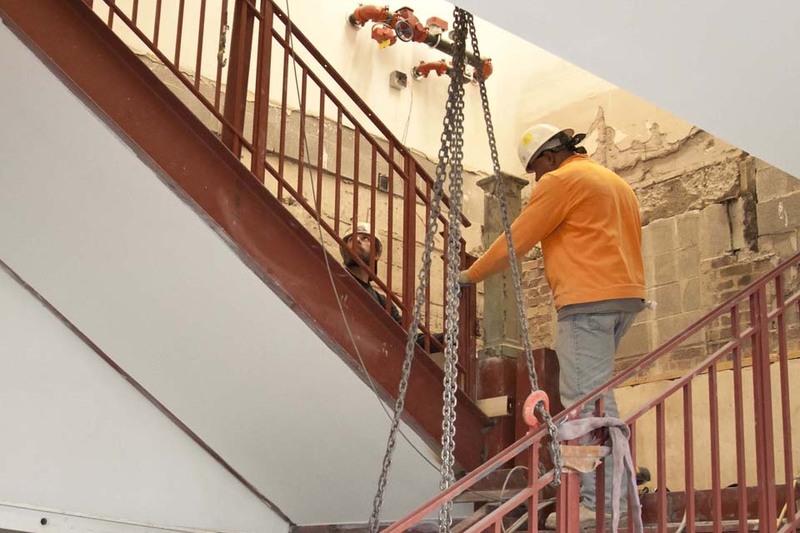 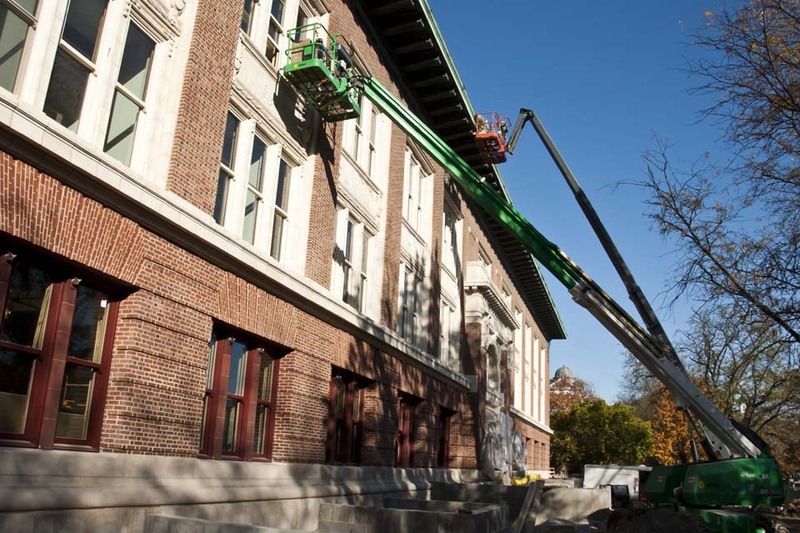 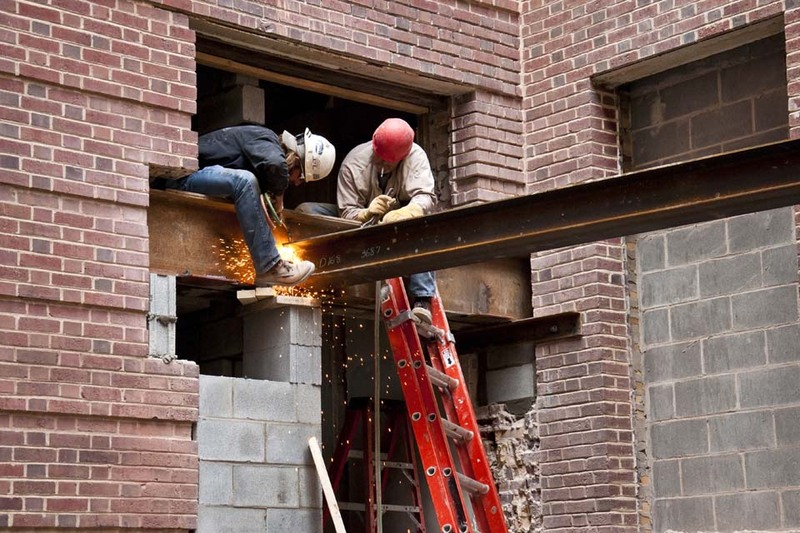 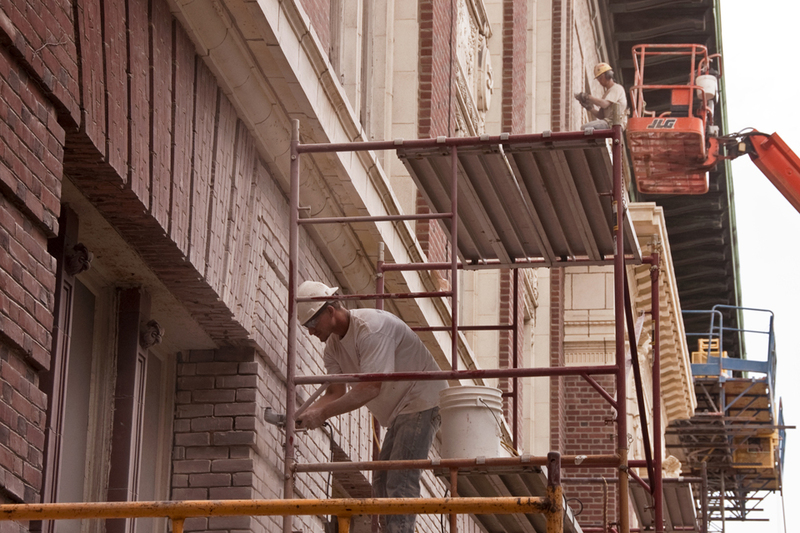 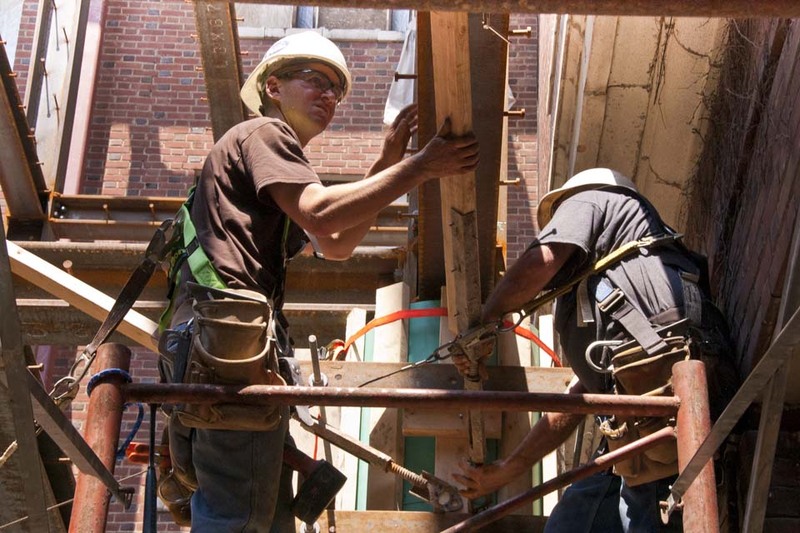 The exterior of Lincoln Hall receives a facelift as workers from Mid-Continental Restoration grind out worn mortar between bricks prior to repairing it. 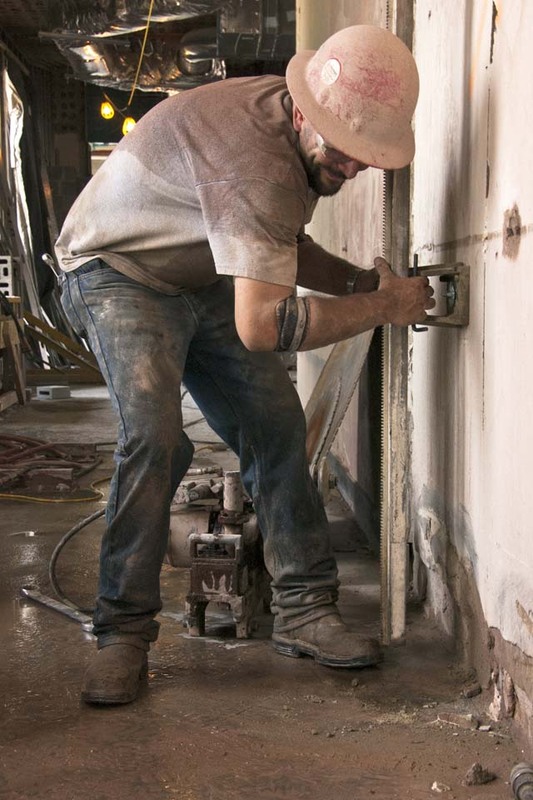 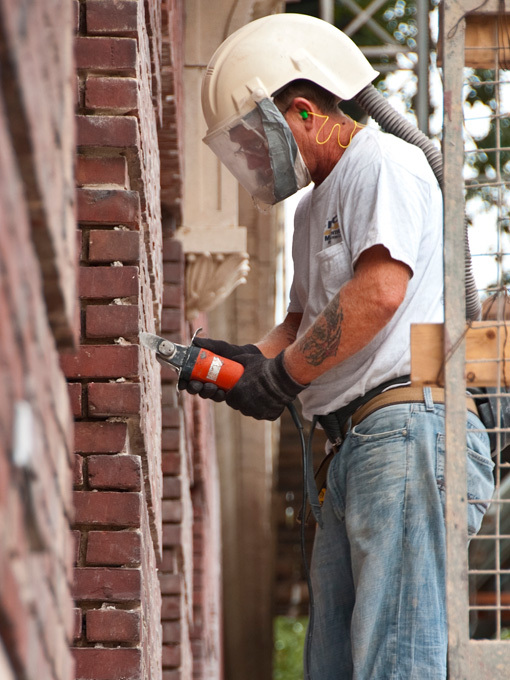 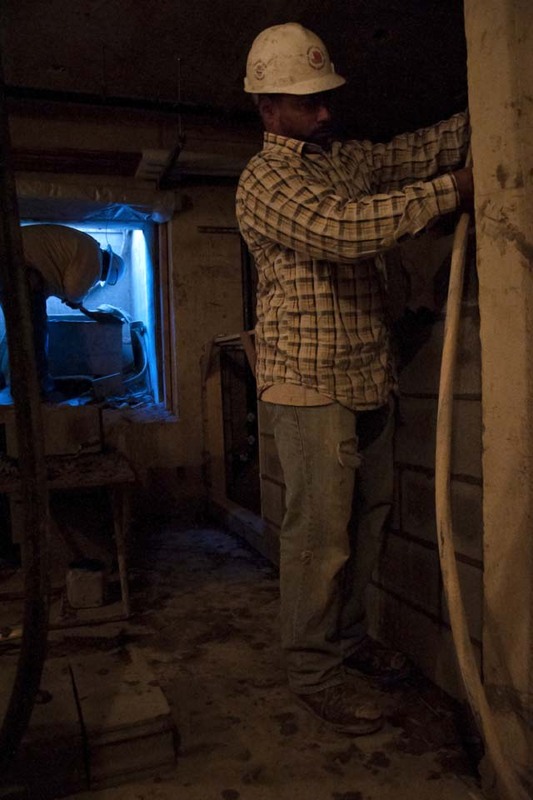 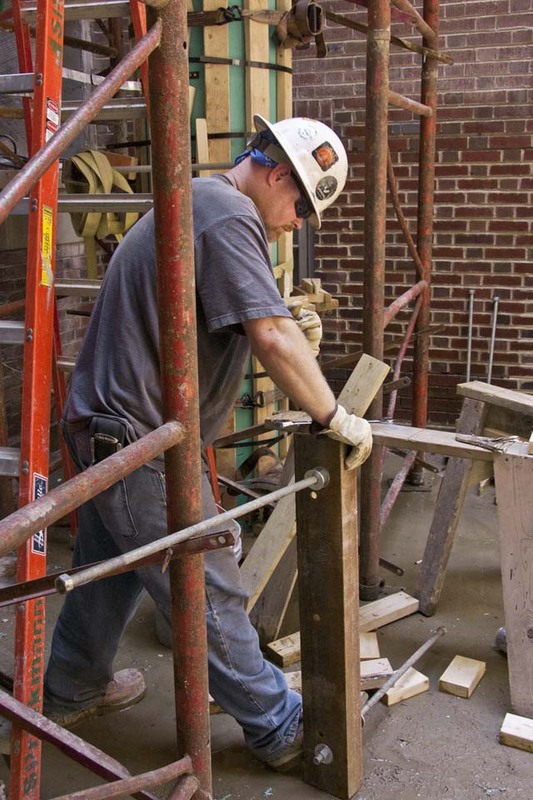 The masons completed training in historic masonry techniques before beginning the work so that they would tool the mortar in the manner consistent with the practices common a century ago. 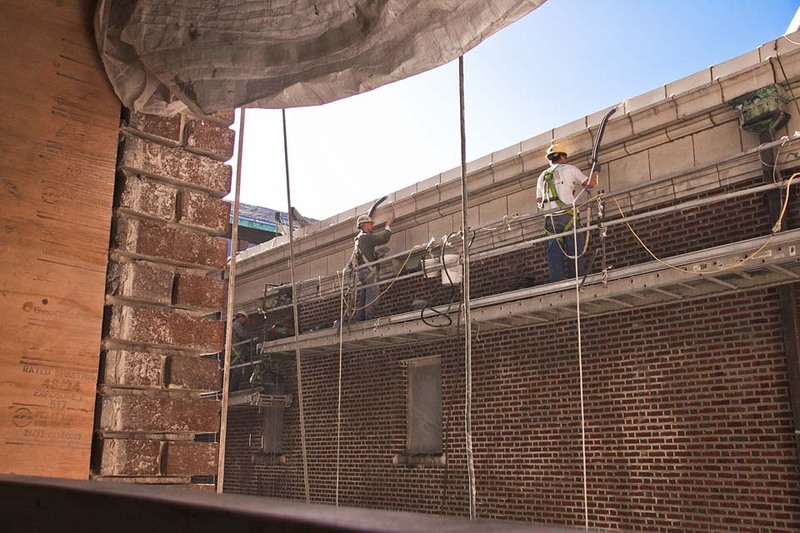 New slate tiles were hauled up to the roof. 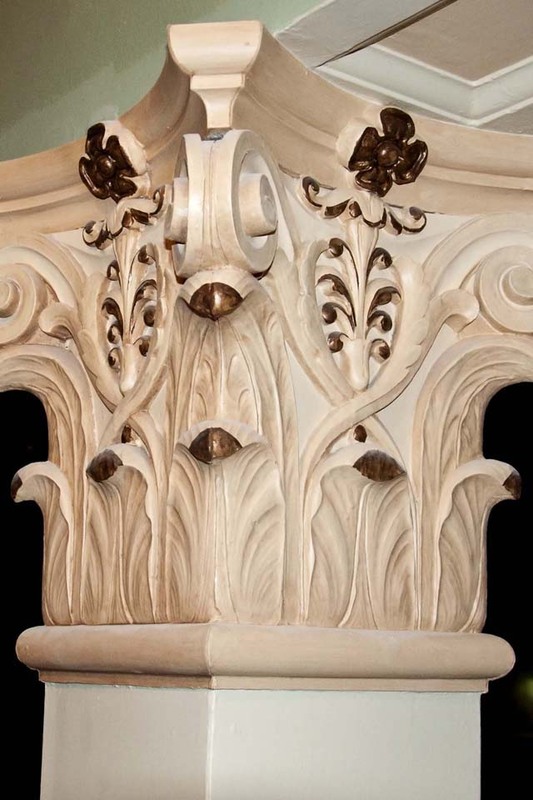 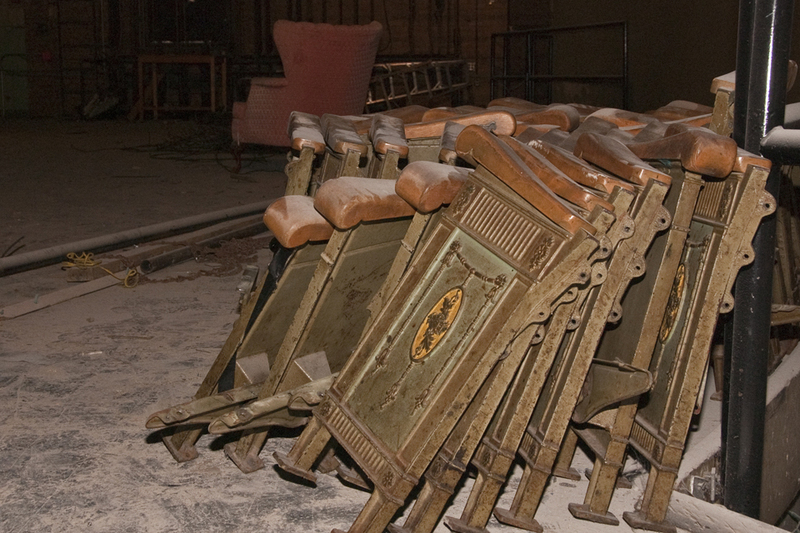 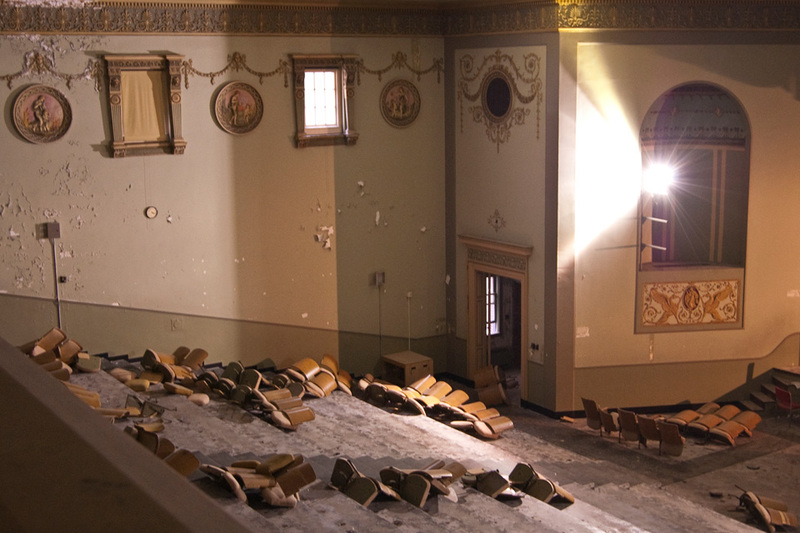 Began removing theater chairs; the ornate endcaps were set aside so they can be reused in the theater. 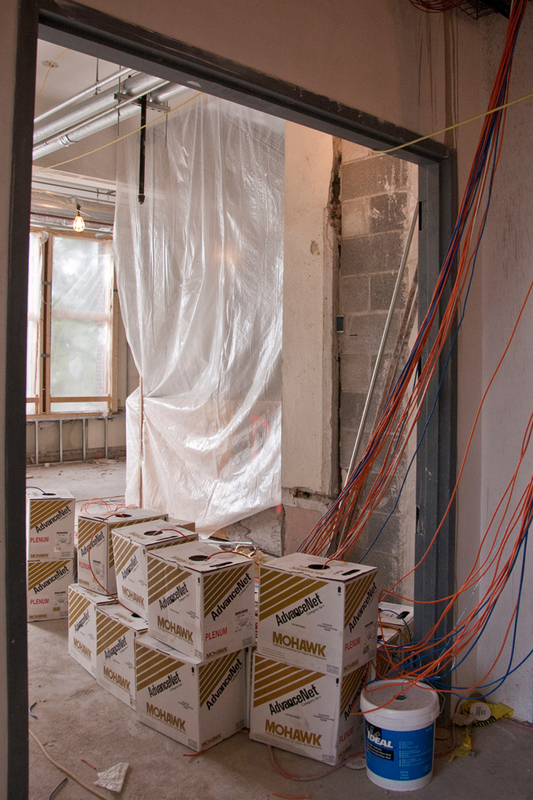 Completed electrical and wall demolition in the basement. 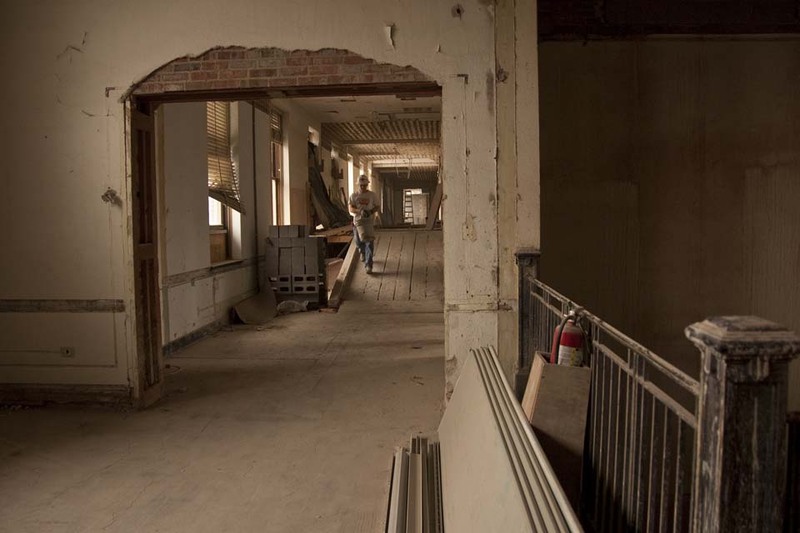 Demolition continues on the other floors and includes the removal of the wood trim. 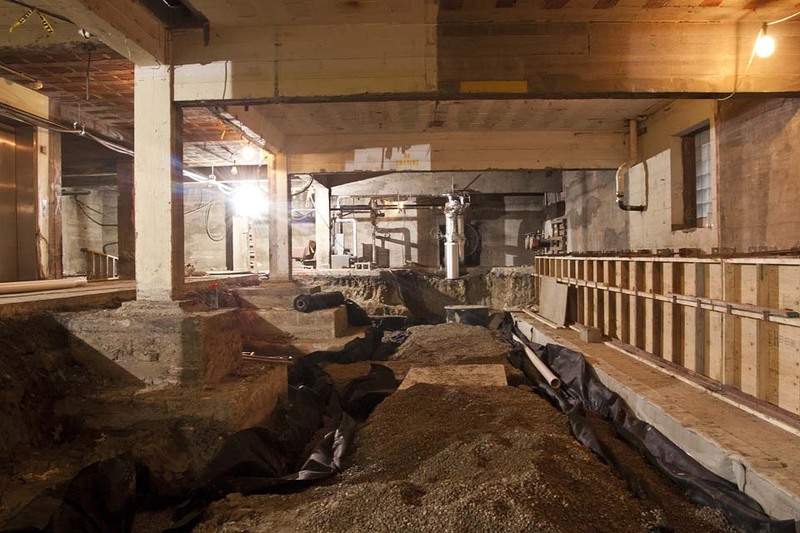 Continued demolition in the basement and 4th floor. 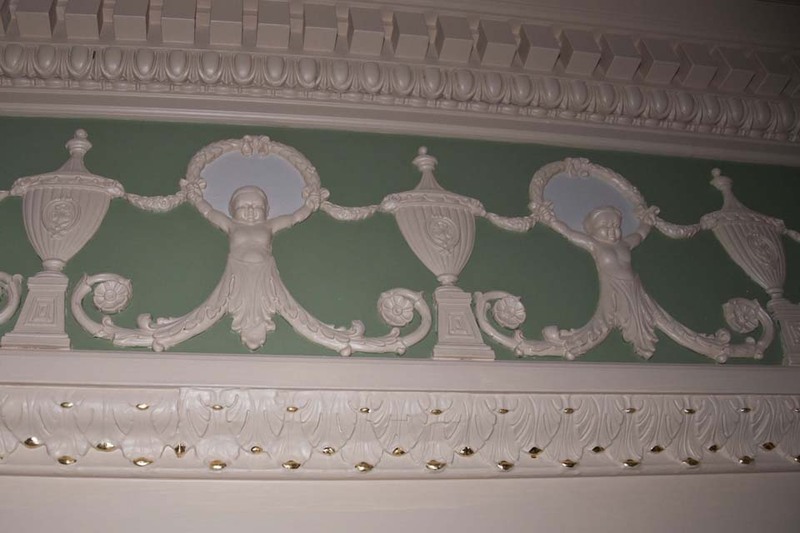 Protection of historic areas. 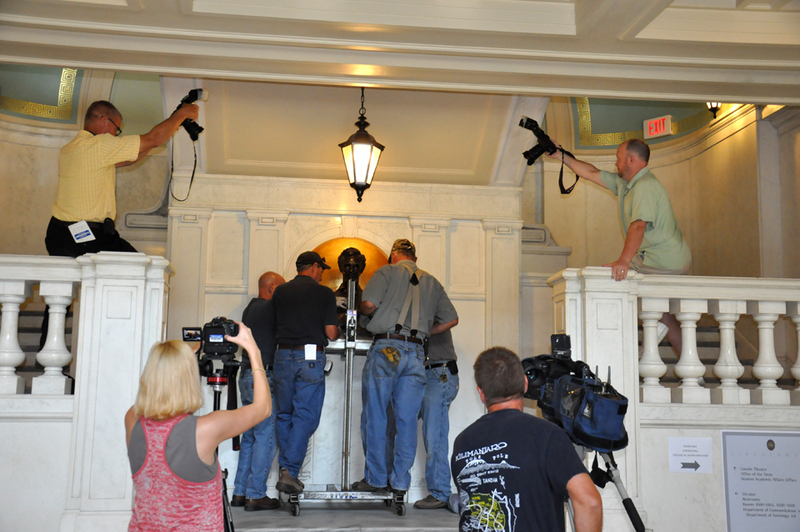 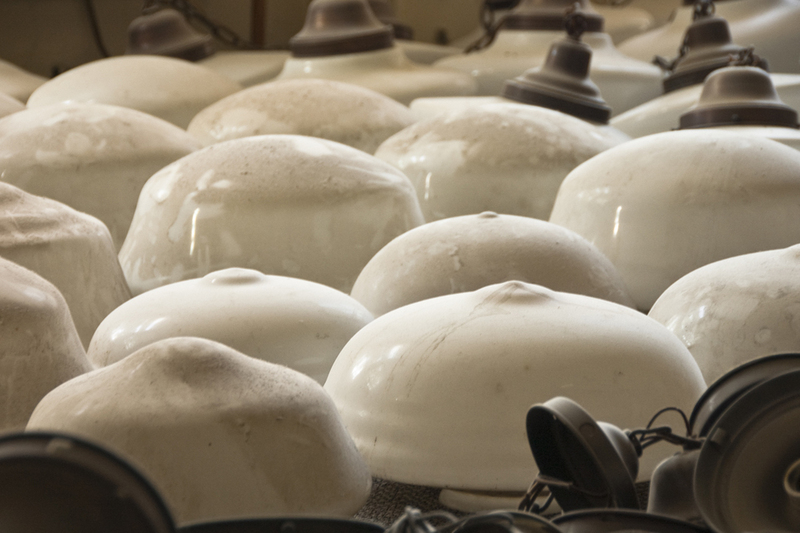 Removal of historic fixtures. 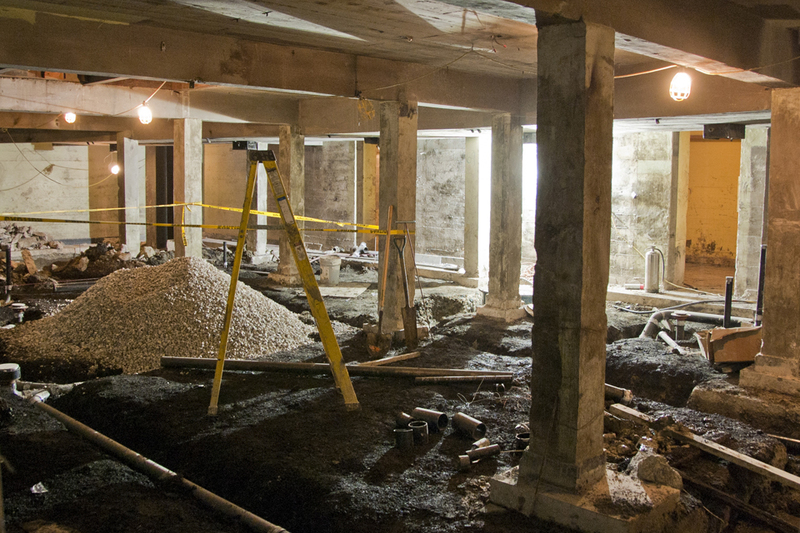 Demolished pipes in the basement and removed lights. 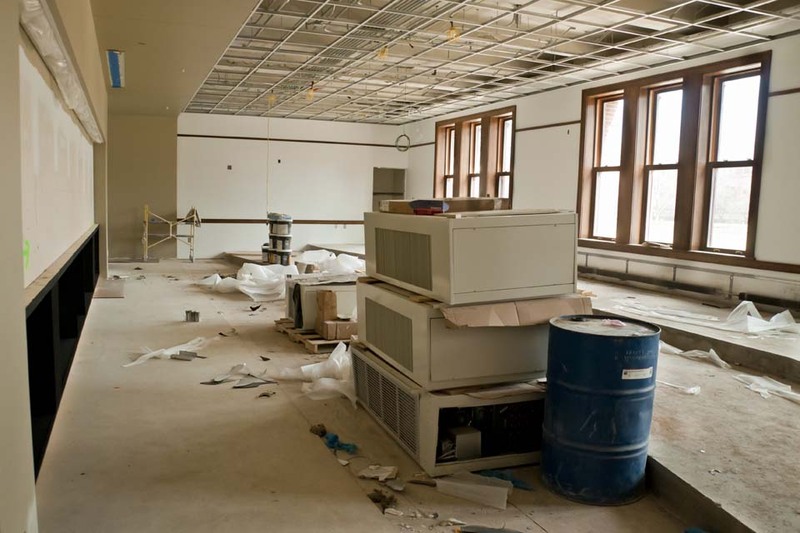 Knocked down walls and removed ceilings on the 4th floor. 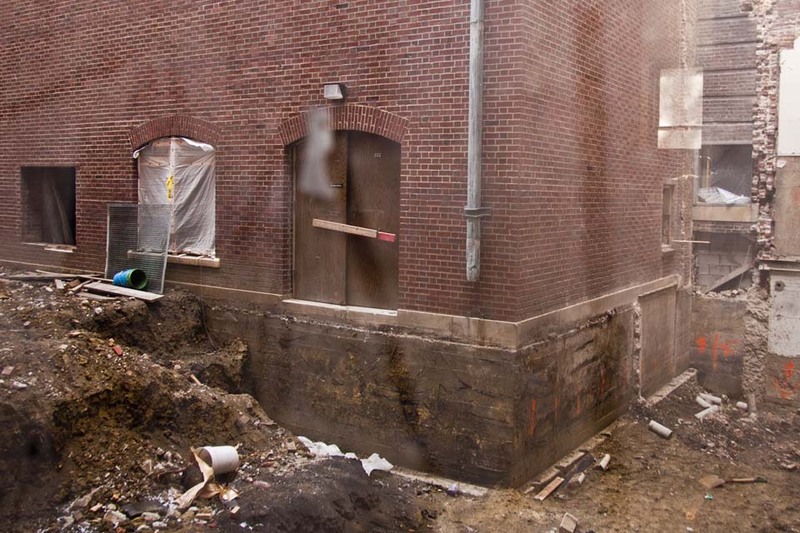 Completed laydowns and preliminary demolition.